Note: The Stell kirkyard is also known as Kirkchrist kirkyard. 001 As will be seen by the photo, this stone has the top section missing. The inscription below is all that remains. The stone appears to have been moved near to the gate many years ago, where it now remains propped against the boundary wall. .... John Geddes, who died at same place, 20th July 1844, aged 72 years. Also his sister Agnes, who died at Damhill 12th Jan’y. 1852, aged 49 years. 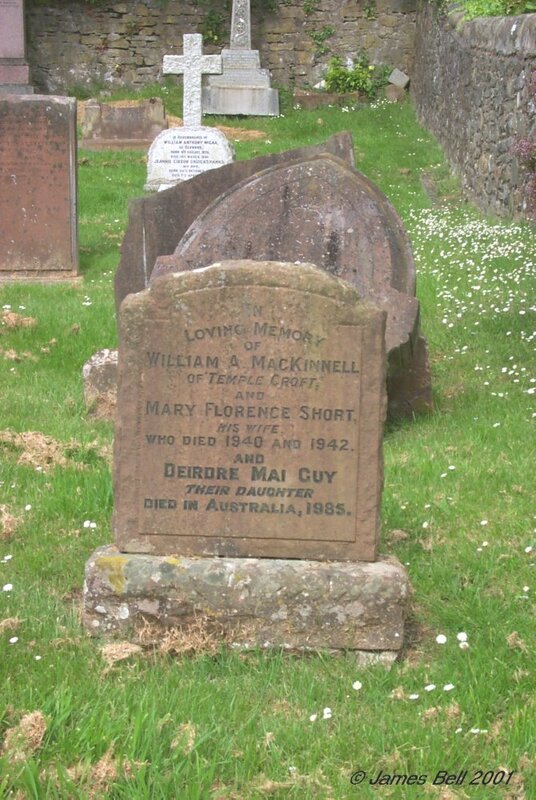 Also his sister Margaret McKay, who died at Duneden 24th April 1870, aged 60 years. 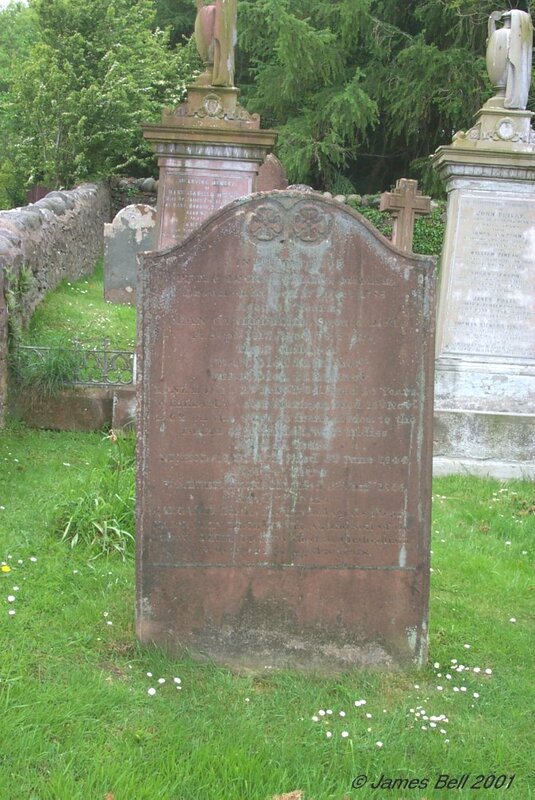 The above William Geddes, late of Kirkcudbright, died at Thornhill, 9th July 1884, aged 78 years. 002 In loving memory of Isabella Lorimer, beloved wife of William James Patterson, who died at Kirkchrist Dairy, 12 August 1944, aged 73 years. Also Mary, their daughter, who died in infancy. Also the above William J. Patterson, died at Kirkchrist Dairy, 22 Jan 1951, in his 78th year. 003 In loving memory of William Belford, younger son of John and Mary Belford, The Stell, Kirkcudbright, died at the Royal Infirmary, Dumfries, 24th August 1939, aged 34 years. Also the above John Belford, who died at The Stell, 17th March 1942, aged 69 years. 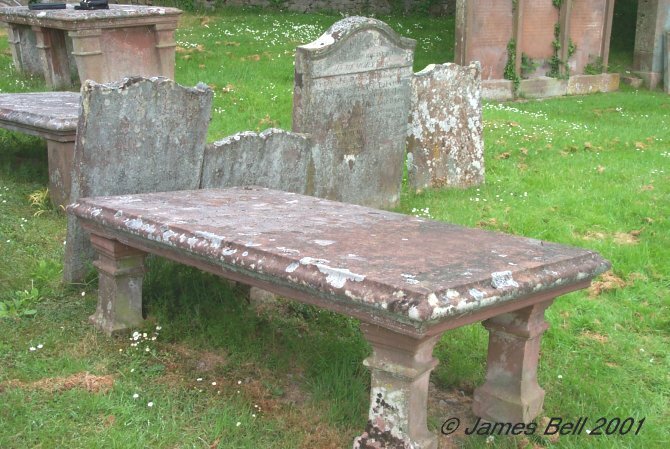 And the above Mary Belford, who died at Dumfries 28th Dec. 194(3), aged 80 years. 004 Erected by John McQuaide, in memory of his wife, Bridget Fitzpatrick, who died 26th Feb’y. 1861 aged 48 years. 005 Erected by Edward Laidlaw, in memory of his mother, Euphemia Bell, who died 13th August 1850, aged 61 yrs. Also his sister Ann Laidlaw, who died 10th July 1893, aged 69 years. Also his son Edward, who died 6th July 1858, aged 5 years. Also his daughter (name missing in broken piece) died 10th Nov’r. 1862, aged 7 years and 6 months. Also the above Edward Laidlaw, who died at Alexandria, Egypt, 15th August 1866, aged 45 years. Also Christopher Laidlaw, his father who died 10th Nov’r. 1875, aged 92 years. Also Margaret McKay, widow of the above Edward Laidlaw, who died at Liverpool, 6th Oct. 1890, aged 59 years. Also John, their son who was lost at sea, Nov. 1881 aged 31 years, and of his two children, who died in infancy. 006 Erected in memory of William Sibbald, who died at Castle Sod, 11th of June 1854 aged 72 years. 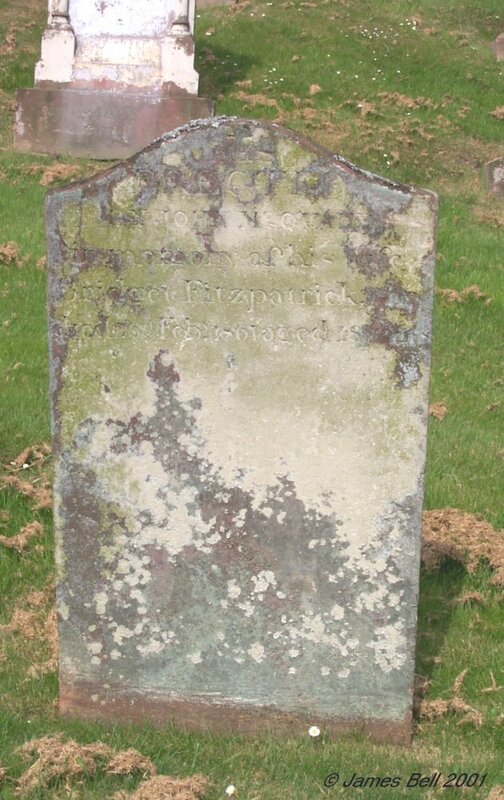 Also his wife, Mary Nicolson, who died at Dolphston, 17th of January 1833, aged 50 years. Also their son, Cornelius Sibbald, who died at Castle Sod, 3rd April 1884, aged 70 years. 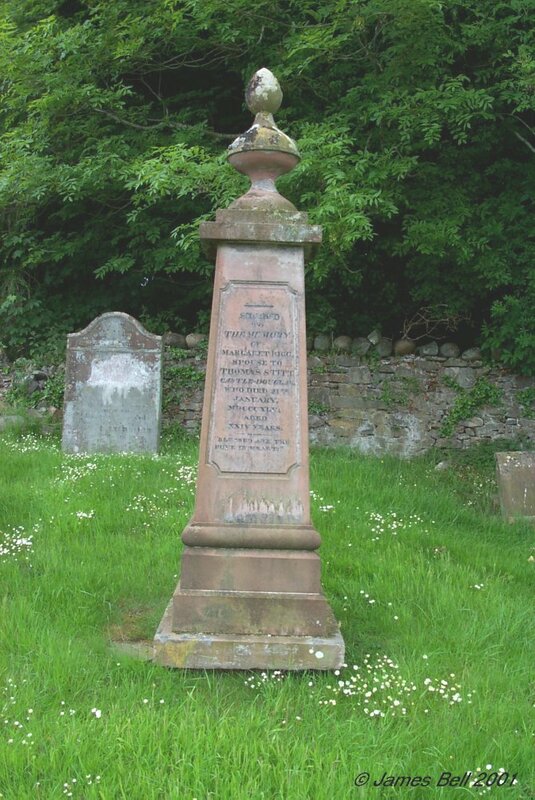 007 Erected by William Wason, blacksmith, in memory of Jannet, his daughter, who died at Bank of Bishopton, 15th Nov’r. 1844, aged 19 years. Also William, his son who died 22nd June 1846 aged 22 years. 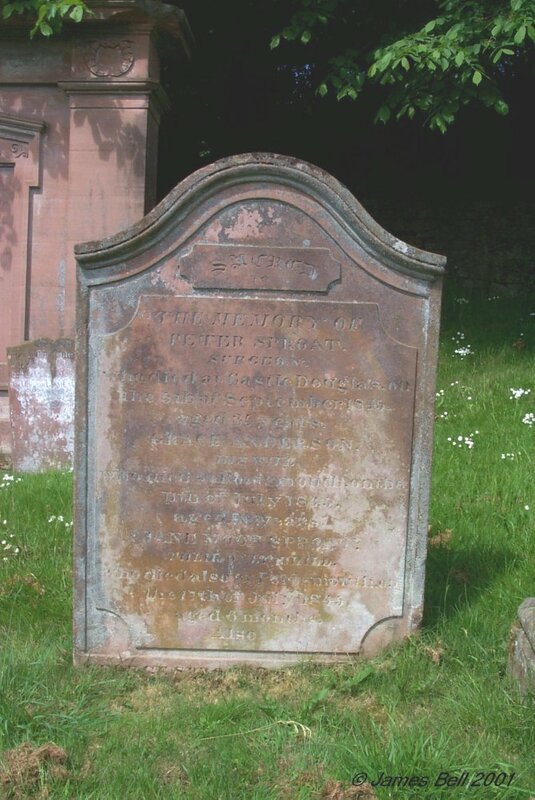 Also Peter, his son, who died 8th of June 1849 aged 21 years. Also Mary, his daughter, who died the 30th June 1852, aged 22 years. 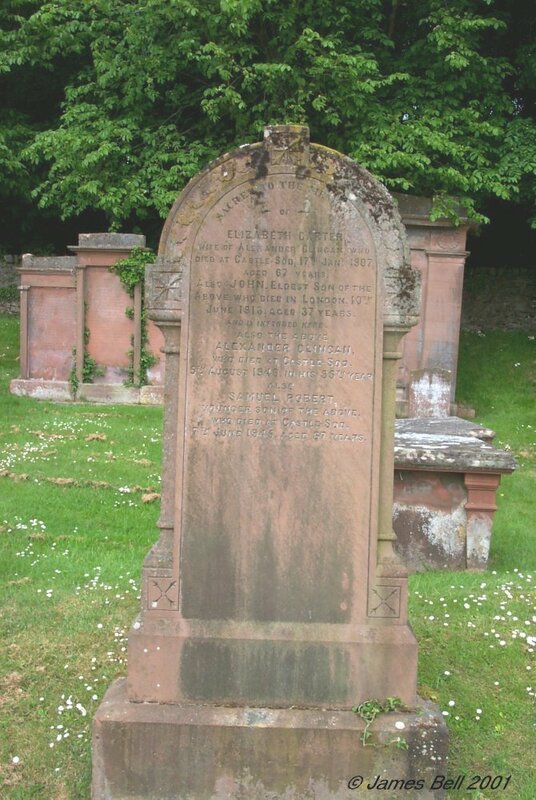 Also Helen, his daughter, who died at Kirkcudbright 12th November 1856, aged 22 years. Also Anne, his daughter, who died 20th January 1858, aged 21 years. 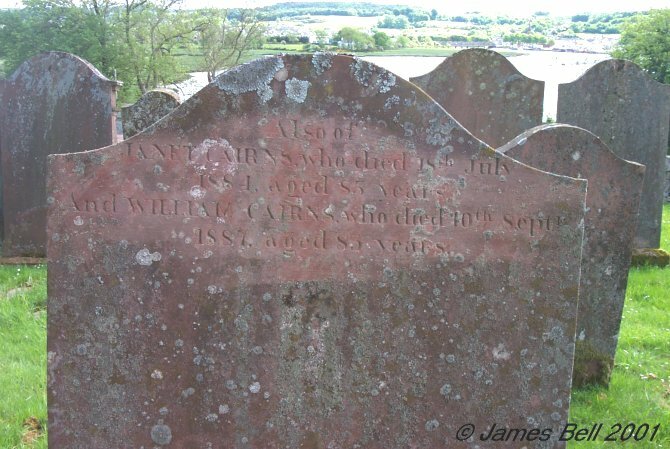 The above William Wason, who died at Kirkcudbright, 11th August 1861, aged 59 years. 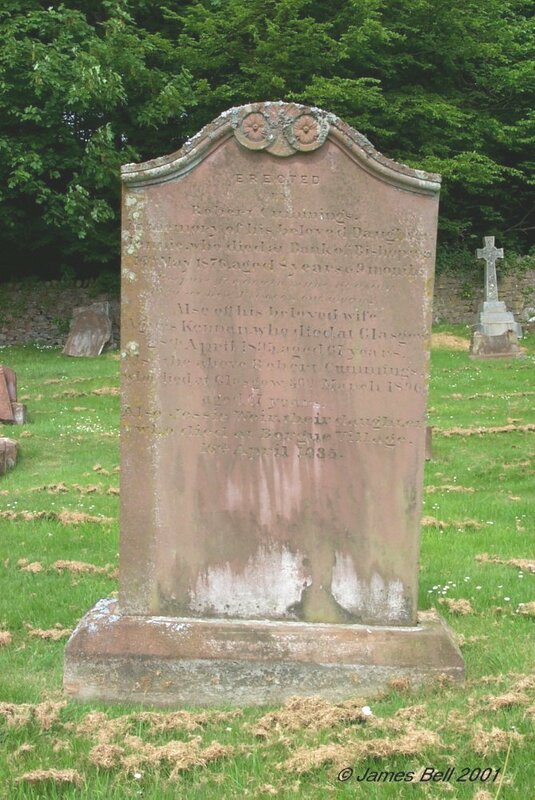 Agnes, his daughter, died at Kirkcudbright, 16th July 1862, aged 23 years. 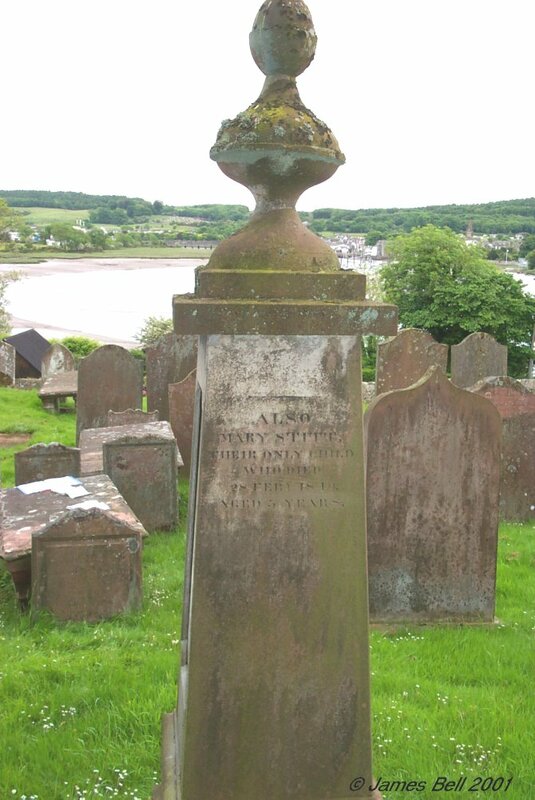 Alezabeth, his daughter, wife of Andrew Smail, died at Kirkcudbright, 3rd Feb'y 1862, aged 30 years. Elizabeth Kingan, wife of the above William Wason, died 1st Sept. 1866, aged 70 years. 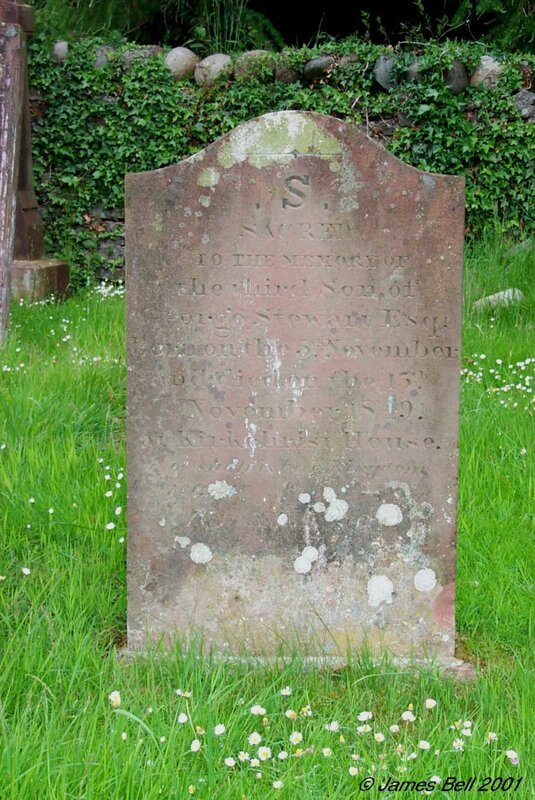 Reverse: In memory of Isabella Smail, granddaughter of William Wason, who died 1st January 1859, aged 1 month. 008 In memory of John McGuffog, who died at Furbur of Kelton, 20 December 1840, aged 86 years. 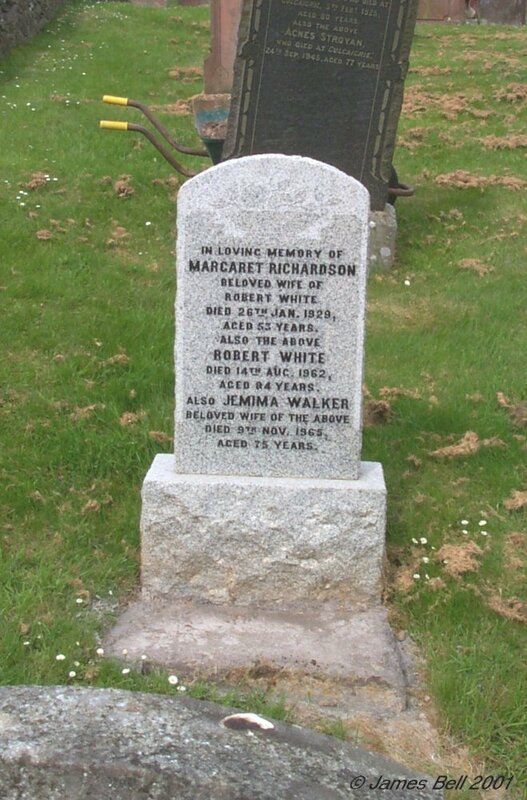 And Mary Wilkison, his wife who died at the same place, 4 March 1837, aged 71 years. Also John Chambers, their grandson, who died at Newton of Anwoth, 5 December 1827, aged 11 years. 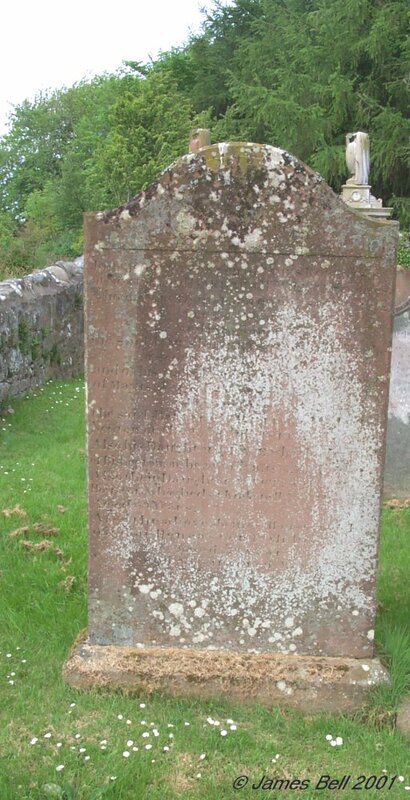 And Robert McGuffog, their son, who died at Auchenlarie of Anwoth, 18 March 1858, aged 62 years. 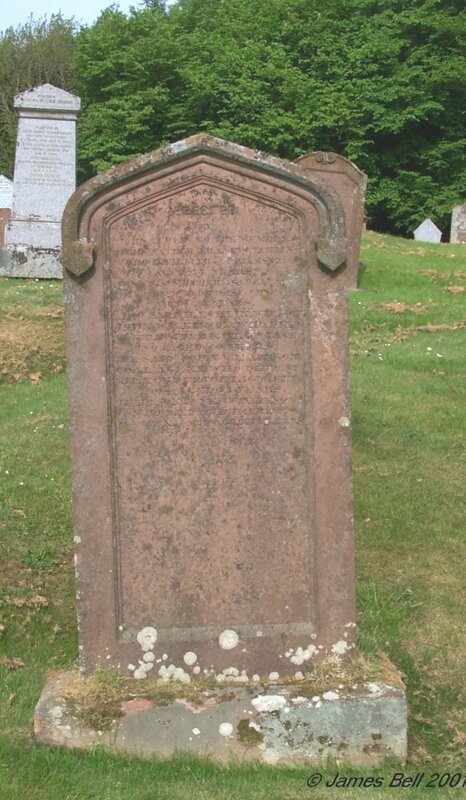 Also Elizabeth Carson, wife of John McGuffog, Auchenlarie, who died 21 January 1874, aged 70 years. And Robert McGuffog, their youngest son who died at Gatehouse, on the 18th May 1876 aged 30 years. And John McGuffog their eldest son, who died at Gatehouse 21st May 1876, aged 43 years. and interred here. 009 Erected by William Stewart, brewer, Kirkcudb't, in memory of his wife Marg’t McCaul, who died 12th June 1847, aged 64 years. William, his son, who was lost at sea, March 1854, aged 26 years. Marg’t, his grand-daughter, died 26th Dec’r. 1855 aged 7 years. Also the above William Stewart, who died at 34 Fairfield Street, Fairfield, Liverpool, Feb.2 1881, aged 97 years. 010 In loving memory of Mary Jane, only daughter of Samuel and Mary McKie, who died at Campbelton Cottage, Twynholm, 3rd December 1911, aged 8 years and 6 months. In proud and ever loving memory of Pte. John McKie, A & S.H., their 4th son, killed in action in France, 15th May 1917, aged 22 years. Greater love hath no man, than this, that he lay down his life for his friends. 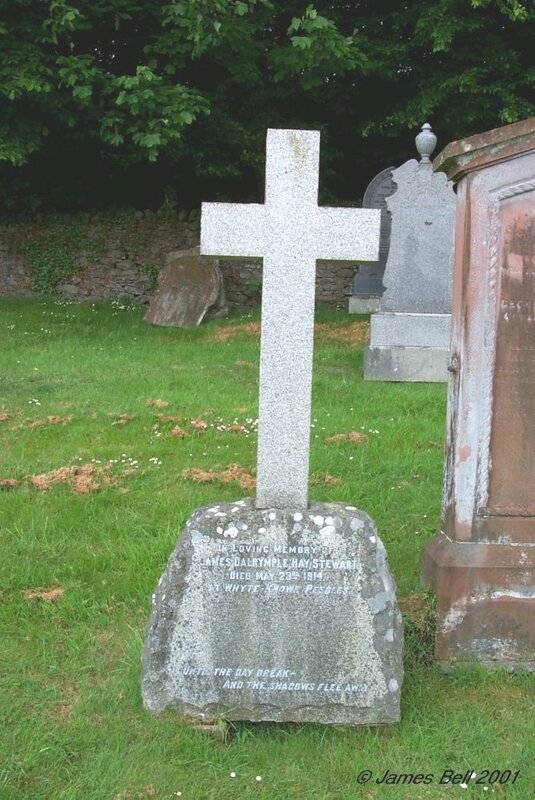 Also William McKie, their son and dearly beloved husband of Janet McClellan, died at Culdoach Road, Tongland, 28th September 1923, aged 34 years. Thy will be done. 011 Erected by John Echlin, to the memory of his father, Francis Echlin, who died 14th April 1862, aged 77 years. Also his mother, Isabella McCutcheon, who died 1st July 1864, aged 76 years. 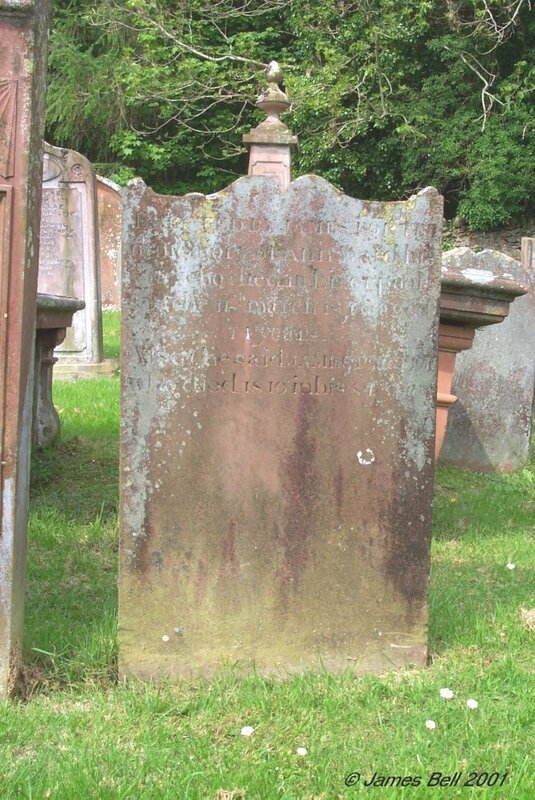 Also Sarah Echlin, wife of John Wilkinson, who died at Kirkcudbright, 6th Nay 1895, aged 60 years. The said John Wilkinson, coal agent, who died at Kirkcudbright, 16th Feb. 1908, aged 75 years. 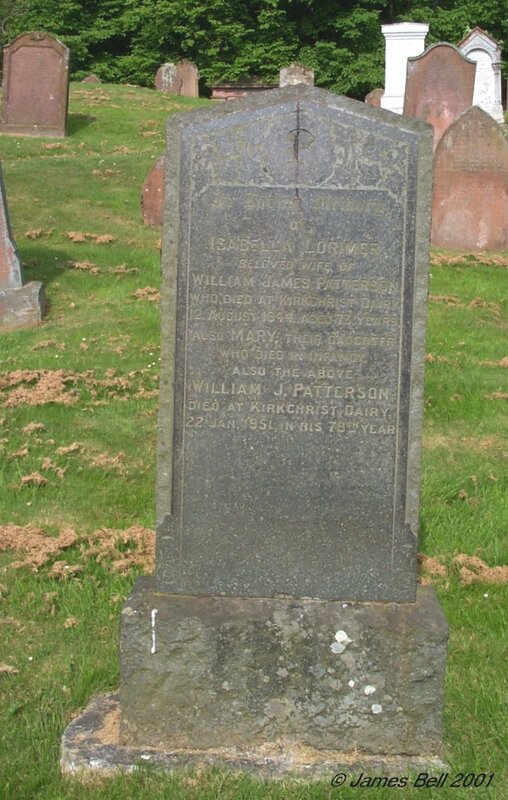 Their son James Wilkinson, who died at Dumfries, 15th Jan. 1934, aged 75 years. 012 Erected by Elizabeth Houston in memory of Alexander Houston, her husband, who died at Gatehouse, 8th July 1901 aged 85 years. 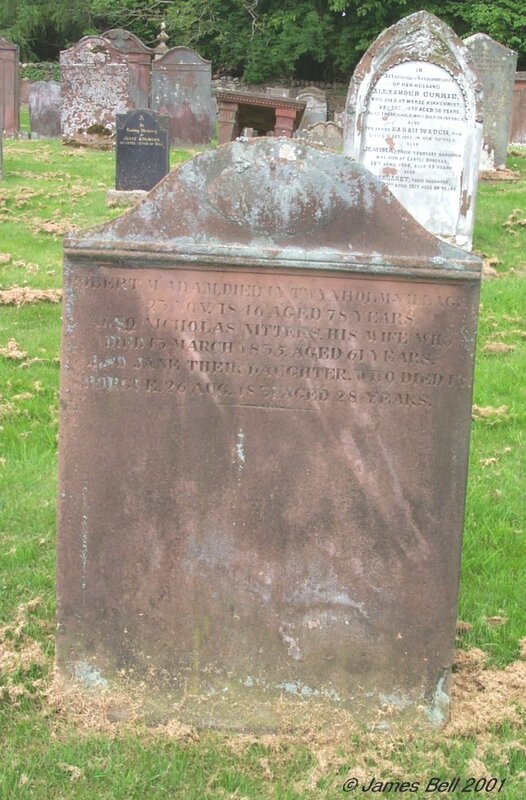 Also Alexander, their son, who died at Kirkeoch, aged 6 years. 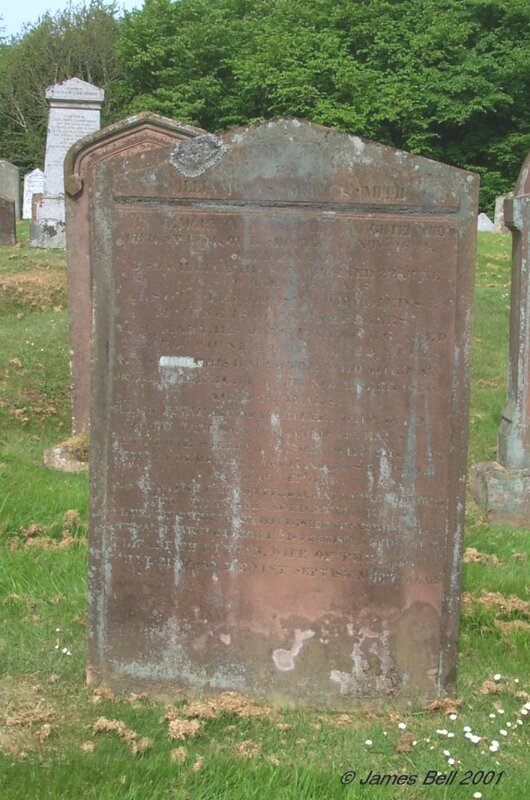 Also Mary Houston, wife of Thomas Archer, died at Greenock, 25th August 1906, aged 56 years. Also the above Elizabeth Houston, who died at Gatehouse, 30th July 1913, aged 87 years. 013 Erected by William Guthrie in memory of William, his son who died 28th May 1853, aged 6 months, Euphemia, his daughter died 6th April 1856, aged 9 months, Margaret his daughter, died 28th Aug. 1862, aged 18 years, also of his son who died in infancy. 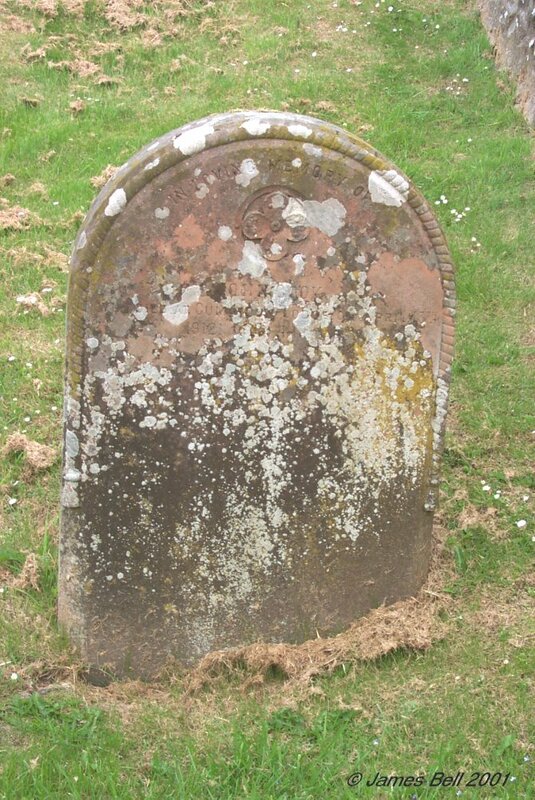 Also Janet Laidlaw, wife of the above who died 5th July 1870 aged 58 years. Also the above William Guthrie, who died 19th Oct. 1901, in his 86th year. Also Elizabeth Calder, his wife, who died 2nd Sept. 1915, aged 79 years. 014 Erected by William Maltman in memory of Mary Kirk, his wife, who died at Kirkcudbright March 12th 1879, aged 70 years. His two grandchildren who died in infancy. Also the above William Maltman, who died 30th Dec'r 1891, aged 75 years. Also his daughter Mary, who died at Millburn Street, 20th May 1911, aged 67 years. Sadly Missed. Also his 2nd daughter Nicholas, who died 30th Jan. 1924, aged 83 years. 015 Erected by Samuel McNaly, in memory of his wife Elizabeth McGregor, who died 10th Aug. 1866, aged 59 years. Also his spouse Janet Gourlay, who died at Little Sypland 17th April 1874, aged 58 years. 016 In loving memory of James Thomson, died at Low Nunton, Twynholm, 4th Jan. 1906, aged 82 years. 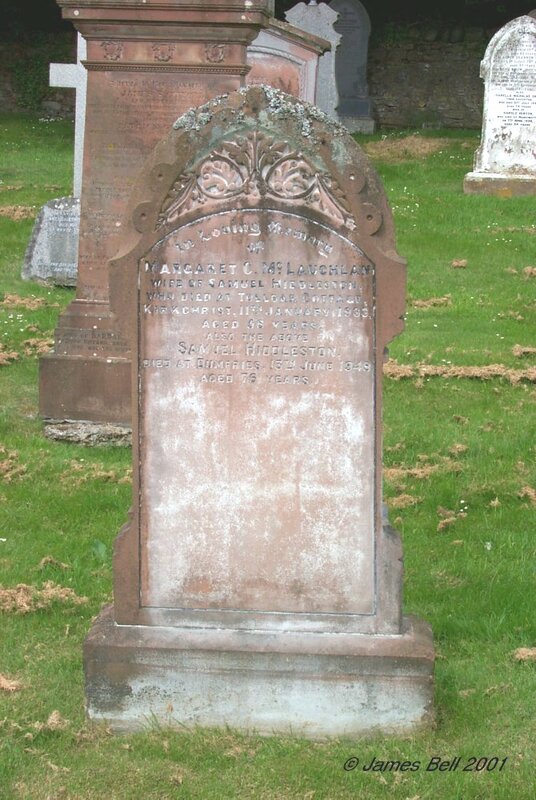 Mary Milligan, his wife, died at same place, 12th Nov. 1904, aged 75 years. Jane Thomson, their third daughter died at Rascarrel, Rerrick, 28th April 1872, aged 17 years. Joseph Thomson, their son died in infancy. Agnes Jane Thomson, their youngest daughter died at Low Nunton, Twynholm, 3rd Oct. 1906, aged 32 years. 017 Unfortunately, this stone has fallen on its face and is unreadable. The inscription given is taken from the survey carried out by the Manpower Services Commission. In memory of Elizabeth McDowall wife of Adam Black, who died at High Newton, 19th April 1903, aged 44 years. 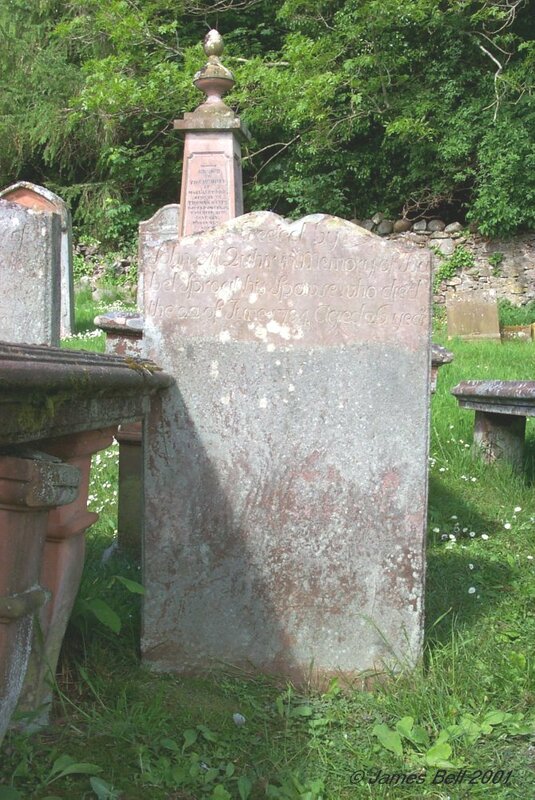 Maggie Black, their daughter, died at Haes, Auchencairn, Jan. 29 1890, aged 3 years. David Black, their son, who died in infancy. Mary Black, their daughter, died at Western Infirmary, Glasgow, 1st July 1905, aged 21 years. The said Adam Black, who died at Meiklewood Cottage, Tongland, 14th March 1915, aged 59 years. Gordon Black, their eldest son who died in London, 31st May 1970, aged 82 years. 018 In loving memory of Robert Craig who died at Cumstoun Mains, 8th May 1900 aged 45 years. Also John Andrew Lauchlan, son of Robert and Marget Lauchlan, and grandson of the above who died at 78 Cotton Street, Castle Douglas, 16th July 1929, aged 11 months. Also Agnes Currie, relict of the above Robert Craig, who died at Harold Wood, Essex, 31st Dec. 1940 aged 80 years, and is interred here. Also John Currie Craig, son of the above Robert Craig, who died at Bishopton, 8th June 1944, aged 46 years. Also John Desmond Craig, Sergt. R.A.F., son of the said John C. Craig, lost on air ops. over Germany, 1st Feb. 1945, aged 19 years. Interred in Leuterschausen Cemetery. 019 Erected by John Currie, in memory of his wife Agnes Gilmour, who died at Bishopton, 1st November 1898 aged 76 years. 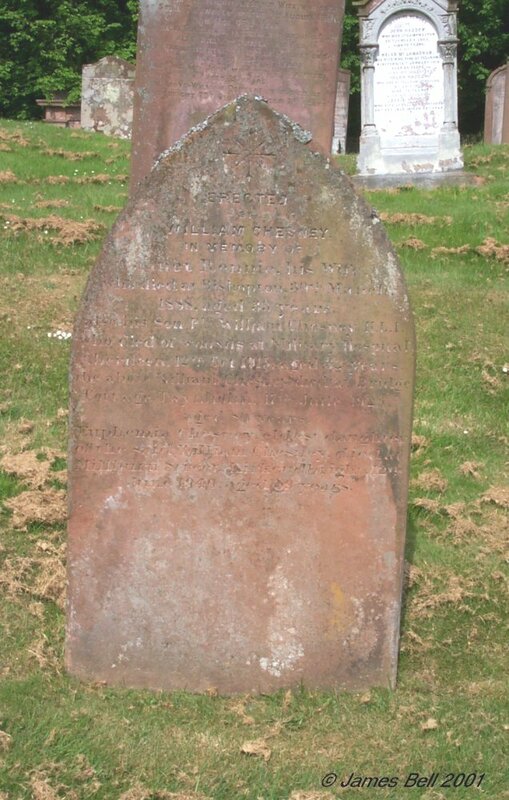 And William, their son, who died at Kirkeoch, 13th November 1863, aged 5 years. Also the above John Currie, who died at Bishopton, 25th May 1915, aged 84 years. 020 Erected by William Chesney, in memory of Janet Rennie, his wife, who died at Bishopton, 30th March 1888, aged 33 years. Also his son Pte. William Chesney, H.L.I., who died of wounds at Military Hospital, Aberdeen, 12th Oct. 1915, aged 32 years. 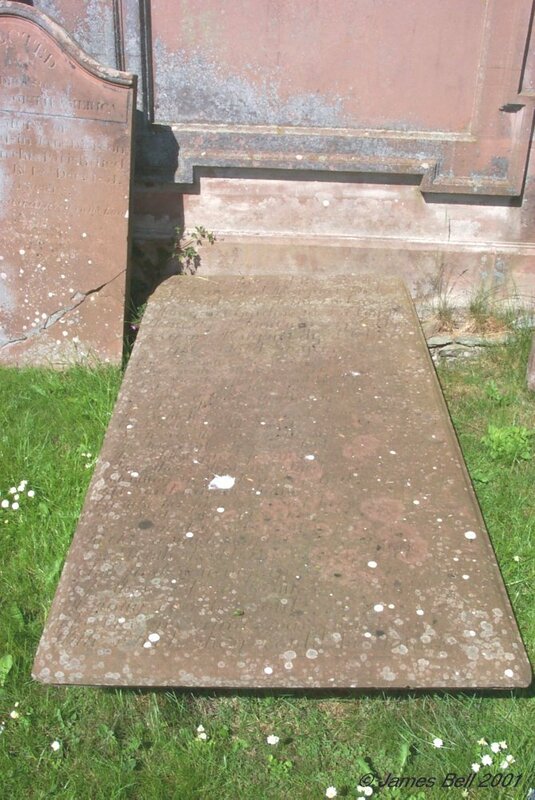 The above William Chesney, died at Bridge Cottage, Twynholm, 17th June 1925, aged 80 years. 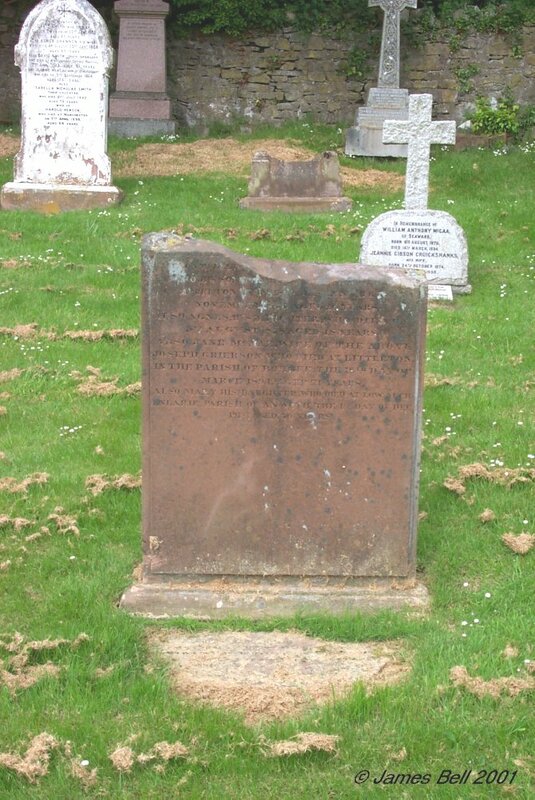 Euphemia Chesney, eldest daughter of the said William Chesney, died at Millburn Street, Kirkcudbright, 12th June 1940, aged 59 years. 021 Erected by David Findlay, in memory of his son John, who was accidentally killed at Troon Station, 6th January 1891, aged 23 years. 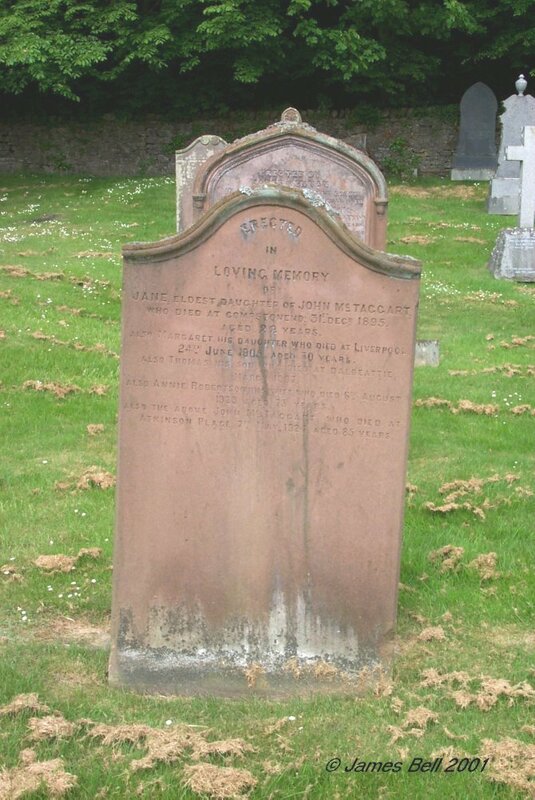 Also the above David Findlay, who died at Kirkeoch 21st March 1900, aged 59 years. 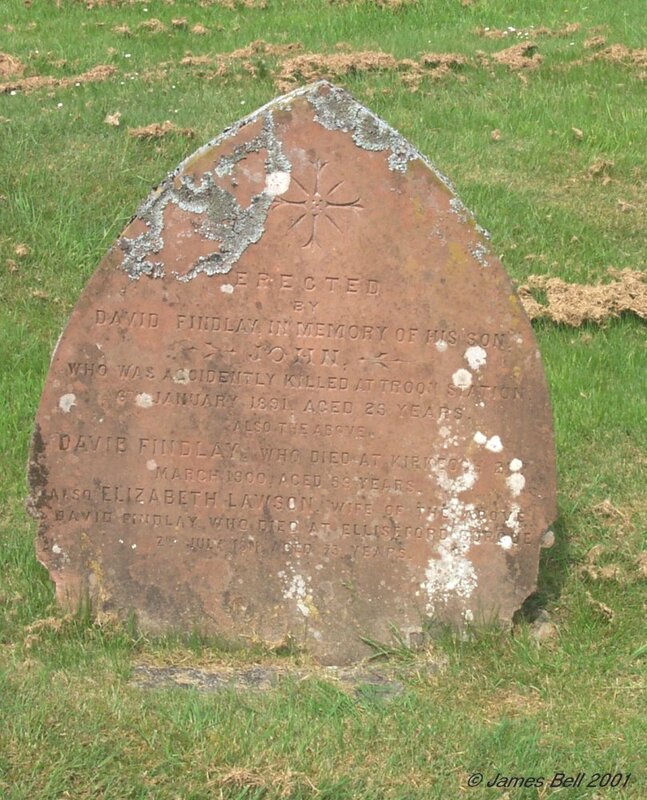 Also Elizabeth Lawson, wife of the above David Findlay, who died at Elliseford, Borgue, 2nd July 1911, aged 73 years. 022 This small gravestone relates to Grave #23. 023 In memory of Robert McCormick, who died at Nun Mill, 28th May 1871 aged 67. 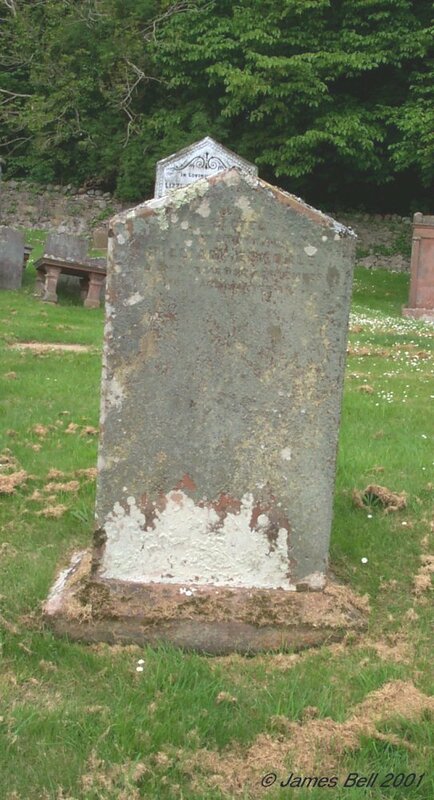 Margaret, his daughter, wife of David Manson, died at Girthon Kirk, 21st March 1863 aged 27. 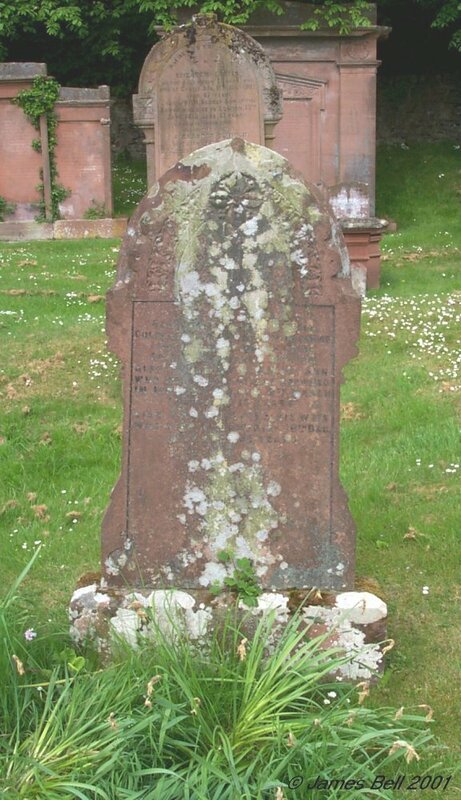 Ann his daughter, who died at Kirkcudbright, 16th September 1898, aged 53 years. 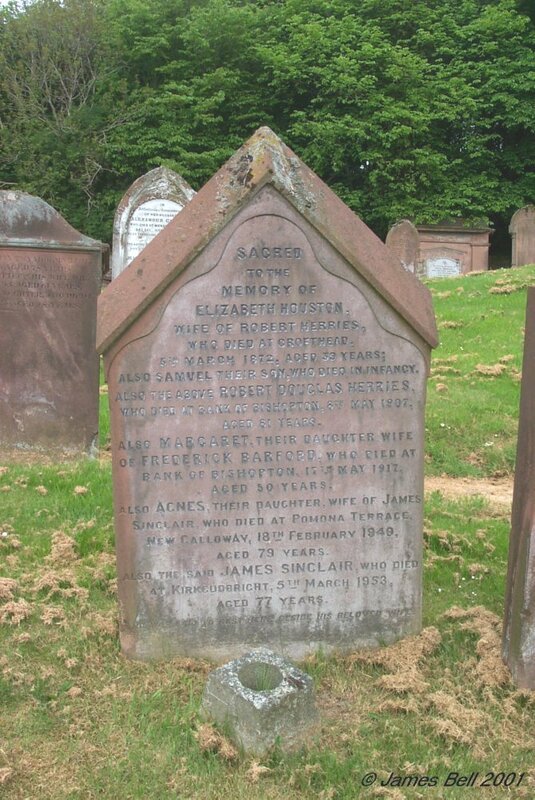 Agnes Fowler, wife of the above Robert McCormick, who died at Kirkcudbright, 3rd May 1903, aged 89 years. 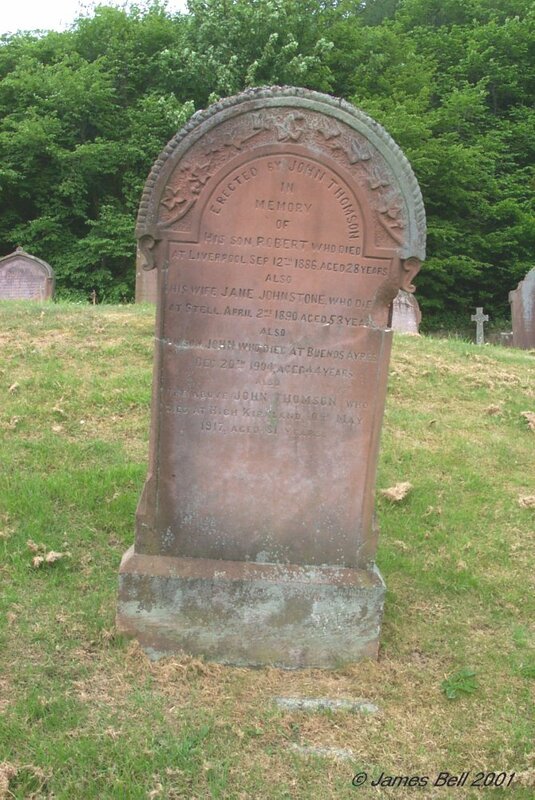 Janet Fergusson, wife of William McCormick, died 8th April 1912, aged 74 years. The said William McCormick, who died on the 25th March 1917, aged 80 years. Agnes Roots, daughter of Janet and William McCormick, who died on the 28th December 1944, aged 82 years. 024 In loving memory of Janet McTaggart, wife of Alexander McLellan, who died at Tongland Bridge 25th Dec. 1926, aged 69 years. Also Robert McLellan, their son, who died at Bishopton, 31st March 1911, aged 32 years. Also their three sons killed in action in France; Alexander, 25th April 1916, aged 25 years; David, on 25th September 1915 aged 23 years; Rowat, on 7th Oct. 1918, aged 21 years. 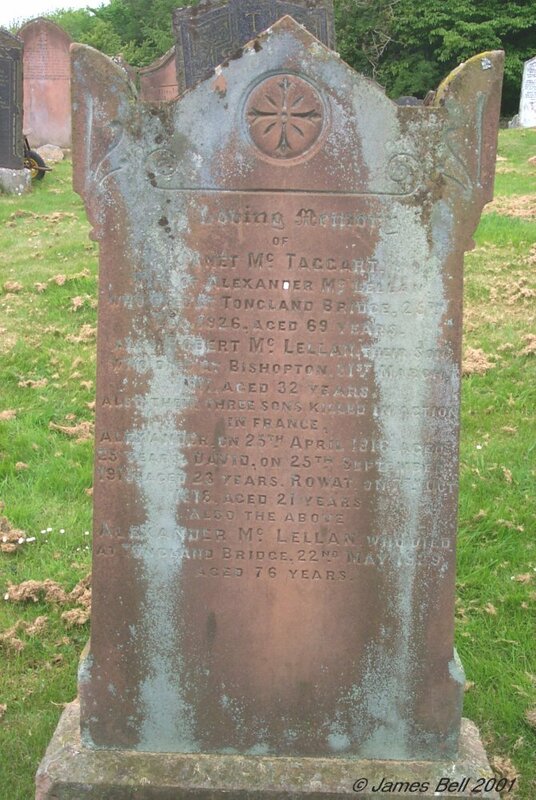 Al;so the above Alexander McLellan who died at Tongland Bridge, 22nd May 1929, aged 76 years. 025 In loving memory of Stewart Hannah, wife of Alexander McCaig, died 13th Nov'r 1927, aged 72 years. Also the above Alexander McCaig, died at Lochhill, Crossmichael, 21st Jan. 1959, aged 89 years. 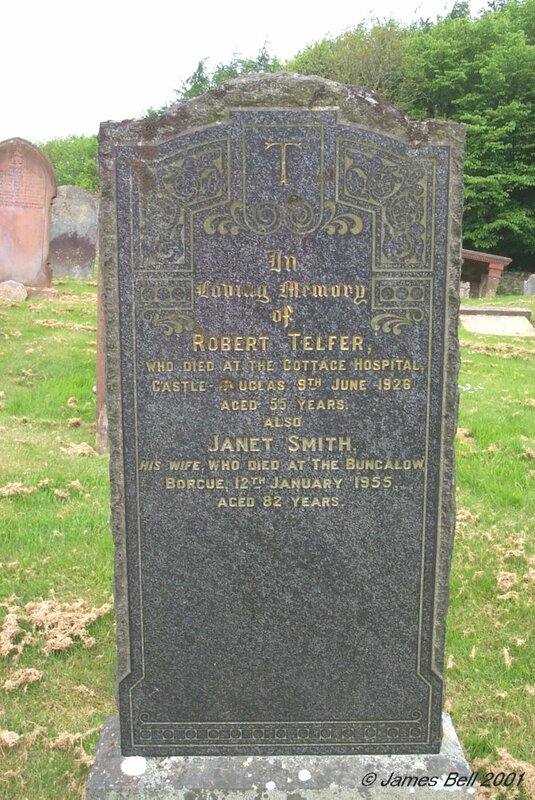 026 In loving memory of Robert Telfer, who died at the Cottage Hospital, Castle Douglas, 9th June 1926, aged 55 years. Also Janet Smith, his wife, who died at The Bungalow, Borgue, 15th January 1955, aged 82 years. 027 Sacred to the memory of Elizabeth Houston, wife of Robert Herries, who died at Crofthead, 5th March 1872, aged 39 years; also Samuel their son, who died in infancy. Also the above Robert Douglas Herries, who died at Bank of Bishopton, 8th May 1907, aged 81 years. Also Margaret, their daughter, wife of Frederick Barford, who died at Bank of Bishoton, 17th May 1917, aged 50 years. Also Agnes, their daughter, wife of James Sinclair, who died at Pomona Terrace, New Galloway, 18th February 1949, aged 79 years. 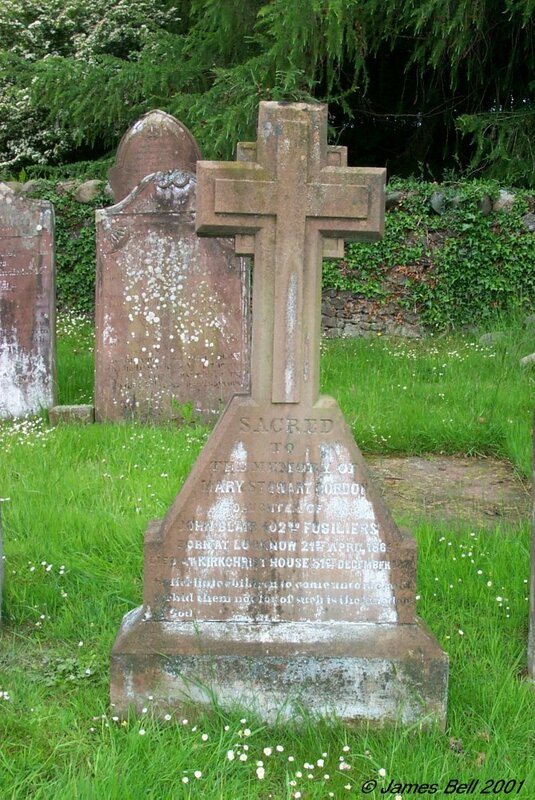 Also the said James Sinclair, who died at Kirkcudbright, 5th March 1953, aged 77 years. 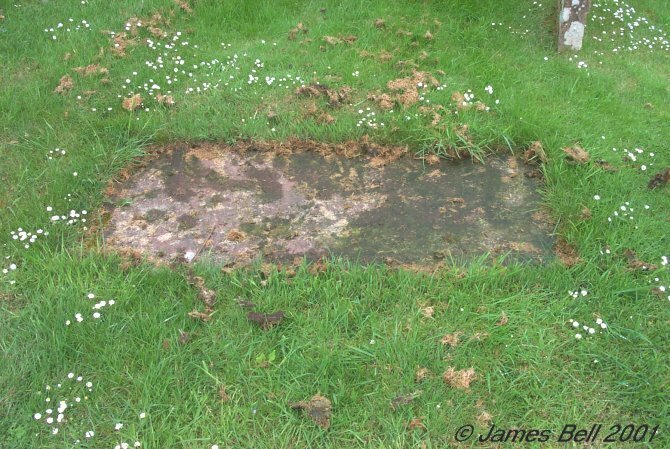 And was laid to rest here beside his beloved wife. 028 Sacred to the memory of Samuel Herries, who died at Newton, 12th April 1839, aged 56 years. 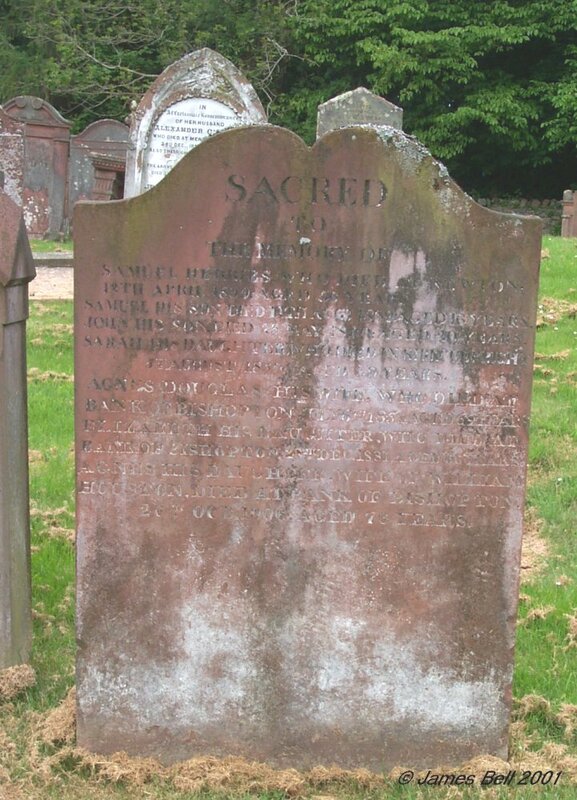 Samuel, his son, died 12th Aug. 1839, aged 16 years. John his son, died 23 May 1840, aged 20 years. 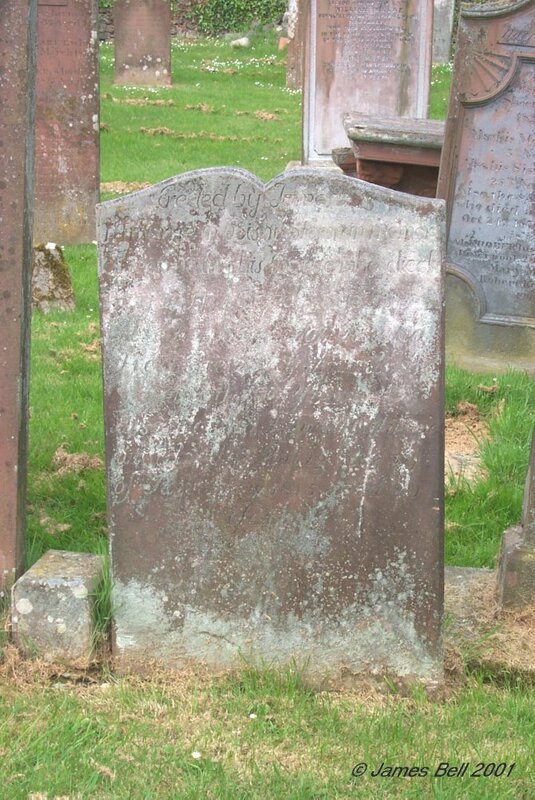 Sarah, his daughter, who died at Kirkcudbright 5th August 1850, aged 39 years. Agnes Douglas his wife, who died at Bank of Bishopton, July 6th 1854, aged 69 years. 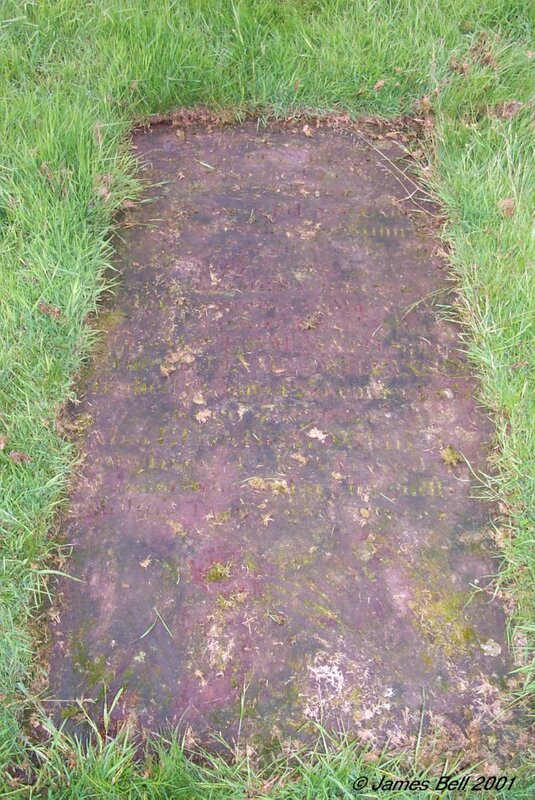 Elizabeth his daughter, who died at Bank of Bishopton, 28th Dec. 1881, aged 66 years. Agnes his daughter, wife of William Houston, died at Bank of Bishopton, 26th Oct. 1906, aged 76 years. 029 Erected by John Herris in memory of his wife Agnes Sloan who died at High Newton 2nd March 1842 aged 78 years. 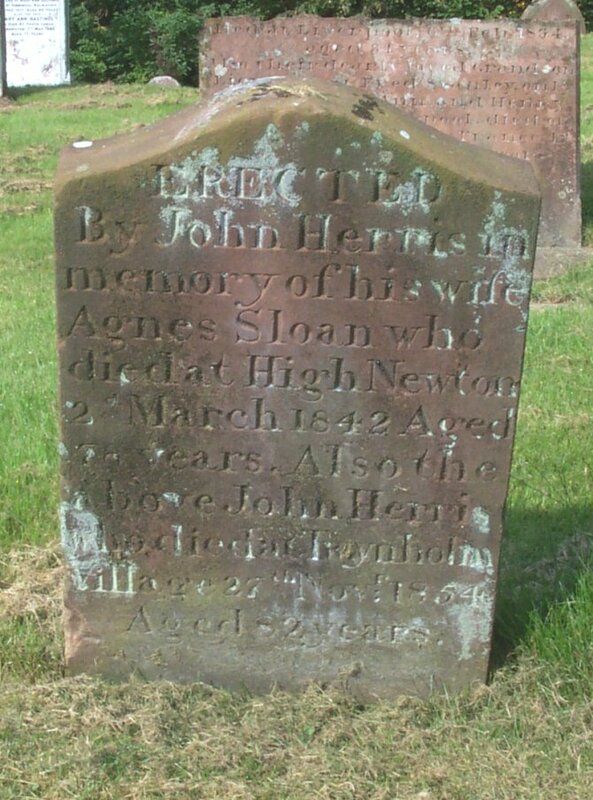 Also the above John Herris who died at Twynholm Village 27th Nov. 1854 aged 82 years. 030 Erected by James and William Murray in memory of James Murray, their father, who died at Palnackie, 21st March 1890, aged 72 years. Jessie Murray, their mother, who died 29th February 1864, aged 46 years. John their brother, who was killed in Montevido, S.A. 10th December 1867, aged 17 years. James Murray, who died at Palnackie, 19th October 1898, aged 48 years. 031 Erected by William Douglas, in memory of Mary McQueen, his beloved wife, who died at Stell, Twynholm, on the 4th August 1896, in her 48th year. Also Janet Douglas, his daughter, who died in infancy. Also William Douglas, his son, who was accidentally killed on railway, on the 23rd July 1908, aged 21 years. Also his son, John who died at Wakefield, aged 35 years. 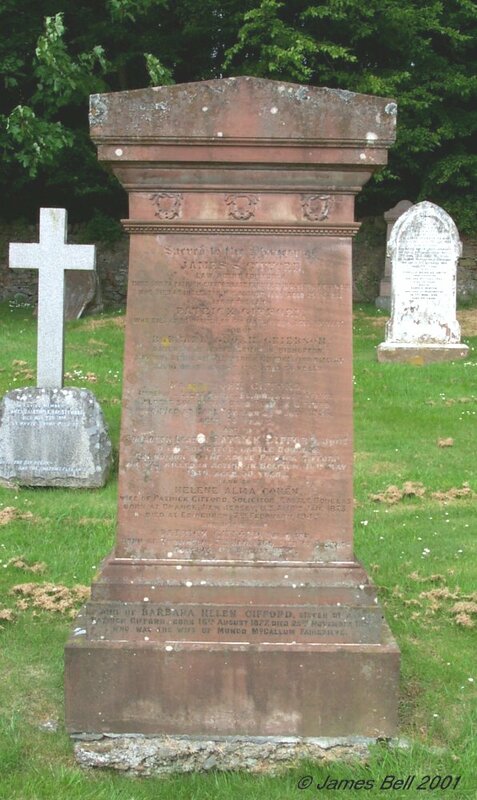 The above William Douglas, who died at Kirkcudbright, 20th Dec’r. 1920, aged 78 years. 032 Erected by James Bell, in loving memory of Catherine Cameron, his wife who died at Back Newton, 23rd August 1899, aged 46 years. Sleep on, beloved one, sleep on. 033 Erected by John Graham, in loving memory of his wife, Mary McCormack, died at Stell, 4th Oct. 1899, aged 38 years. Also their daughter, Jeannie, died at Stell, 1st Feb. 1901, aged 9 years. 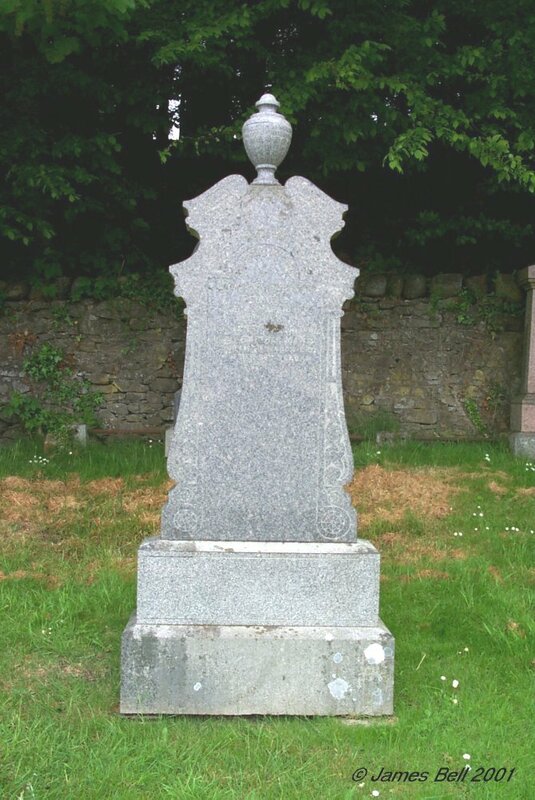 Susan, died at Courthill, Dalry, 10th Feb. 1920, aged 31 years. In loving memory of Margret Duffett, beloved daughter of John and Robina Graham, died at Glasgow, 6th May 1934, aged 30 years. Also the above John Graham, who died 18th Jan. 1944 aged 83 years. Also Robina McCulloch, his wife, who died 4th April 1946, aged 82 years. 034a In loving memory of John Cook who died at Cumstoun Lodge, on April 13th 1912, aged 44 years. 035 Erected by John Thomson in memory of his son, Robert who died at liverpool, Sep. 12th 1886, aged 28 years. 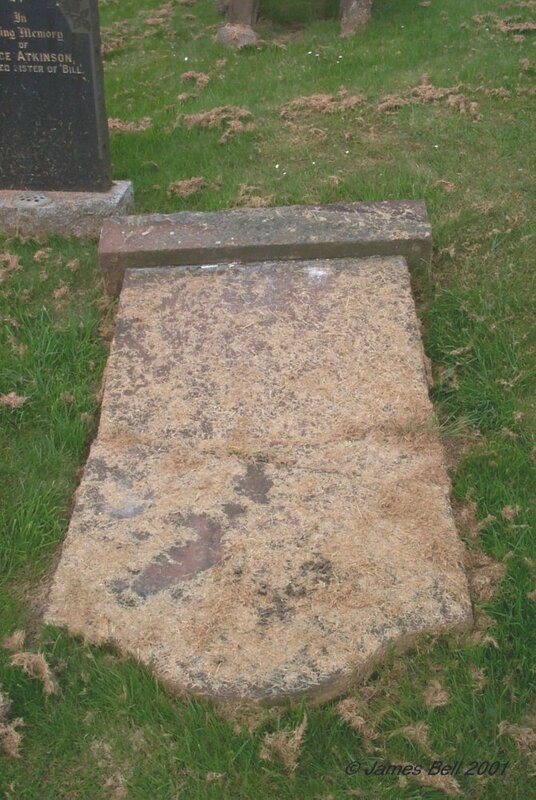 Also his wife, Jane Johnstone, who died at Stell, April 2nd 1890 aged 53 years. Also his son, John, who died at Buenos Ayres, Dec. 20th 1904, aged 44 years. Also the above John Thomson, who died at High Kirkland, 10th May 1917, aged 81 years. 036 Sacred to the memory of William Harper, who departed this life on the 1st January 1840, aged 47 years. And of Mary Bell, his spouse who died on the 6th June 1858 aged 52 years. 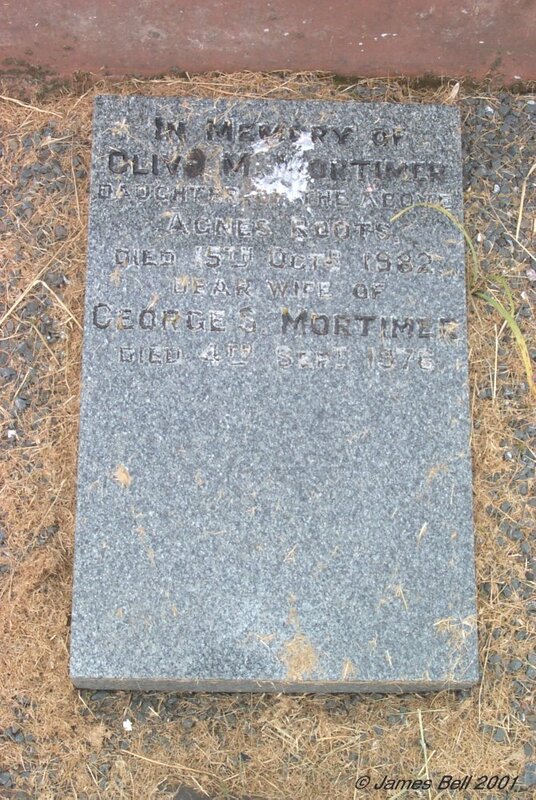 And George, their son, who died at Myrtle Creek, Australia, 1870, aged 35 years. And William, their son, who died at Kaneiri, New Zealand, 1897, aged 66 years. 037 As can be seen, this stone is broken and worn. The following inscription has been taken from that recorded by the Manpower Services Commission. 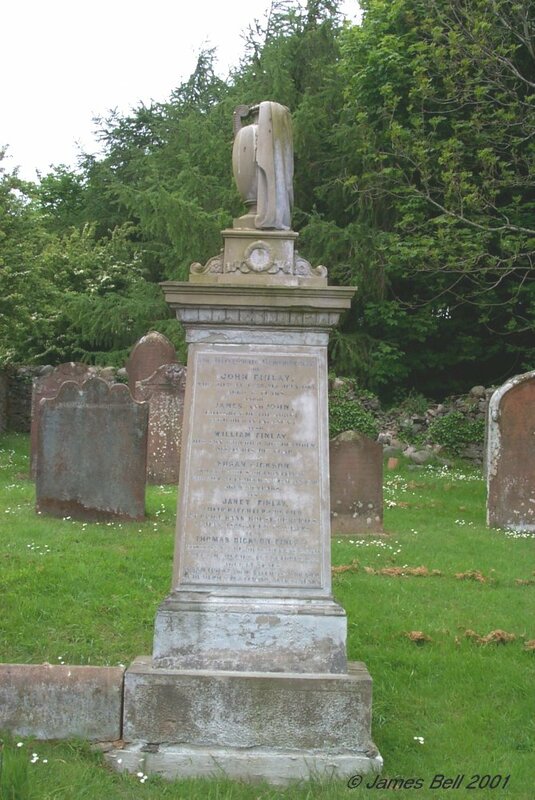 Erected by John McConnell, in memory of James his eldest son, who died at Trostrie, 31st December 1870, aged 19 years. Also the said John McConnell, who died 26th April 1898, aged 71 years. Also Elizabeth Macgregor, his wife, who died 29th January 1912, aged 82 years. God is Love. You will never know nor heed. Also Agnes, their elder daughter, wife of (name lost) who died at Liverpool, 6th Feb. 1894, aged 34 years. Also, their dearly loved grandson, Lieutenant Fred Stanley, only child of Mary Ann and Henry Thomas, of Liverpool, who died of wounds at Boulogne, France, 1st December 1918, aged 25 years. Safe in the arms of Jesus. 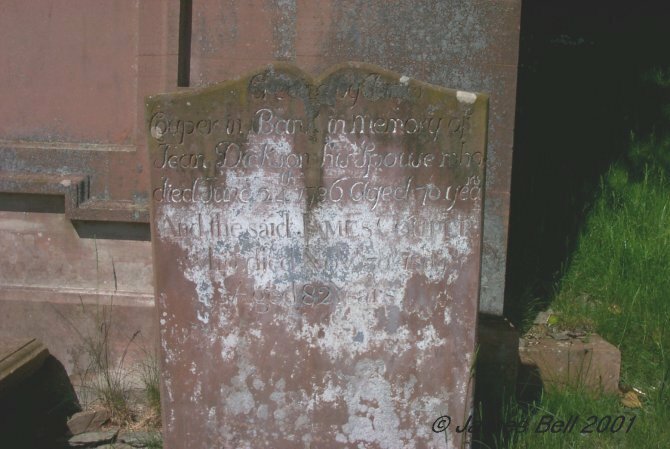 038 In affectionate memory of Ebenezer Carter, who died at Bank of Bishopton, April the 3rd 1870, aged 66 years. And his wife -------- Herries, who died January the 17th 1895, aged 80 years. And their son John Douglas, who died at Inverdee, 21st Nov. 1907, aged 57 years. Jeannie Johnstone Cowan, wife of the said John Douglas Carter, who died 13th August 1912 aged 61 years. 039 In memory of Robert McAdam, died in Twynholm Village, 23 Nov. 1846 aged 78 years. Also Nicholas Nitters his wife who died 13 March 1835, aged 61 years. Also Jane, their daughter who died in Borgue 26 Aug. 1831, aged 28 years. 040 Erected by Grace Kennedy, in memory of her husband, John McMath, who died at Boreland of Borgue 23rd Sept. 1874 aged 54 years. Also William, her son, died 12th Jan’y. 1859 aged 1 year . Also her mother, Marion Hall, died 21st Nov’r. 1871 aged 64 years. Also Francis Alfred John South, who died at High Newton, Twynholm, 25th August 1883, aged 10 weeks. The said Grace Kennedy, who died at Gelston, 4th September 1898 aged 72 years. 041 In loving memory of Margaret Richarson, beloved wife of Robert White, died 26th Jan. 1929, aged 53 years. Also the above Robert White, died 14th Aug. 1962, aged 84 years. Also Jemima Walker, beloved wife of the above, died 9th Nov. 1965, aged 75 years. 042 In memory of William Stroyan, the much loved husband of Agnes Stroyan, who died at Culcaicrie, 5th Feb'y 1925, aged 80 years. Also the above Agnes Stroyan, who died at 'Culcaicrie' 24th Sep. 1945, aged 77 years. 043 In loving memory of William Cameron Wright, Bishopton, who died 24th August 1929, aged 35 years. 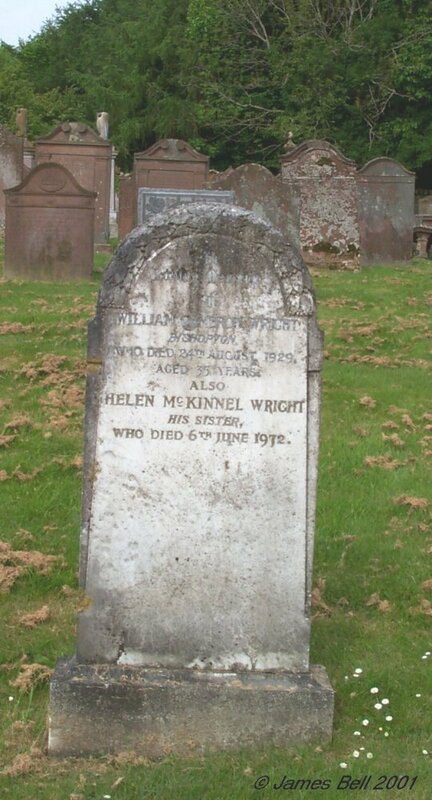 Also Helen McKinnel Wright, his sister, who died 6th June 1972. 044 In memory of James Hutton Parker, Shepherd, The Merse, who died 8th Feb'y 1923, in his 71st year. Also Elizabeth Morton, his wife, who died 12th Feb'y 1923, in her 70th year. Also William, their elder son, beloved husband of Mary Stewart, who died suddenly at The Merse, on 21st Feb. 1940, aged 62 years. Also the above Mary Stewart who died 28th July 1967, aged 87 years. 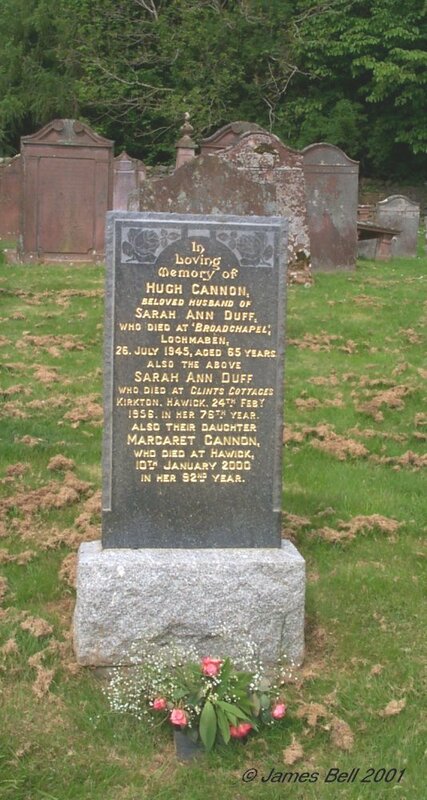 045 In loving memory of Hugh Cannon, beloved husband of Sarah Ann Duff, who died at 'Broadchapel', Lochmaben, 26. July 1945, aged 65 years. 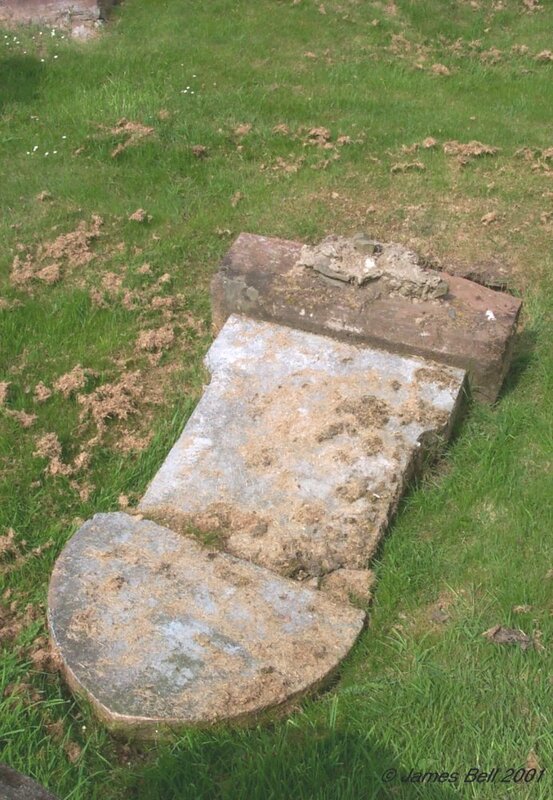 Also the above Sarah Ann Duff who died at Clints Cottages, Kirkton, Hawick, 24th Feb'y 1956, in her 76th year. Also their daughter Margaret Cannon who died at Hawick 10th January 2000 in her 92nd year. 046 Erected by Sarah Waugh in Affectionate Remembrance of her husband Alexander Currie, who died at Merse, Kirkchrist, 24th Dec. 1870, aged 38 years. Also their child, who died in infancy. Also the above Sarah Waugh, who died 31st Oct. 1906, in her 76th year. 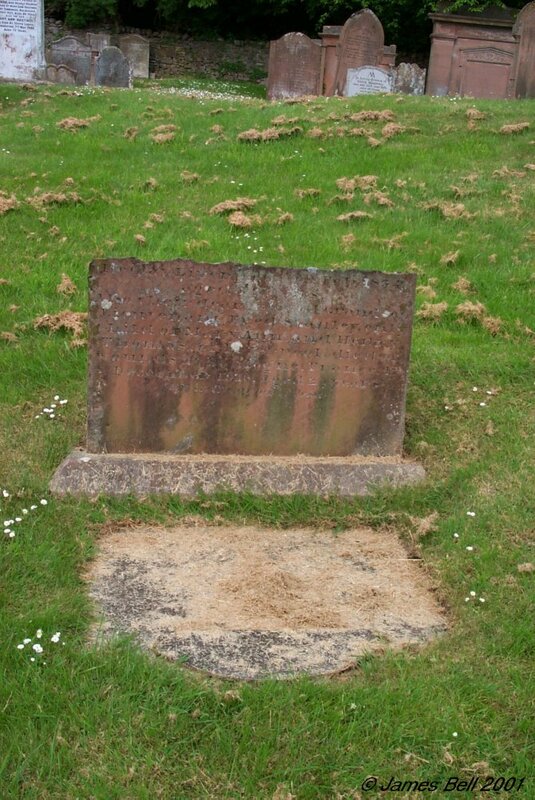 Also Jemima, their youngest daughter, who died at Castle Douglas, 25th April 1924, aged 59 years. Also Margaret, their daughter, who died 23rd April 1927 aged 68 years. 047 In loving memory of John Haddow, who died at Campbelton 26th January 1903, aged 72 years. Also Helen McLanachan, his wife who died at Fellnaw, Ringford, 10th January 1919, aged 86 years. 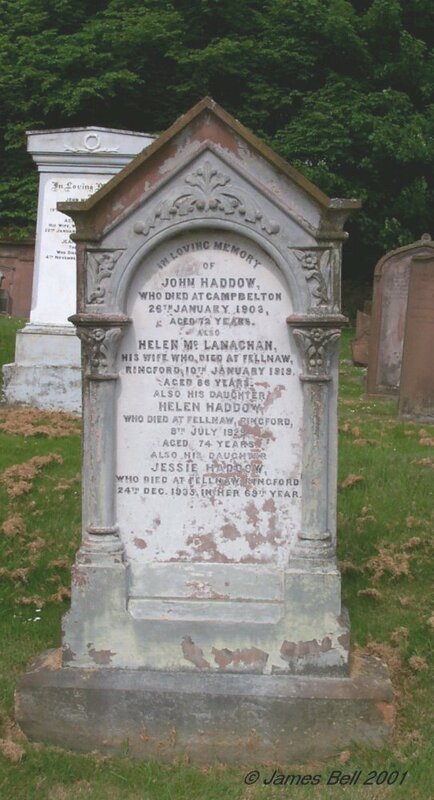 Also his daughter Helen Haddow, who died at Fellnaw, Ringford, 8th July 1929, aged 74 years. Also his daughter Jessie Haddow, who died at Fellnaw, Ringford, 24th Dec. 1935, in her 69th year. 048 In loving memory of William A MacKinnell of 'Temple Croft', and Mary Florence Short, his wife, who died 1940 and 1942. And Deirdre Mai Guy, their daughter, died in Australia 1985. 049 Erected by Robert Cummings, in memory of his beloved daughter Jennie, who died at Bank of Bishopton 14th May 1876, aged 8 years & 9 months. Prepare for death make no delay, you see how I’ve been cut away. 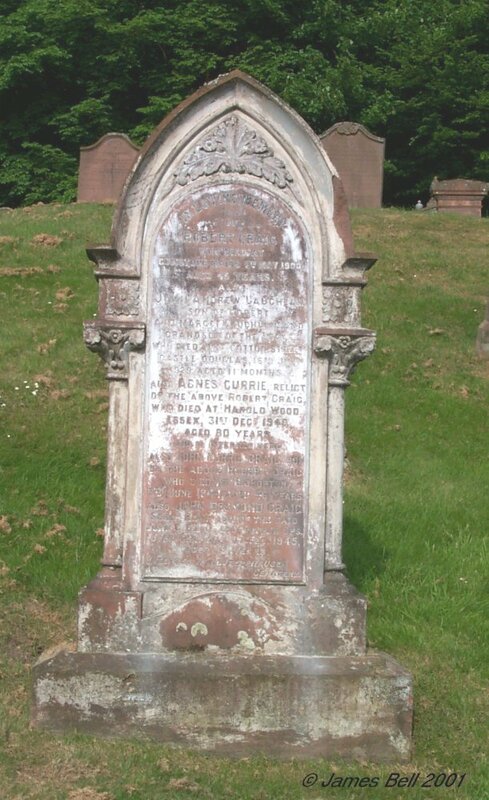 Also of his beloved wife Agnes Kennan, who died at Glasgow 28th April 1895, aged 67 years. Also the above Robert Cummings, who died at Glasgow, 30th March 1896, aged 67 years. Also Jessie Weir, their daughter who died at Borgue Village, 16th April 1935. 051 In loving memory of John Montgomery, who died at Compstonend, 19th August 1907, aged 57 years. Also Agnes Bramwell, his wife, who died at Glendroit, 22nd January 1939, aged 82 years. Also Jean Montgomery, their daughter, who died at Merse House, 4th November 1983, aged 84 years. 052 Erected in memory of William Eskdale, who died at Merse, September 19th 1871, aged 16 years. 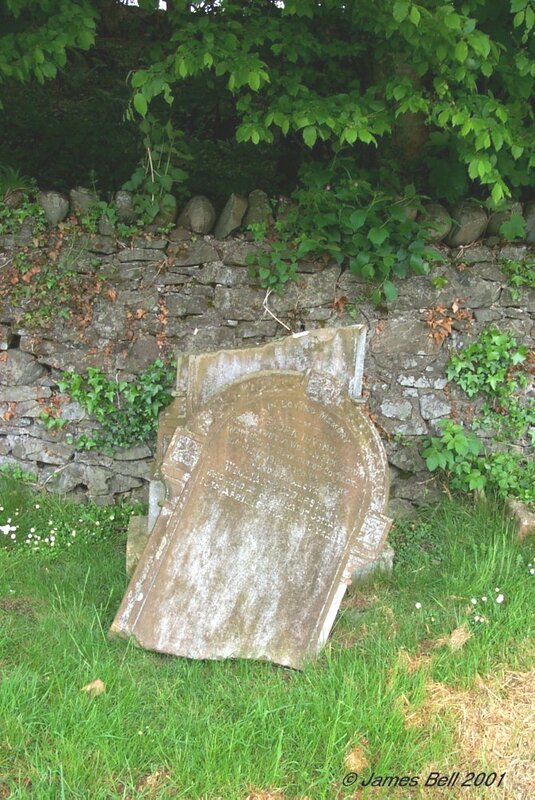 053 As will be seen from the photograph, this stone has recently fallen over onto its face and cannot be read. The inscription below is as noted by the Manpower Services Commission. Sacred to the memory of John Nichol, who died at Newton, 5th March 1855, aged 39 years. Also, his son, David, who died 6th April 1848, aged 1 year & 4 months. Also two of his grand children of Donald Cant, who died in infancy 20th Dec’r. 1857. Also his wife, Elizabeth Shaw, who died at Mill of Senwick 5th March 1899 aged 86 years. Also Joyce E.I. 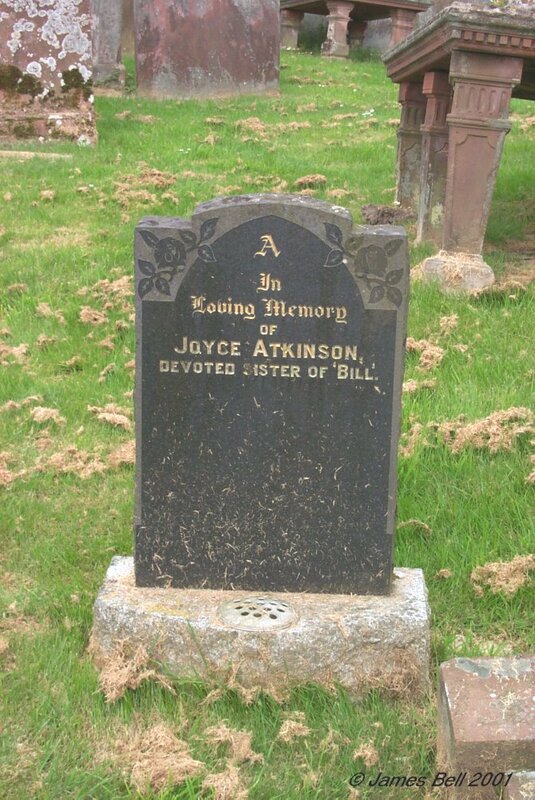 Atkinson, great grand—daughter of the above, beloved daughter of the late Charles Higham Atkinson and Janet May Atkinson, who passed away 2nd May 1967. ‘Until’. 054 In loving memory of Joyce Atkinson, devoted sister of 'Bill'. 055 Erected to the memory of Joseph Halliday, who died atTwynholm Village, Jan’y 31 1837, aged 66 years. 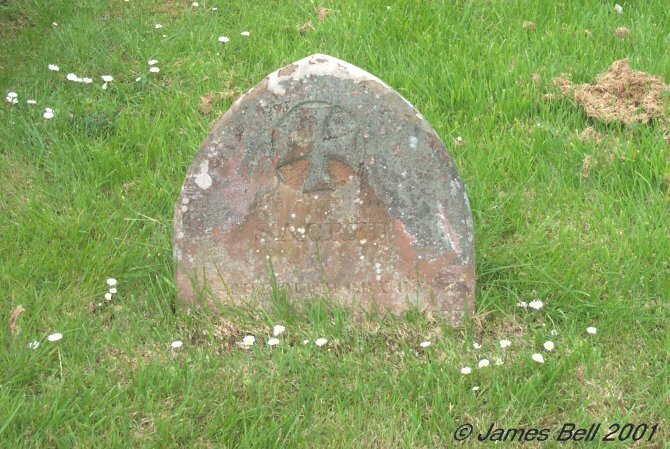 Also Jane Halliday, his daughter who died at Bank of Bishopton, on the 22nd of Nov’r. 1821, aged 22 years. Also William Halliday, his grandson, who died in infancy. Isabella Halliday wife of Alex’r. Kirk, who died the 19th May 1846 aged 39 yr. Agnes Clarke, relict of the above Joseph Halliday, who died on the 27th May 1848 aged 72. Agnes Holmes, who died in infancy the 29th March 1850. Jane Wood, who died on the 28th May 1852, aged 25. 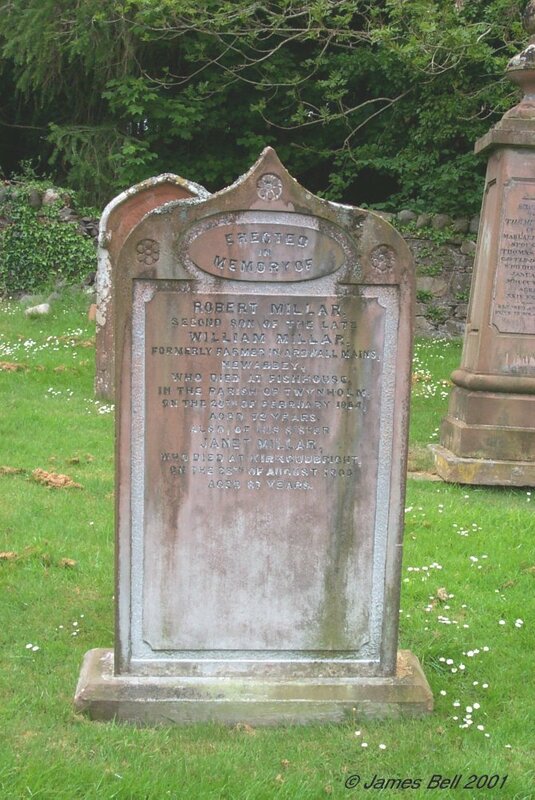 Gilbert Halliday who died -- March 185-, aged 57 years. Mary Halliday, wife of William Holmes, died Liverpool 5th April 1902, aged 84. 056 Erected by Hugh Kelly, in memory of his daughter Margaret, who died at Nunmill, 31st August 1822 aged 2 years. Annie, daughter of Hugh Kelly who died at Nockmuck 5th May 1863, aged 3 weeks. 057 Sacred to the memory of Jane, infant daughter of David Dickinson who died at Merse 13th Oct. 1873. 058 Erected by John Murray, in memory of his grand-mother Mary Sharp who died 2nd June 1814, aged 72 years. Also his father John Murray, who died 25th May 1825 aged 51 years. Also his wife Marion Houston, who died 21st Dec’r. 1871, aged 59 years. And of the said John Murray, who died 7th Nov’r. 1880 aged 76 years. And of their children, John and Jessie who died in infancy. Also their daughter Jane, who died in London, interred here 13th April 1905, aged 67 years. 059 Note: This stone is badly worn and, as can be seen, particularly affected by lichen. The transcription is perhaps inaccurate. Erected by John Bell in affectionate remembrance of his sister Janet who died at this place First January 1820, aged 22 years. Also his father William Bell who died on the 23rd March 1820, aged 54 years. 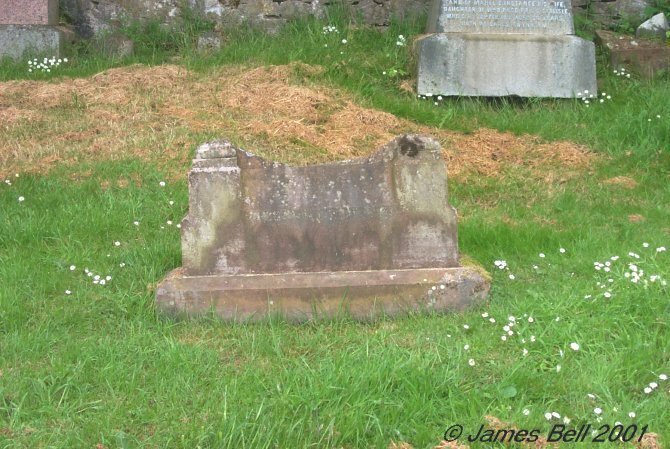 060 Sacred to the memory of Elizabeth McClure, spouse of John McKie, late in Corraford, who died 3rd June 1783 aged 38 years. 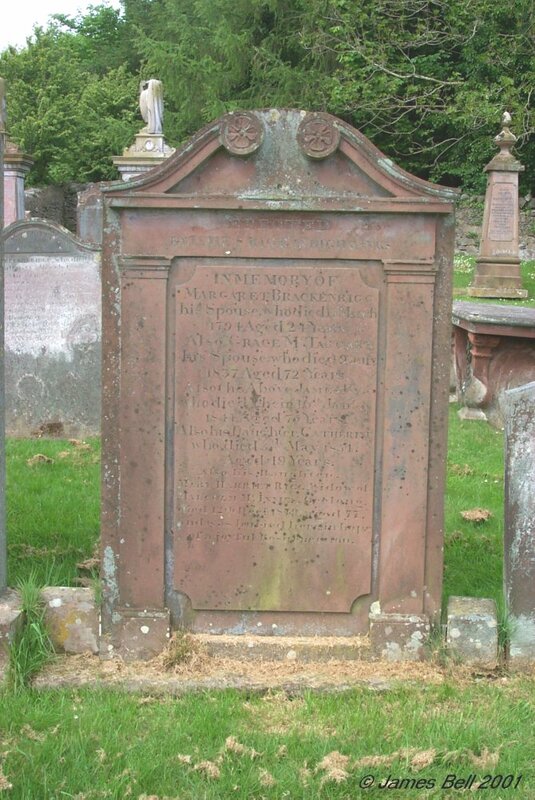 Also the said John McKie who died 21st February 1814, aged 84 years. 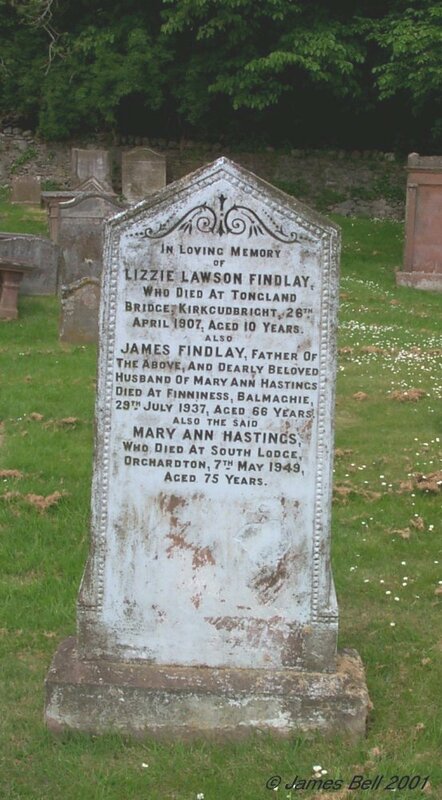 061 In loving memory of Lizzie Lawson Findlay, who died at Tongland Bridge, Kirkcudbright, 26th April 1907, aged 10 years. 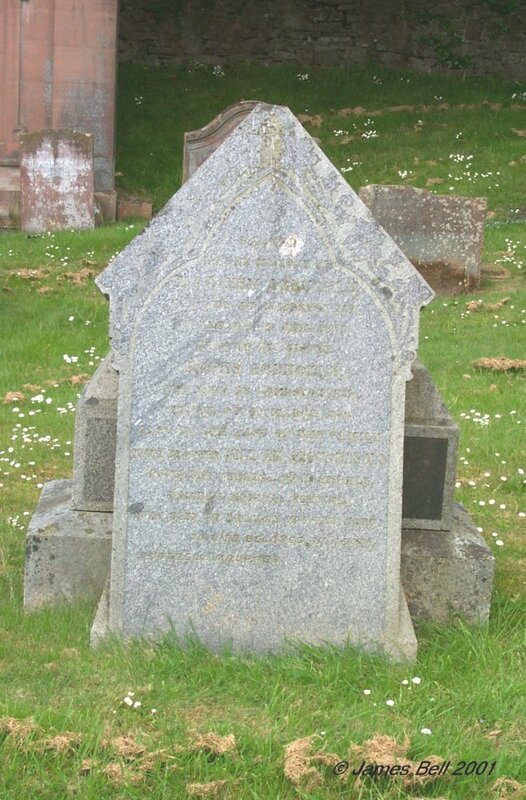 Also James Findlay, father of the above, and dearly beloved husband of Mary Ann Hastings died at Finniness, Balmaghie, 29th July 1937, aged 66 years. Also the said Mary Ann Hastings, who died at South Lodge, Orchardton, 7th May 1949, aged 75 years. 062 In loving memory of David Marshall who died 24th June 1924, aged 39 years. 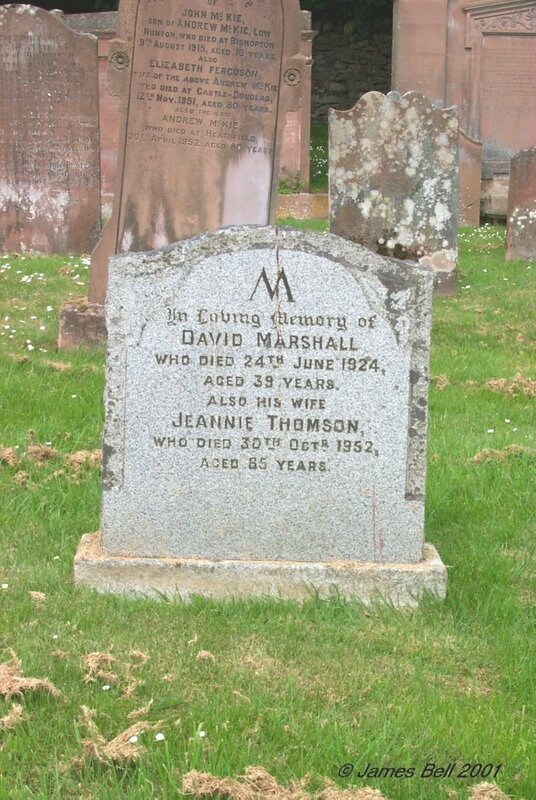 Also his wife Jeannie Thomson, who died 30th Oct'r 1952, aged 85 years. 063 In loving memory of Hellen Davies, daughter of James McGill, Culdoch, who died at Compstonend, Twynholm, 7th March 1915, aged 10 years and 8 months. Also David McLean, his son who was accidentally drowned in Jordieland Loch, 9th March 1924, aged 13 years. 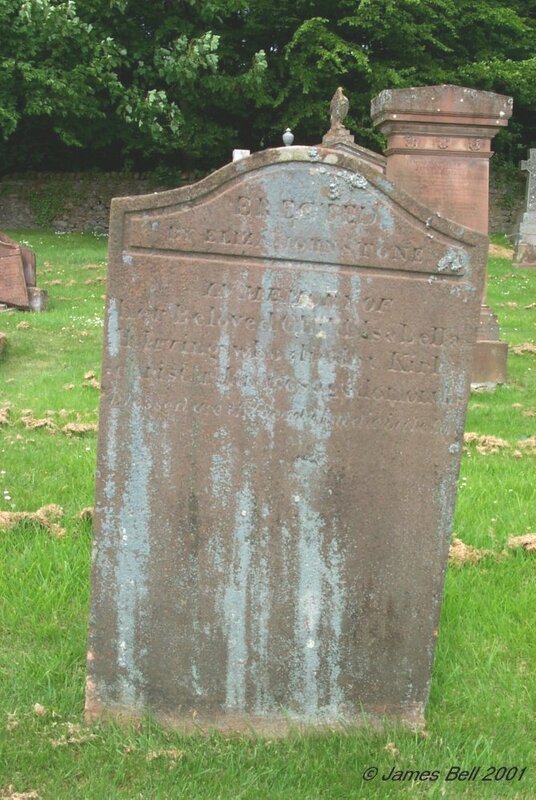 Also Annie Davies, his wife who died at Dumfries, 16th Dec. 1932, aged 55 years. 064 Erected by David Brown in memory of his mother Janet Carter, who died at Kirkchrist Tollbar, 4th April 1859, aged 73 years. Also in memory of his wife, Janet Crierie, who died at Kirkchrist Tollbar, 8th Oct. 1850, aged 30 years. Also the said David Brown, who died 18th Dec. 1879, aged 64 years. 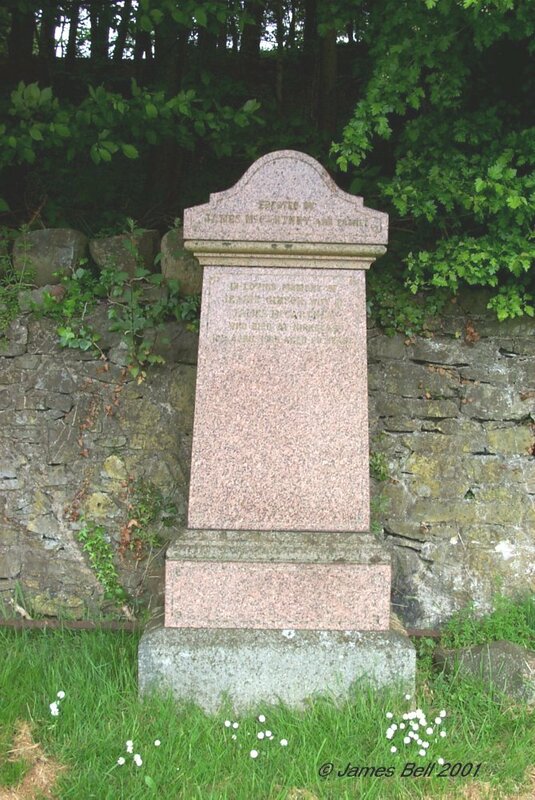 065 Erected by John Beattie, fisher, Kirkcudbright, in memory of his daughter Jane who died in infancy. Also two of his sons who were drowned 27th September 1861 between Ross Island and Isle-Point. Walter, aged 17 years. Alexander, aged 15 years. Also the said John Beattie who died 9th January 1881 aged 74 years. Also Mary Kirk, his wife, who died 10th January 1890, aged 93 years. 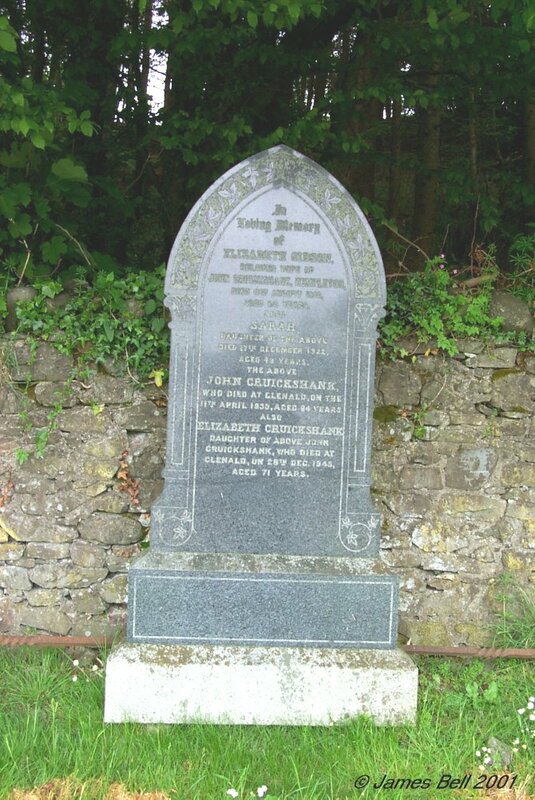 Also Thomas, their son, aged 55 years, and his son John, aged 14 years, both accidentally drowned in the Dee 2nd January 1894, and two children who died in infancy. Also Robert, son of the above John Beattie, who died 6th April 1912, aged 80. Also John, who died 25th July 1914, aged 73 years. Also Mary McKnight, wife of the said Thomas Beattie, who died on 12th December 1930, aged 90 years. Also Mary, daughter of Thomas and Mary Beattie who died 24th May 1962. 066 Erected by James Kennan in memory of Elizabeth Gordon, his wife who died at Nun Mill 14th November 1866, aged 68 years. Also of his grandson Alexander Kennan who died at sea in 1866 aged 17 years. 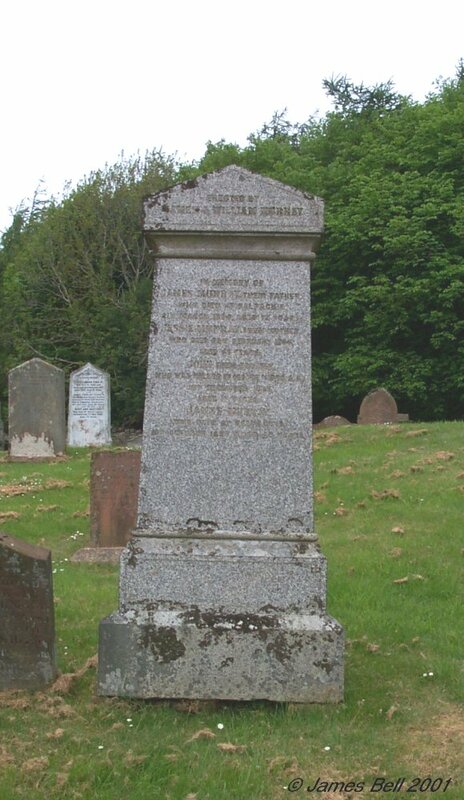 Also of the above James Kennan, who died at Kirkcudbright, 28th January 1881, aged 81 years. 067 Erected by Eliza Johnstone in memory of her beloved child Isabella H. Irving, who died at Kirkchrist 4th Jan. 1868 aged 6 months. 068 In loving memory of Margaret McLauchlan, wife of Samuel Hiddleston, who died at Tollbar Cottage, Kirkchrist, 11th January 1933, aged 56 years. 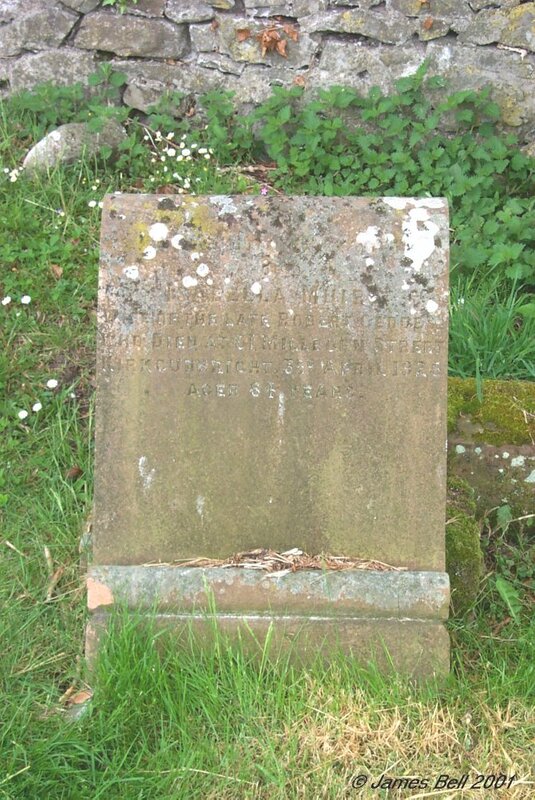 Also the above Samuel Hiddleston, died at Dumfries 13th June 1949, aged 76 years. 069 Erected in memory of David Scott who died at Kirkeoch, 28th Oct. 1875, aged 55 years. Also of his daughter Margaret, who died 7th April 1869, aged 2 years and 8 months. Also of his son William who died 8th April 1876 aged 33 years. And of Annie Evans his relict who died 5th May 1876 aged 35 years. Also of his son Robert, who died at Newton, 9th Nov. 1881 aged 29 years. 070 Although broken, the inscribed portion is complete and legible. 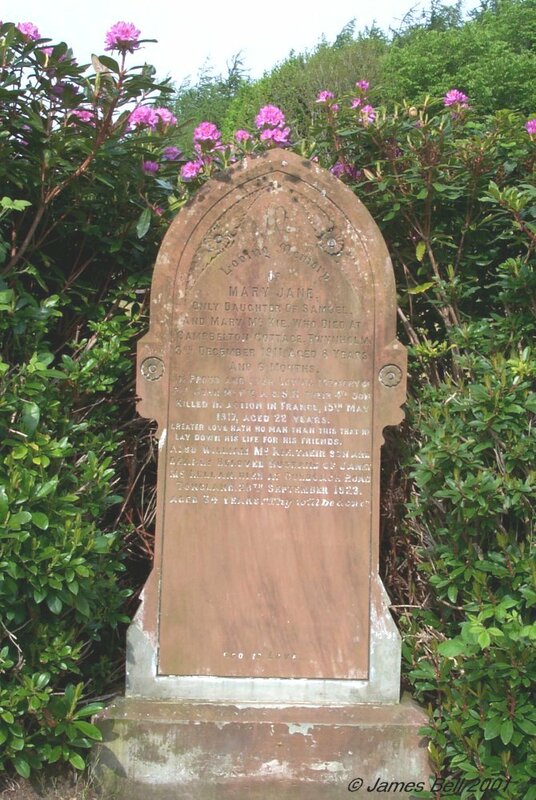 In loving memory of Joan Johnstone Cowan, beloved wife of Robert Howatson, Manse Cottages, Dumfries, who died at Inverdee, Kirkcudbright, 24th March 1907, aged 63 years. Also the above Robert Howatson, who died 18th December 1924, aged 77 years. Also Joan, their daughter, born 11th July 1888, died 4th May 1927. Also Robert, eldest son of the above who died 18th June 1948, aged 72 years. 071 Erected to the memory of Joseph Grierson, who died at Campbelton, 15th September 1867, aged 50 years. Also Samuel his son, and Jessie his daughter, who died in infancy at Corbieton in the parish of Buittle, and Clement his daughter, who died at Campbelton 2nd August 1868, aged 2 years. Also his son Thomas who died at Campbelton, in this parish, the 19th November 1870 aged 20 years. 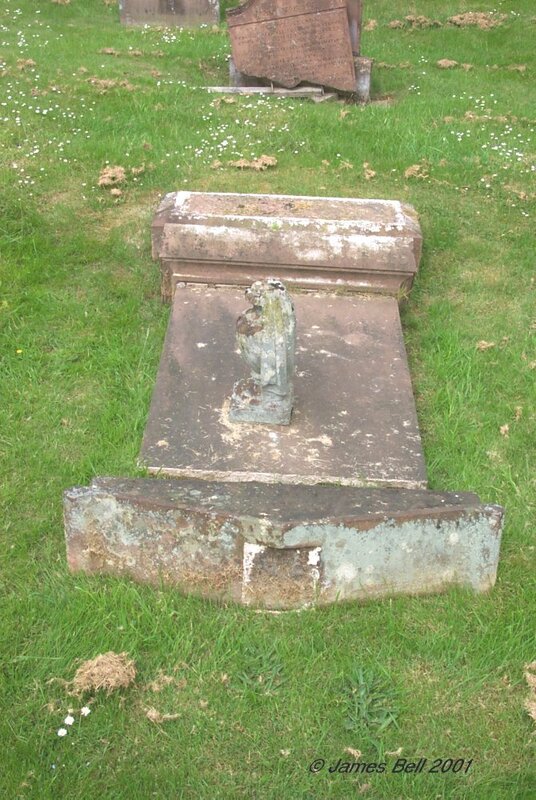 Also Agnes, his daughter, who died on 3rd August 1878 aged 18 years. Also Jane McNae, wife of the above Joseph Grierson, who died at Littleton, in the parish of Borgue, the 18th day of March 1894, aged 71 years. Also Mary, his daughter, who died at Low Auchenlarie, parish of Anwoth, the 1st day of Dec. 1918, aged 70 years. 072 Sacred to the memory of James S. Gifford, Law Agent, Edinburgh, third son of Patrick Gif ford, late farmer in Ingleston, Twynholm, who died at Ingleston 16th August 1895, aged 25 years. And of the said Patrick Gifford, who died at Edinburgh on the 8th March 1896, aged 83 years. And of Barbara Sloan Grierson, daughter of John B. Grierson, Bishopton, and wife of the above Patrick Gifford, who died at Kelso on the 19th August 1914, aged 74 years. And of Major John Gifford, Imperial Light Horse, Benghi, South Africa, oldest son of the said Patrick Gif ford who died at Cape town on 23rd July 1938, aged 74 years. And of Squadron Leader Pattrick Gifford Junr. P.F.C. Solicitor, Castle Douglas, grand—son of the above Patrick Gifford who was killed in action in Belgium 16th May 1940 aged 30 years. And of Helene Alma Cohen, wife of Patrick Gifford, Solicitor, Castle Douglas, born at Orange, New Jersey, U.S.A. 18th Jan. 1875, died at Edinburgh 7th February 1949. And of the said Patrick Gifford, solicitor, born at Twynholm, 7th Jan. 1866, died at Castle Douglas, 6th August 1949. And of Barbara Helen Gifford, sister of the above Patrick Gifford, born 16th August 1877, died 25th November 1955, who was the wife of Mungo McCallum Fairgrieve. 073 This stone has fallen face down. It is complete however, and could easily be re-erected. The transcription below is taken from that of the Manpower Services Commission. Sacred to the memory of Samuel Grierson, fifth son of John Barber Grierson, in Bishopton, who died at Bradford 15th Nov. 1866 aged 20 years. And of the said John Barber Grierson who died at Bishopton, 2nd Jan’y. 1875, aged 67 years. And of James Grierson, third son of John Barber Grierson who died at Bishopton, 5th April 1875, aged 31 years. And of Margaret McClune, wife of the above John Barber Grierson, 16th Dec’r. 1875, aged 65 years. And of Mary Grierson, third daughter of John Barber Grierson, who died at Roslyn Cottage, Troqueer 18th Dec’r. 1883 aged 33 years. And of John Grierson, eldest son of John Barber Grierson, and twin brother of the above Samuel Grierson, he was accidentally killed in Matua Otago, New Zealand, on 10th Nov’r. 1910, aged 65 years. 074 A portion of this stone has weathered, with loss of some lettering. In memory of Samuel Dowall, who died at High Newton, on the -- -------- 1870, aged 88. 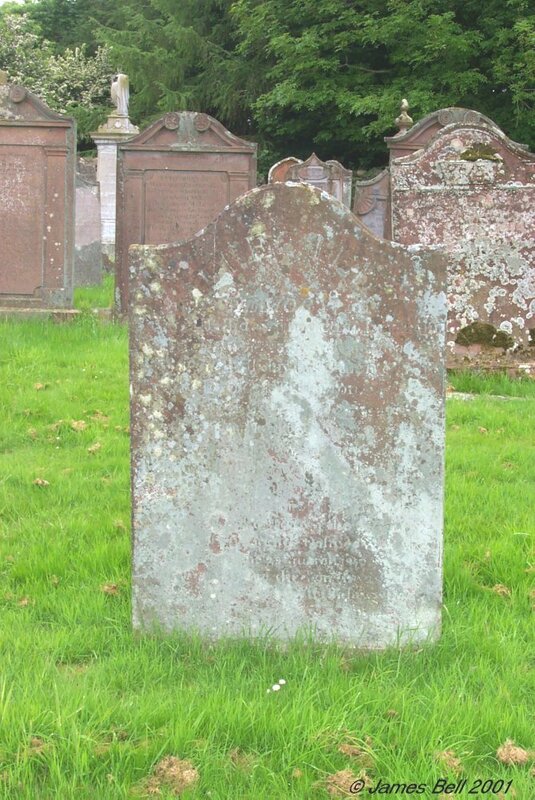 ---------------- years, the faithful servant of the Arbuckle family. 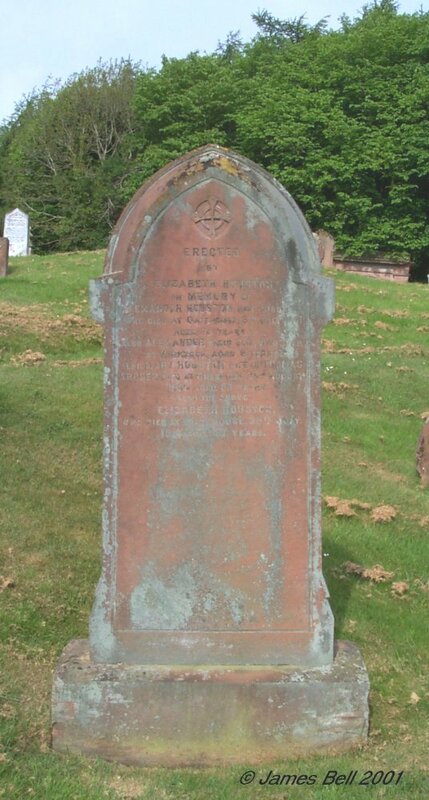 And Agnes, his sister, who died at Doon, on the 16th April 1880, aged 93 years. 075 Sacred to the memory of Matthew Arbuckle, who died at Compstonend on the l0th July 1853. 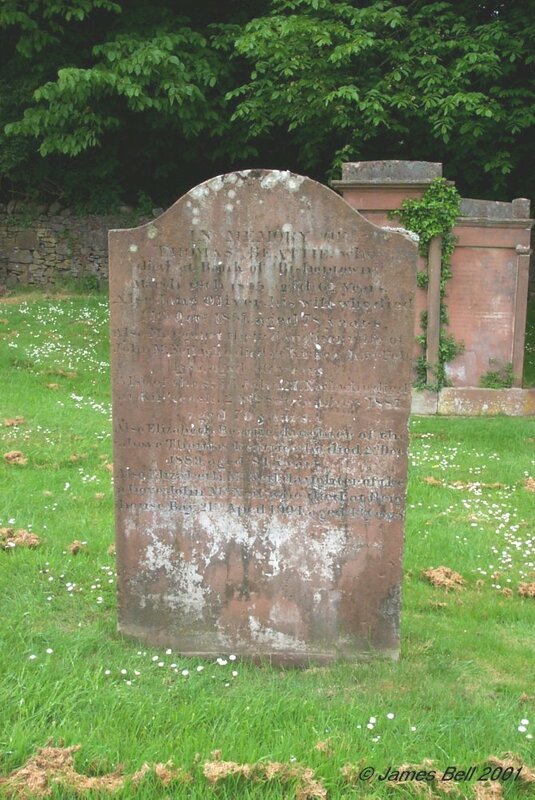 Also to his sister Agnes Arbuckle who died at Compstonend, on the 8th March 1870. Also to, the last of the family, their brother, William Arbuckle M.D. Inspector General of Hospitals, Bombay Medical Service, who died at Balmae, 15th Feb. 1876. In life beloved, in death sincerely mourned. 076 Sacred to the memory of Elizabeth Carter, wife of Alexander Clingan, who died at Castle-Sod 17th Jan’y. 1907 aged 67 years. Also John, eldest son of the above, who died in London, 10th June 1913, aged 37 years. And is interred here. Also the above Alexander Clingan, who died at Castle-Sod, 5th August 1940, in his 95th year. Also Samuel Robert, younger son of the above, who died at Castle-Sod, 7th June 1945, aged 67 years. 077 In loving memory of John McKie, son of Andrew McKie, Low Nunton, who died at Bishopton 9th August 1915, aged 16 years. 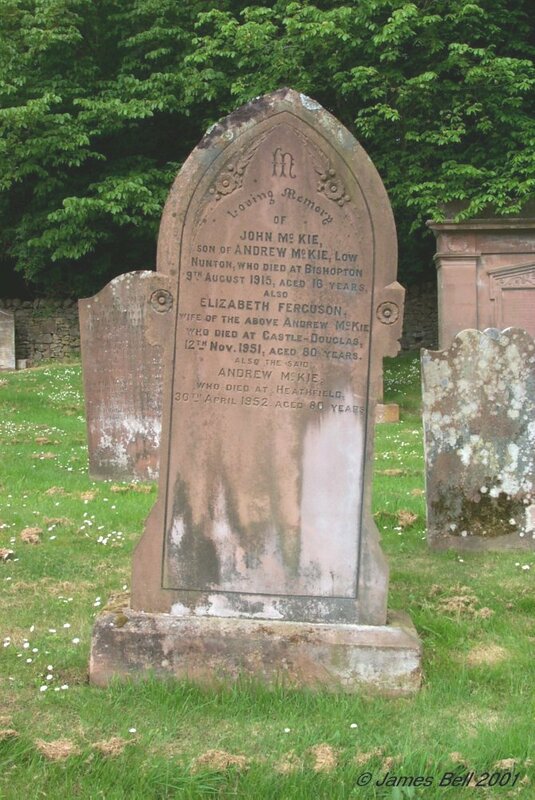 Also Elizabeth Ferguson, wife of the above Andrew McKie, who died at Castle-Douglas 12th Nov. 1951, aged 80 years. Also the said Andrew McKie who died at Heathfield, 30th April 1952, aged 80 years. 078 Here lyes William Wallas who dyed 22nd Oct. 1715, aged 21 years. 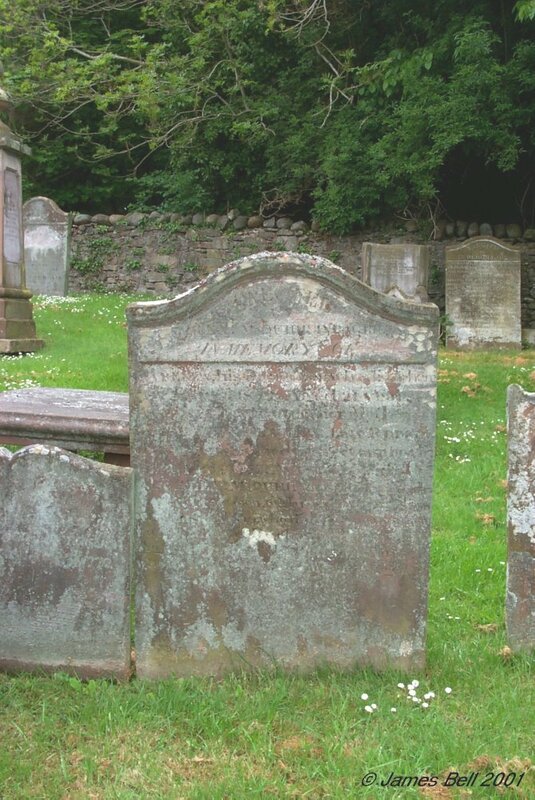 Also Jannet Wallas, spouse to Alexander Cavet, who died 23rd June 1749, aged 49. 079 Erected by Solomon Wilkinson, to the memory of Elizabeth McClune, his deceased spouse, who died 24th Aug’t. 1808, aged 72 years. 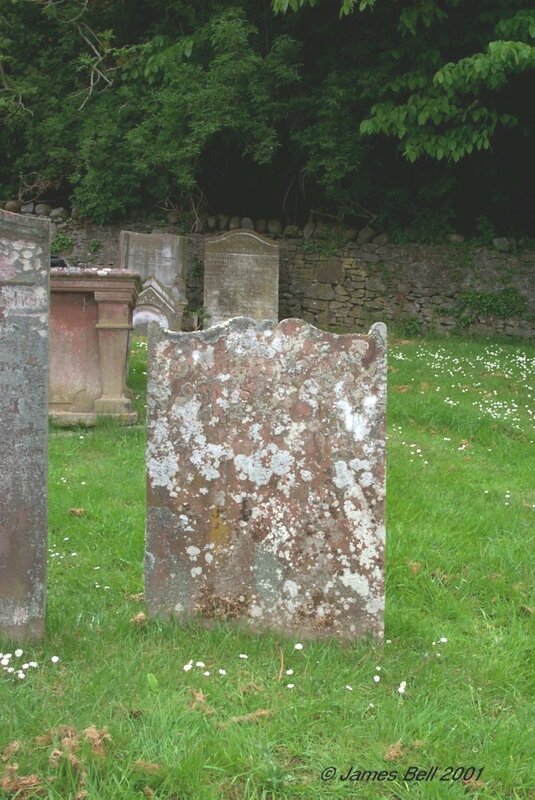 Also the said Solomon Wilkinson died at Nunmiln, on the 15th June 1813, aged 77 years. Their son James Wilkinson, died at Nunmiln, 25th May 1842 aged 77 years. Also Agnes McMath, spouse of the said James Wilkinson, who died the 16th day of November 1843 aged 72 years. 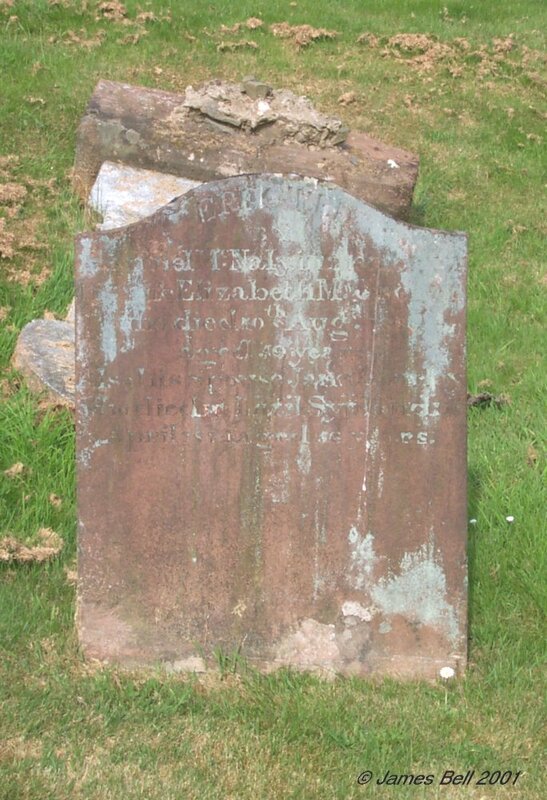 Also their daughter Elizabeth, died at Kirkcudbright -- June 1880, aged 7- years. 080 Erected by Sarah McMinn, Doon Cottage, to the memory of her father James McMinn, who died 18th June 1836, aged 80 years. 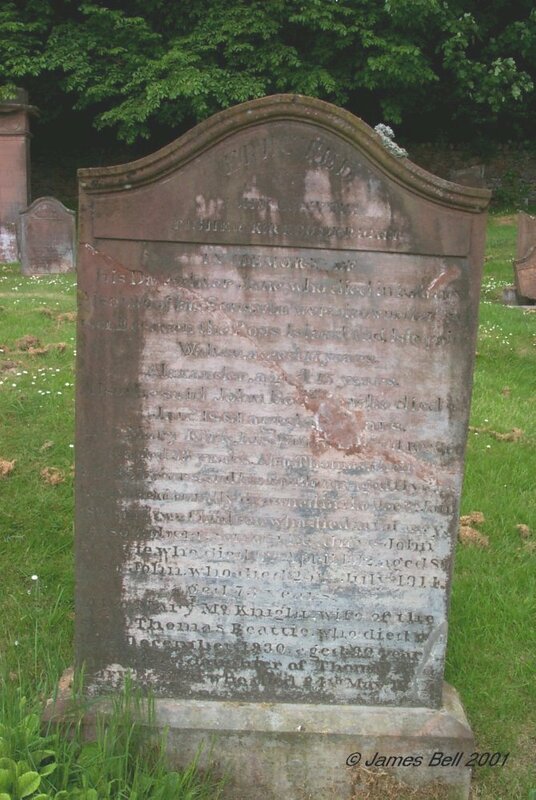 Also her brother, John, who died in Dumfries, 12th April 1826 aged 34 years. Also James, who died in Cincinati 18th Oct. 1828, aged 29 years. 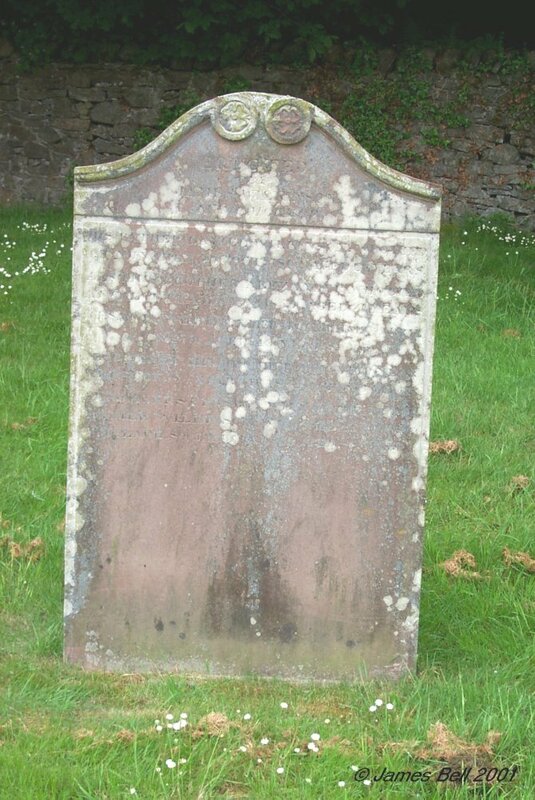 And Thomas, who died in St. Domingo, 25th Dec. 1830, aged 35 years. 081 Sacred to the memory of David McMinn, who died at Doon, 21st Nov. 1807 aged 52 years. 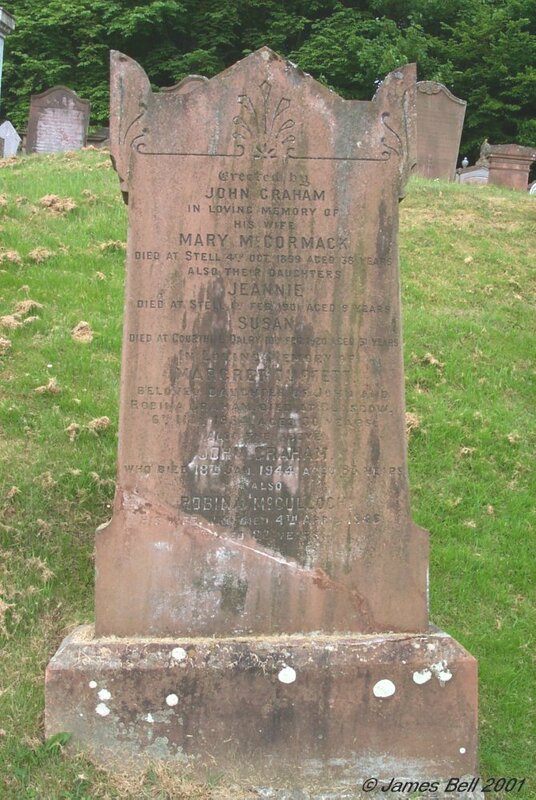 And of John McMinn his father, who died at same place 11th Oct. 1814, aged 100 years. 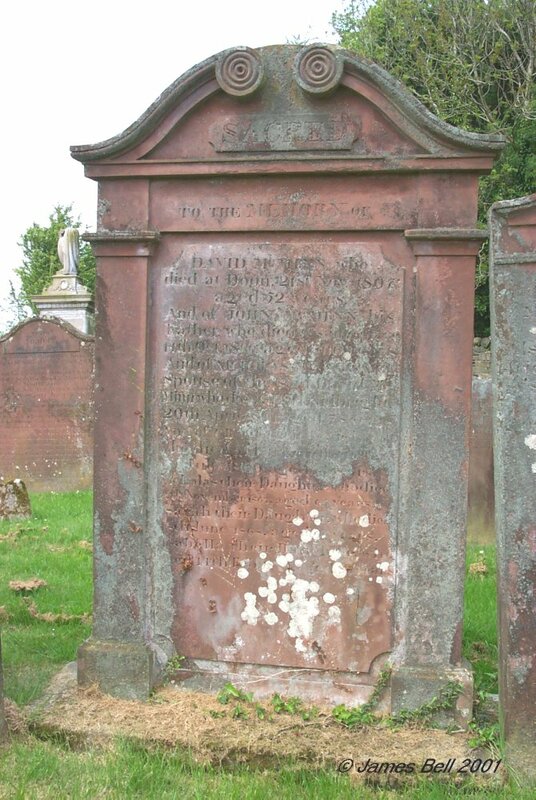 And of Nicholas McTaggart spouse of the said David McMinn, who died at Kirkcudbright, 20th April 1841, aged 78 years. 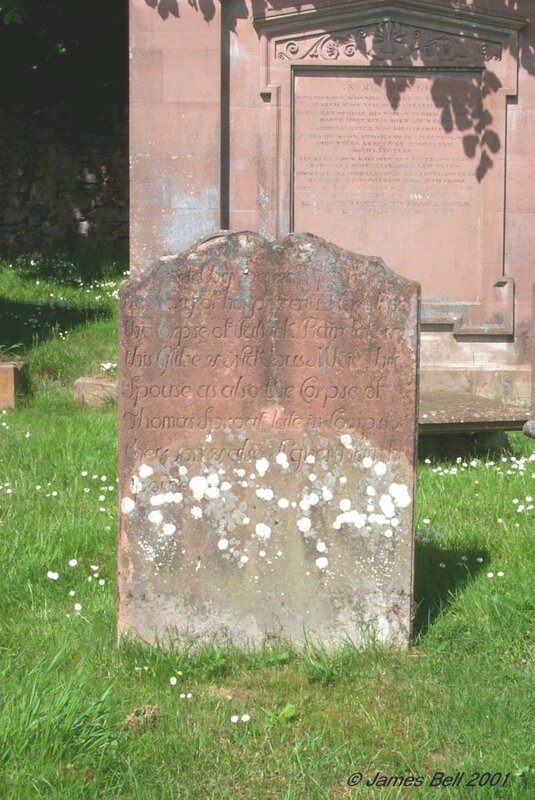 And of Grace their daughter, who died at Kirkcudbright 23rd July 1860, aged 54 years. Nicholas their daughter, who died 27th November 1867, aged 65 years. Sarah, their daughter, who died 8th June 1868, aged 67 years. Isabella their daughter, who died 14th Feb. 1884, aged 86 years. 082 Erected by James McMurrie in Bishoptown in memory of Jean McClure, his spouse who died May 20th 1774 aged 38 years. Also his son John who died the 21st of April 1811, aged 44 years. Also the said James McMurrie who died at Balig the 29th of January 1815 aged 80 years. 083 Erected by James Rigg in High Banks, in memory of Margaret Brackenrigg, his spouse, who died 15th March 1794, aged 24 years. 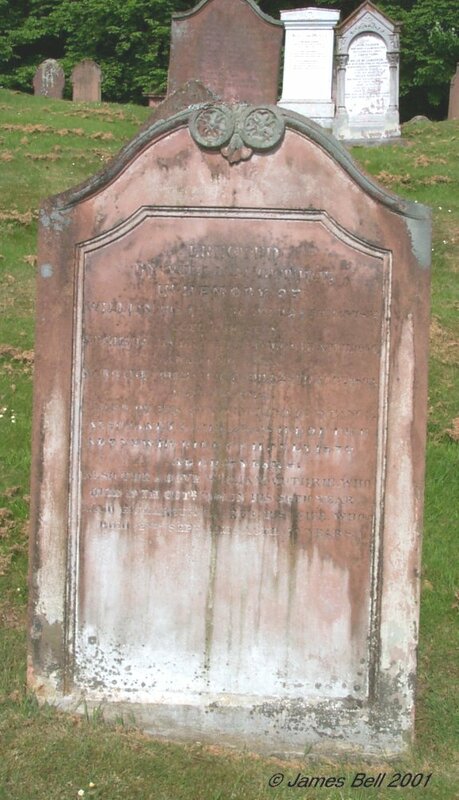 Also Grace McTaggart, his spouse, who died 9th July 1837, aged 72 years. Also the above James Rigg, who died there 16th Jan. 1841, aged 75 years. Also his daughter, Catherine, who died 5th May 1854, aged 49 years. Also his daughter, Mary Harriet Rigg, widow of Malcolm McInnes, Geelong, died 12th Dec. 1879, aged 77, and was buried here. In hope of a joyful resurrection. 084 In loving memory of William Rigg, who died at High Banks on the 30th Oct. 1892, aged 78 years. Also Jane Williamson, his wife, who died at High Banks, on the 16th July 1905, aged 81 years. Also James Rigg, their son who died at Sunnybrae, Buittle, 11th Sept. 1927, aged 64 years Also Margaret Breckenridge Rigg, their daughter, who died at Castle Douglas Cottage Hospital, 16th July 1941, aged 75 years. 084a This stone seems to have been placed against the rear of stone 84a. I suspect it originally stood adjacent to stone #86. Erected by Thomas Breckenridge in memory of Grissel Roxburgh, his spouse, who died 30th Oct'r 1802, aged 63 years. And the said Thomas Brechenridge who died at Newton the 17th Nov'r 1821, aged 79 years. 085 Erected in memory of John Robertson, son of James Robertson at Newton and Barbara McWilliam, spouse, who died at Demarara on the 18th of Dec. 1832, aged 38 years. 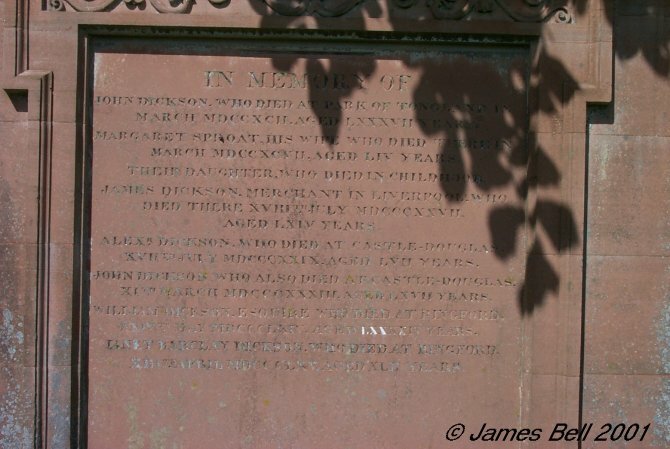 And in memory of the said James Robertson who died on the 11 Sept. 1834 aged 75 years. 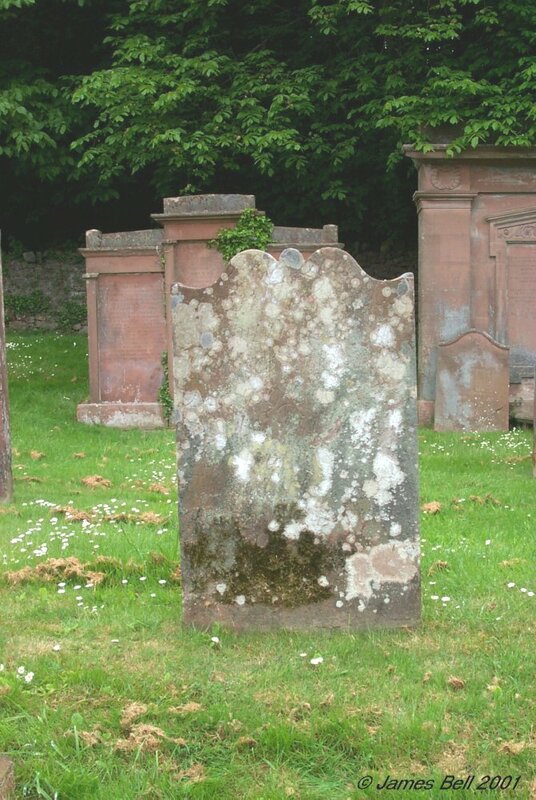 And of his daughter Jean who died on the 25 of May 1821 aged 8 years, both of whom be here interred, The said Barbara McWilliam, who died at Newton, on the 23rd of July 1844 aged 72 years. 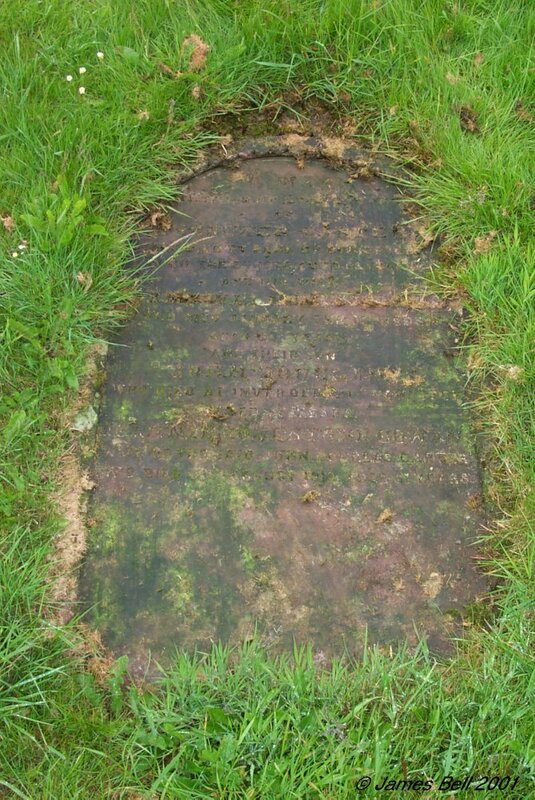 Also his daughter Grace, who died at Bank of Bishopton, on the 20th of Jan. 1863 aged 65 years. 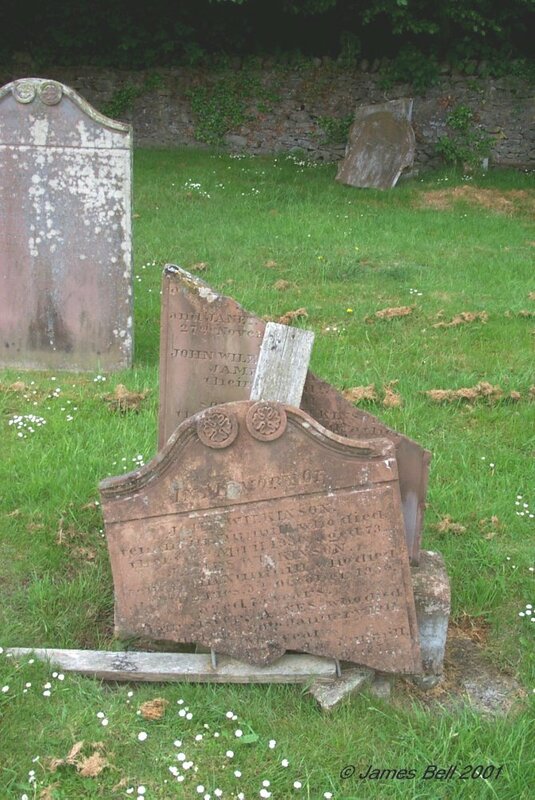 Also their daughter Janet & wife of James Houston who died at Kirkcudbright, 29th Dec. 1869 aged 69 years. Also the above James Houston, who died at Doncaster, 12th Dec. 1885, aged 79 years, and was interred here. 086 Erected to the memory of James Breckonridge who died in Ireland 12th March 1825, in the prime of life. 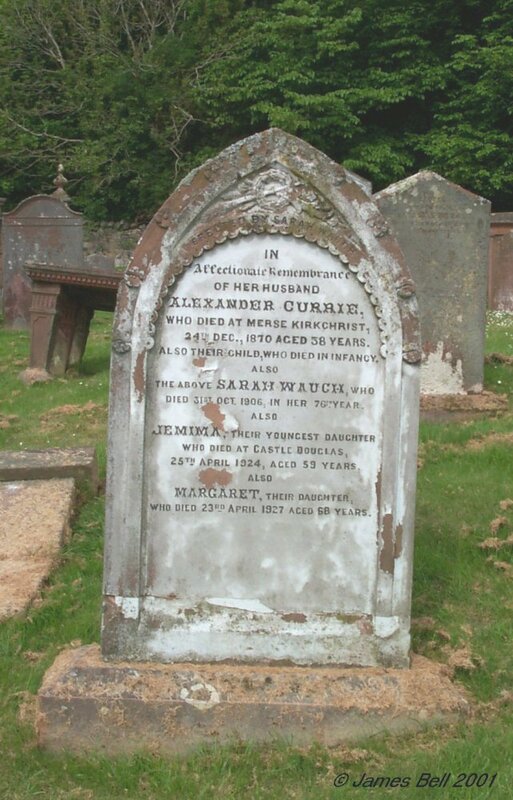 Janet McMurray, his wife, who died 1st Jan'y 1848, aged 72 years. Also his daughter Jane who died 10th Sep'r 1848, aged 48 years. James, Thomas, John and Samuel, his sons, who died abroad. Also his two daughters who died in infancy. 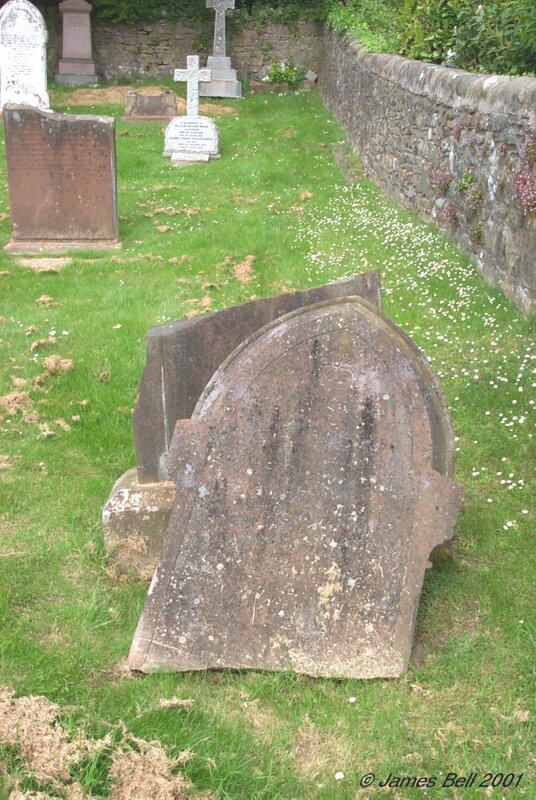 Also Janet, their daughter, who died at Gordon Villas, Kirkcudbright, 27th March 1899, aged 98 years. 087 At this point there are 3 stones in close proximity, all of which are small. They are pictured below. The two flat whinstones are inscribed. Previous transcriptions have recorded that the 'Broun' inscription included mention of a William Broun, but I could not find this. 1. Thomas Broun who perished in the Water of Tarff, June the 13th, 1734. 2. E (or I or J) Porter, June 1844. 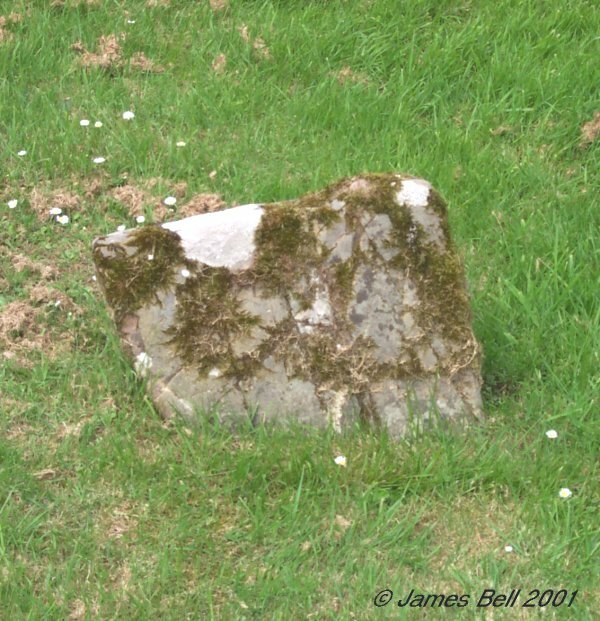 The small, upright stone, has no visible inscription. 088 Erected by Robert Kerr, Mariner, Kirkcudbright in memory of his father Robert Kerr, shoemaker, who died 26th Jan. 1822 aged 55 years. Also his mother Janet Crow, who died 3rd Nov. 1846, aged 69 years. Also his sister Nicholas Kerr, who died 23rd Nov. 1859, aged 41 years. Also, the said Robert Kerr, Mariner, who died at Ramsey, Isle of Man, Oct. 24th 1870, aged 62 years, and is interred here. 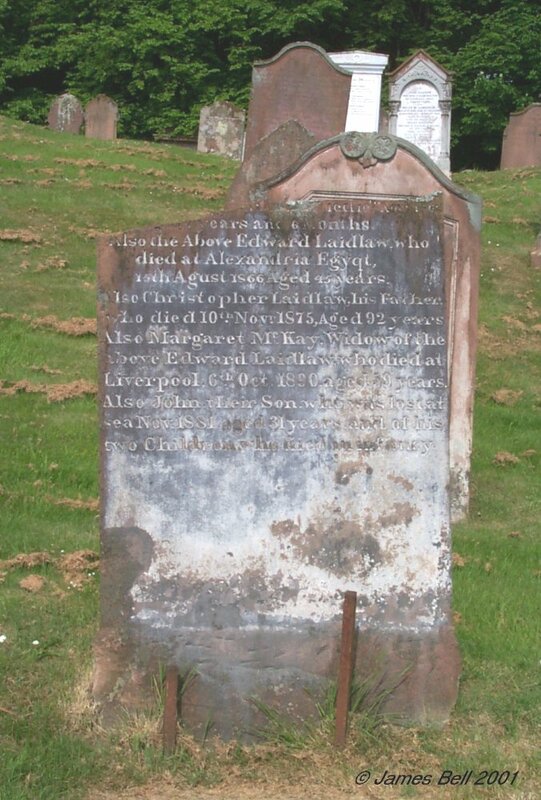 Also Robert his son, who was drowned at Liverpool, 24th Dec. 1891, aged 28 years. 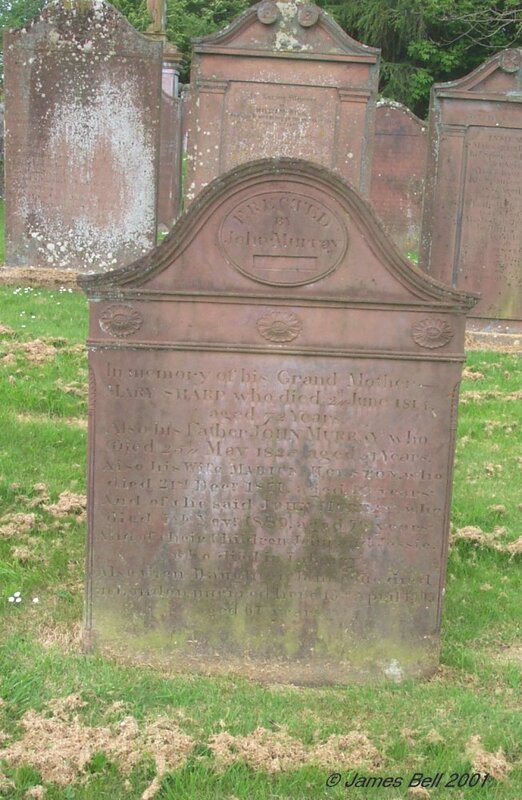 Mary McNeillie, wife of Robert Kerr, died 4th March 1904, aged 74. 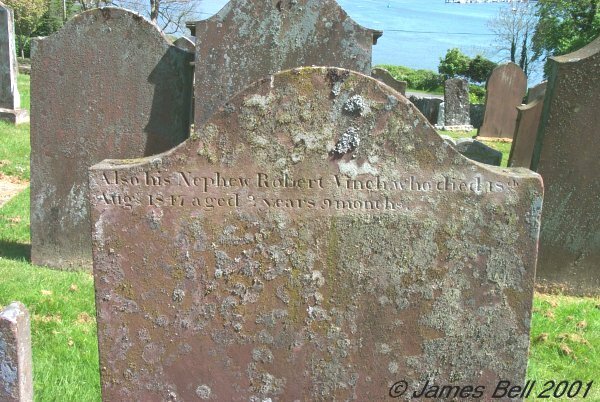 Reverse: Also his nephew Robert Vinch who died 18th Aug't 1847, aged 2 years, 9 months. 089 Erected by James Porter in memory of Ann Ward his wife, who died in Liverpool on the 11th March 1846 aged 74 years. 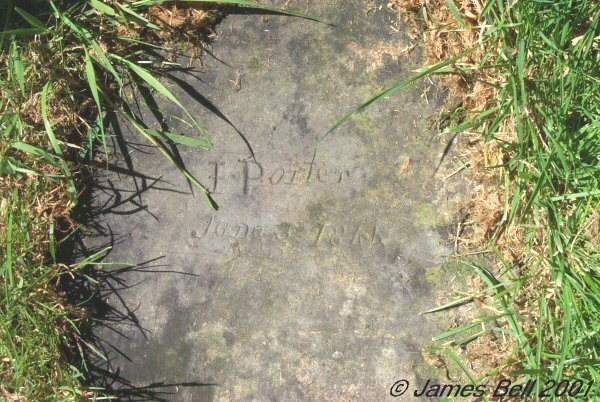 Also the said James Porter who died 1849 in his 84th year. Rear: March 1791. 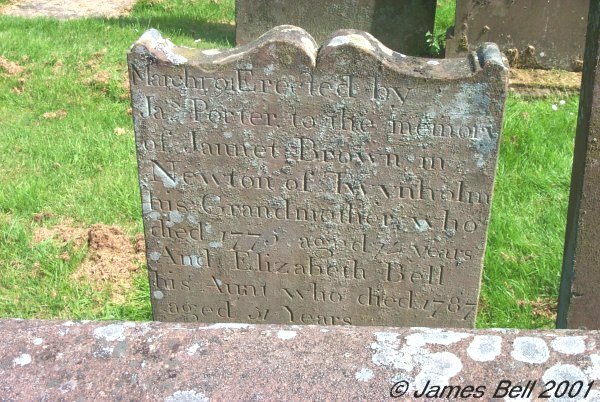 Erected by James Porter to the memory of Janet Brown in Newton of Twynholm, his grandmother, who died 1775 aged 74 years. And Elizabeth Bell, his aunt, who died 1787, aged 51 years. 090 Margaret Kingan died 21st Feb. 1858 aged 66 years. Also Janet Kingan died 11th Jan. 1862 aged 85 years. 091 Blank stone, which is visible on the right in the photo. 092 Here lyes Janet (Muir) spouse of John McCourty in Welltrees, who died 11th Dec. 1759, aged 69 years. And also Grissal, William, Mary, John and Agnes, their children. 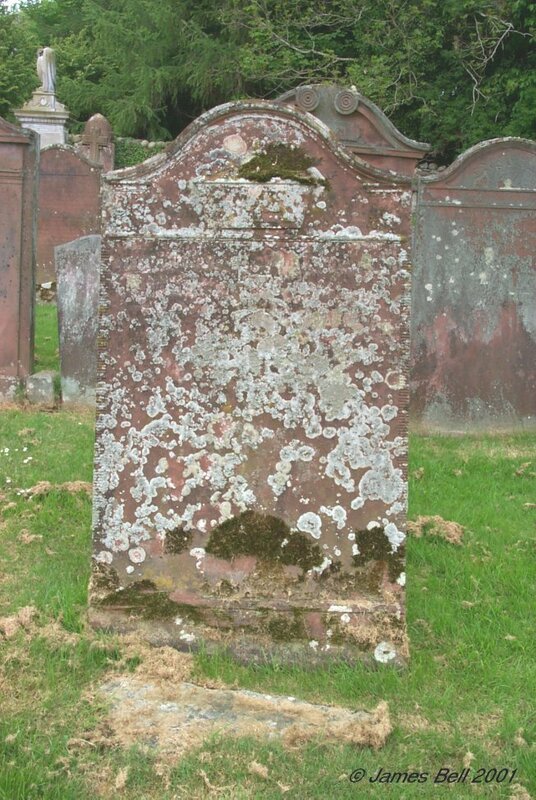 Also the S'd John McCourty, who died 19th Oct 1781, aged 85 years. 093 Sacred to the memory of John McTaggart, fourth son of John Church, who died at Kirkcudbright on 3rd Dec. 1836, aged 26 years. 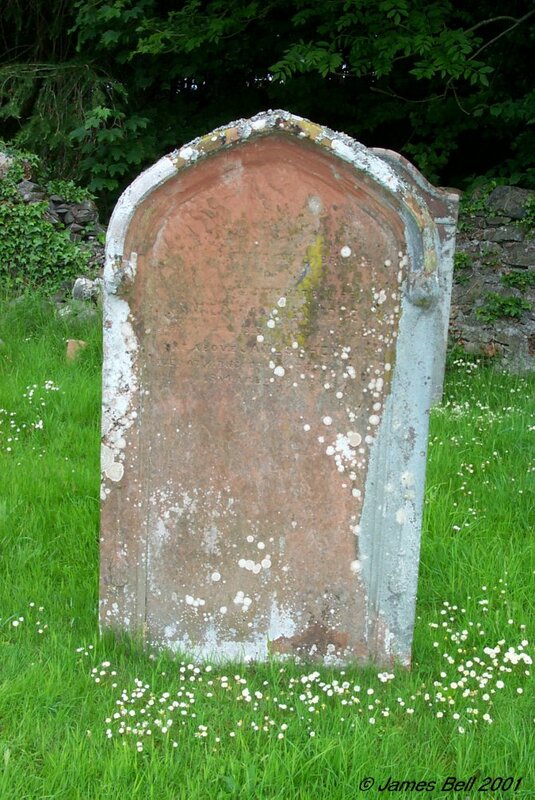 Also John, his second son, who died at Hitchell, in the Parish of Cummertrees, on 21st Jan. 1818, aged 4 years. Also Mary Drew, his daughter, who died at Hitchell 23rd Oct. 1812, aged 4 years. And of Duncan McDonald, his third son, who died in London 1st Oct. 1828, aged 21 years. 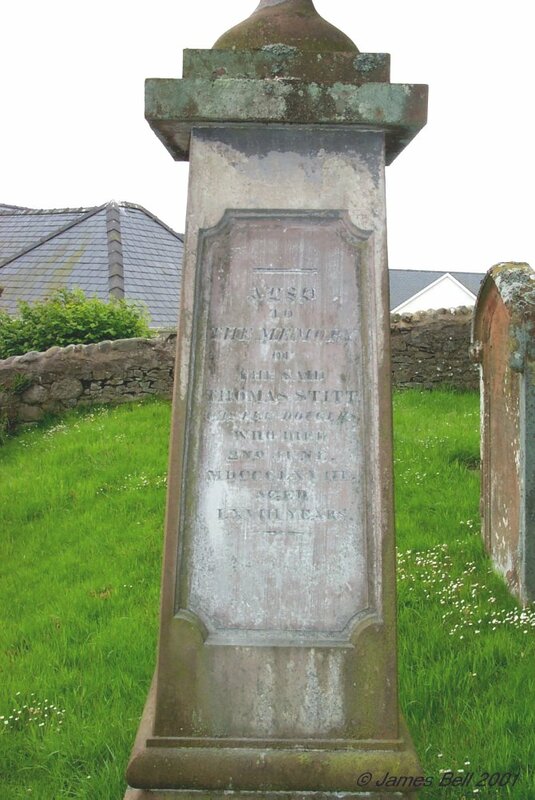 Also the above mentioned John Church who died at Kirkchrist 13th June 1842, aged 66 years. And also Elizabeth McTaggart Church, his spouse, who died at Janefield 25th Nov. 1844, aged 64 years. Also William Church, his fifth son, who died in London on the 16th October 1844, aged 29 years, eight days after his return from Bombay. 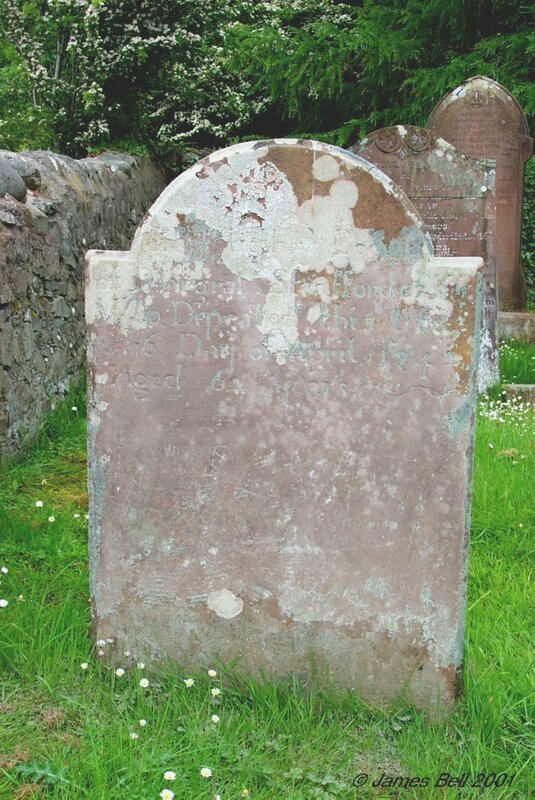 Also of Eleanor Church, his second daughter, who was born 31st December 1811, married William Mure 28th July 1840, died at Kirkcudbright 3rd June 1845. Also his sixth son, Cherles, born 27th Jan'y 1819, married 29th August 1861 Anne Church, daughter of John Cunningham, Esq., died at St. Leonard's on Sea on the 17th March 1872, leaving four sons. Also James, his eldest son, born 13th Dec. 1803, married Sarah, daughter of Sir J. Mactaggart, Bt., of Ardwall, died 31st May 1873. Also of Elizabeth, his youngest daughter, born 2nd June 1816, married 6th March 1838 (?) H. (?) Fletcher of Dale Park, Arundel, died 9th Nov. 1888 (?). 094 In memory of Thomas Beattie who died at Bank of Bishopton March 19th 1845, aged 62 years. Also Jane Oliver, his wife who died 14th Oct'r. 1857, aged 78 years. 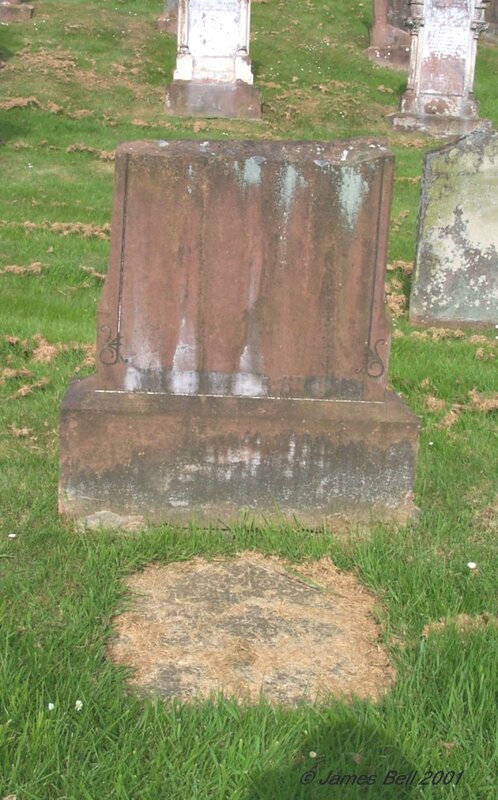 Also Margaret, their daughter, wife of John McNeil, who died at Kirkeoch 5th Feb. 1886, aged 66 years. 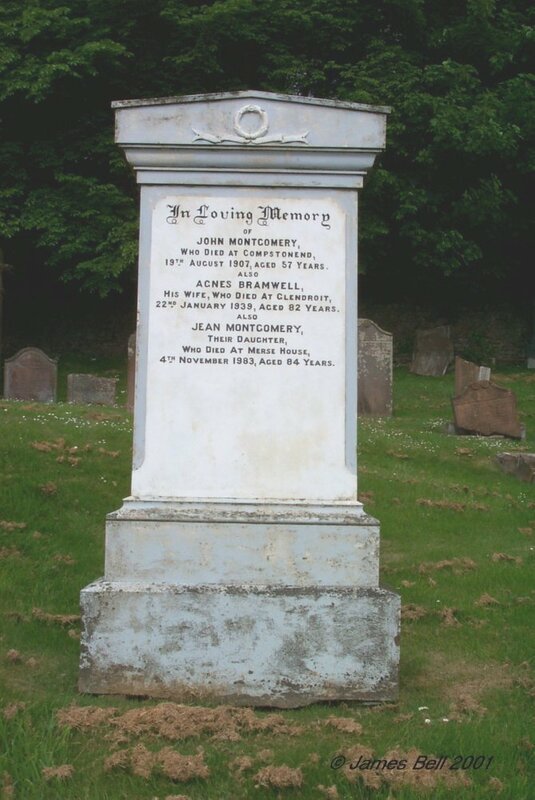 Also of the said John McNeil who died at Kirkeoch, 24th September 1887, aged 70 years. Also Elizabeth Beattie, daughter of the above Thomas Beattie, who died 2d Dec. 1889. Also Elizabeth McNeil who died at Brighouse Bay 21st April 1904, aged 43 years. 095 Erected by Mary Murray, in memory of John Stevenson, her husband, who died 11th February, 1800, aged 81 years. 096 Erected by Alex'r McQuhir in Bagbie, in memory of Isabella, his daughter, who died there 24th Aug. 1854, aged 21 years. 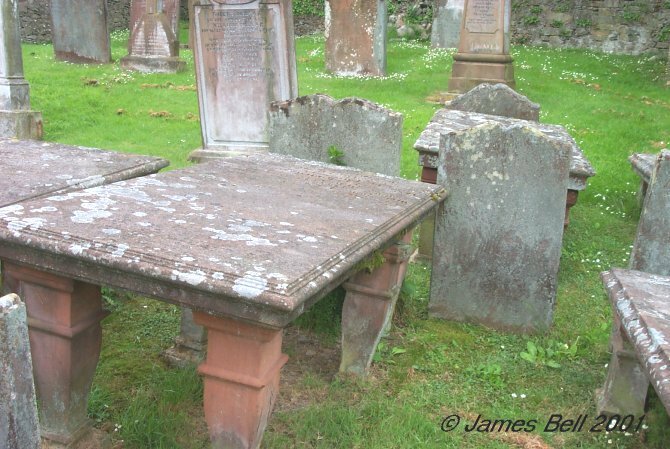 Also Janet McQuhir, her mother, wife of Alex'r McQuhir, late tenant in Bagbie, who died at Creetown 22nd Dec'r 1857, aged 62 years. Also Alex'r McQuhir, her husband, who died at Creetown 6th January 1860, aged 72 years. Also his son, John, who died at Spennymoor in the County of Durham, 2nd Dec'r 1872, aged 49 years. 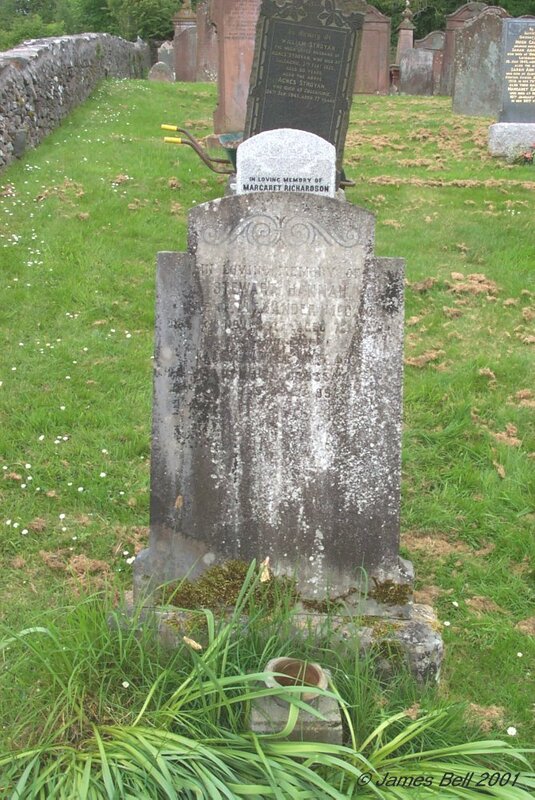 Also Mary McQuhir who died at Creetown 12th May 1873, aged 38 years. 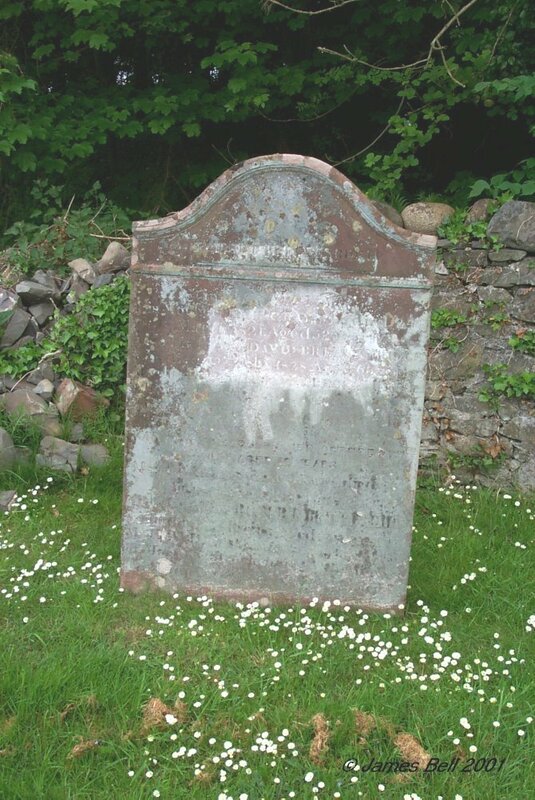 Reverse: Here lies the corpse of Marion McQuhir, daughter of Alexander McQuhir, who died Jan'y 8th 1791, aged 14 weeks. 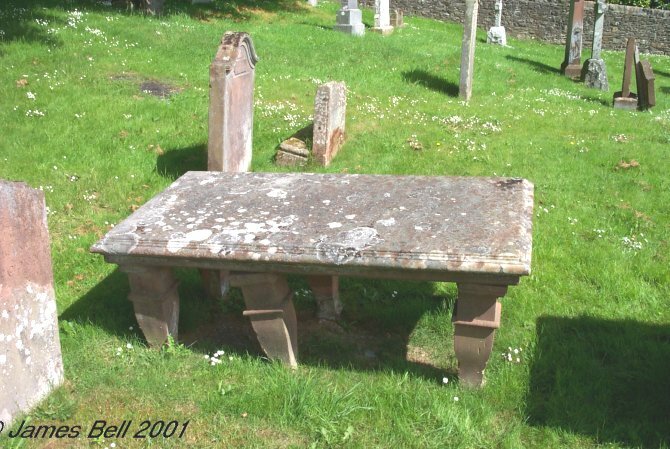 098 (Table) Erected by Roger McQuhir to the memory of Sarah Mitchell, daughter of Doctor Archibald Mitchell in Kirkcudbright, espoused successively to Thomas Bean Esq., of Auchenhay, and Roger McQuhay in Kirkoak, died 21st Aug. 1803. 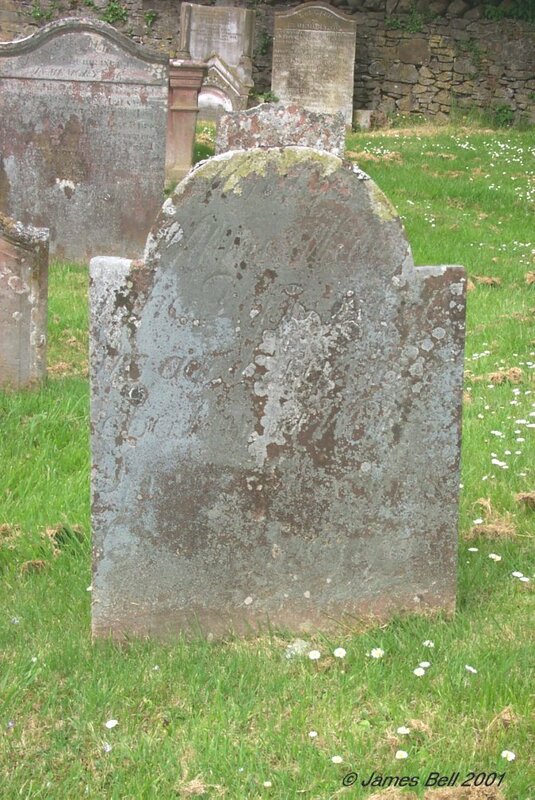 Also James, son to Roger McQuhir, who died 21st Feb. 1809, aged 29 years. And the said Roger McQuhir who died 23rd June 1816, aged 80 years. 099 (Behind table) Front: Erected in memory of Margaret Macquhir, daughter to Alexander Macquhir in Kirkeoak, who departed this life 17th March 1794, aged 15 years. And his son James, who died on 22nd Feb'ry 1803, aged 22 years. Also of John. his son, who died upon the 12th April 1804, aged 21 years. Also Jannet Brown, spouse of Alex'r Macquhir, who died Bagbie 19th Ayg't 1827, aged 89 years. 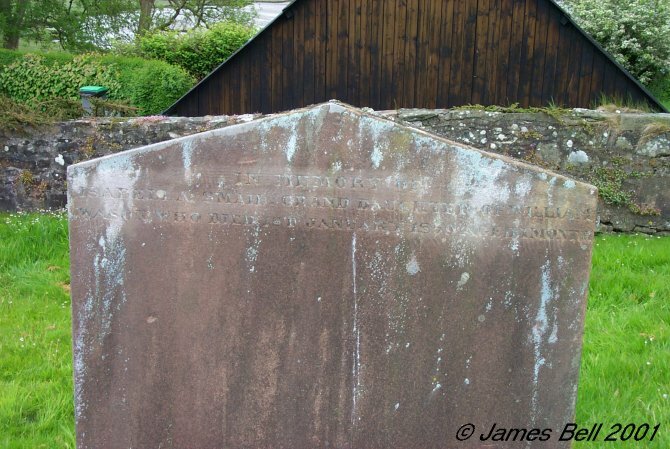 Rear: And the said Alexander McQuhir who died at Bagbie, 19th Aug't 1827, aged 89 years. 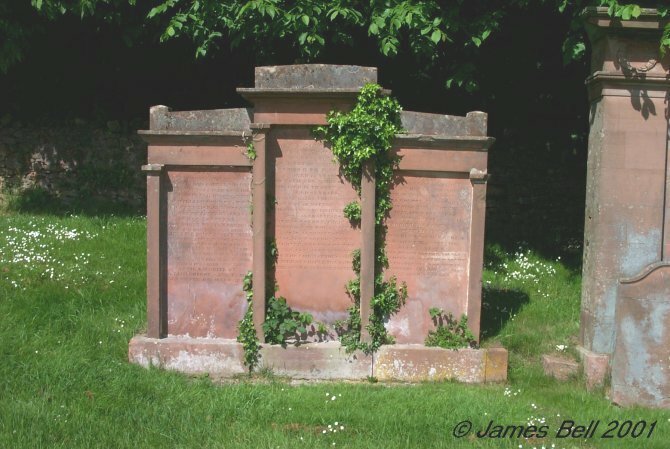 100 Erected by John McQuhir in memory of Isabel Sproat, his spouse, who died the 22nd of June 1784, aged 26 years. 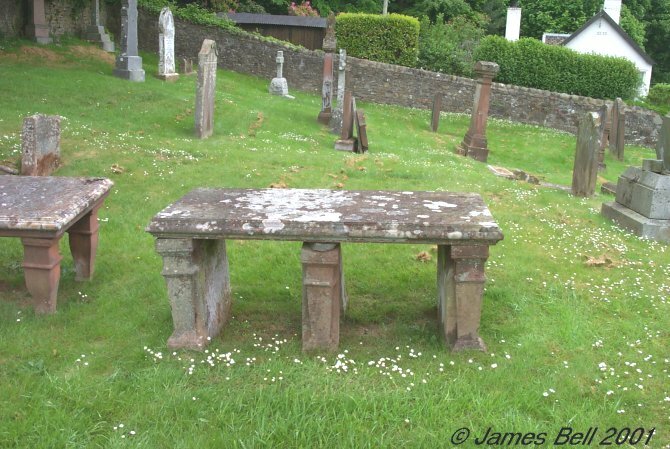 101 (Table) Sacred to the memory of Alexander Brown, who died at Muckleyett, in the Parish of Tongland, on the 22nd of Dec'r 1821, in the 86th year of his age. 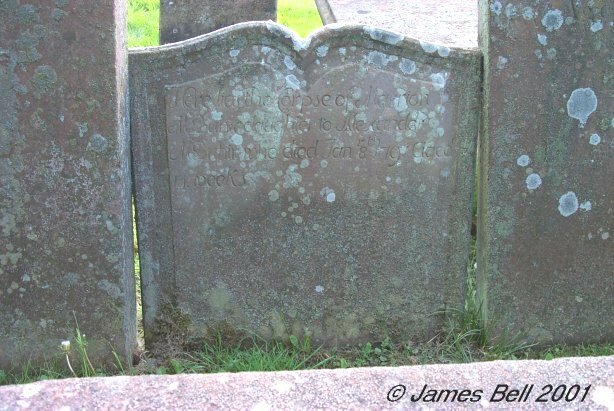 Also of Jane Burnie, his spouse, who died at Blackcraig on the 12th of January 1828, aged 78 years. Also of John, their son, who died 20th Aug. 1850, aged 71 years. 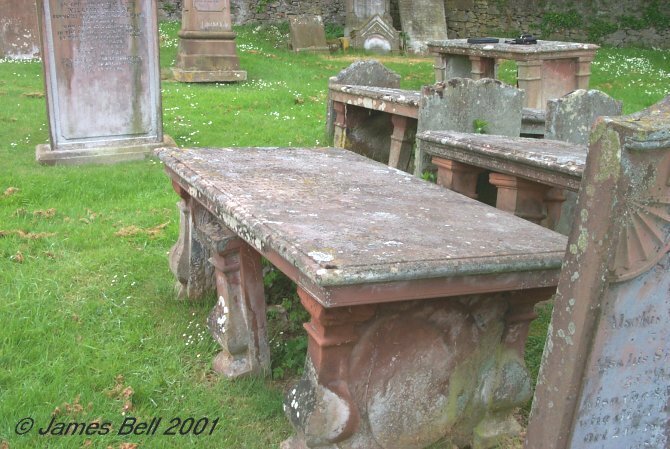 102 (Against Table) Erected by William Brown, Comstoun, in memory of Jean McKinnal, his spouse, who died Nov'r 5th 1771, aged 64 years. Also Thomas, John, Jean, Margaret, Agnes and Jean Brown, their children. 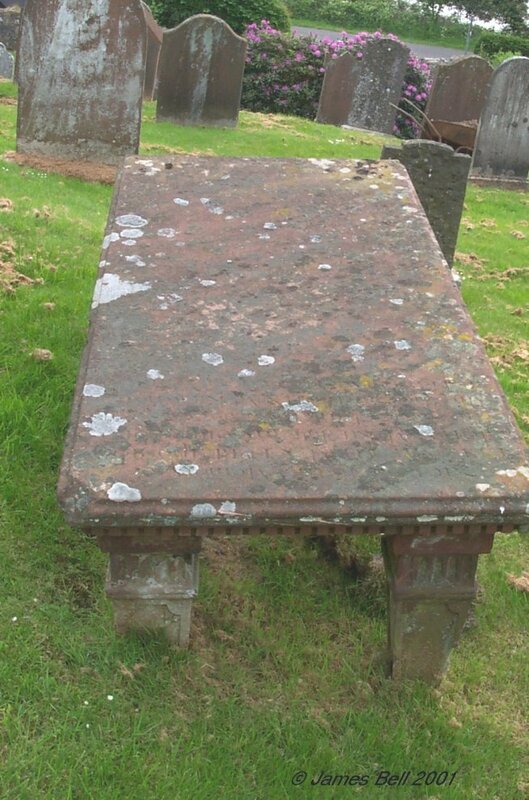 Also here lyse the corpse of William Brown, who died January 7th 1787, aged 86 years. 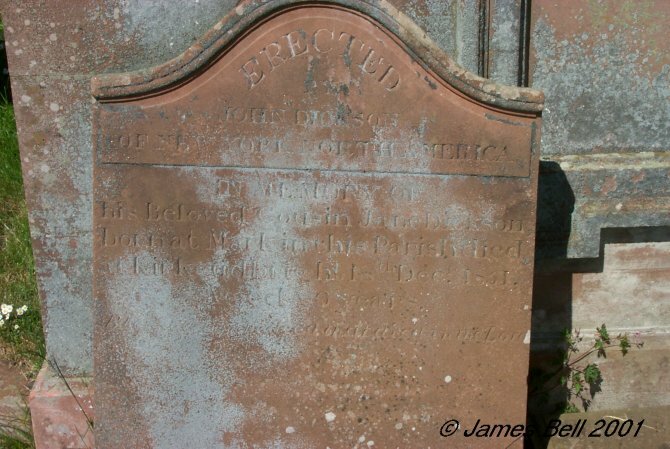 103 Sacred to the memory of James Brown, late in Dildawn, who died at Kirkcudbright on the 28th February 1816, aged 84 years. 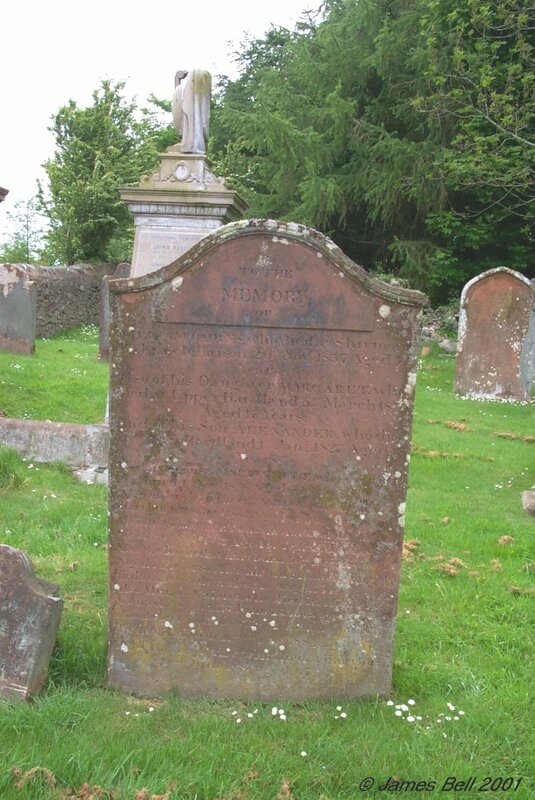 And of Margaret Burnie, spouse of the said James Brown, who died at Netherwood, in the County of Dumfries, the 4th day of April 1821, aged 86 years. Also John Brown, son of the above, who died at Lynchburg in the state of Virginia, North America, on the 11th day of April 1801, aged 28 years. And of William Brown, son of the above, and brother of the said John Brown, who died at Richmond, Virginia, on the 26th day of Dec. 1811, aged 46 years. Also of Irvin John Brown, grandson of the above, who died at Richmond, Virginia, on the 25th Dec. 1822, aged 30 years. Also Mary Brown, daughter of the above James Brown, who died at Laurieknow, Maxwelltown, on the 11th June 1819 (see below), aged 80 years. 2. 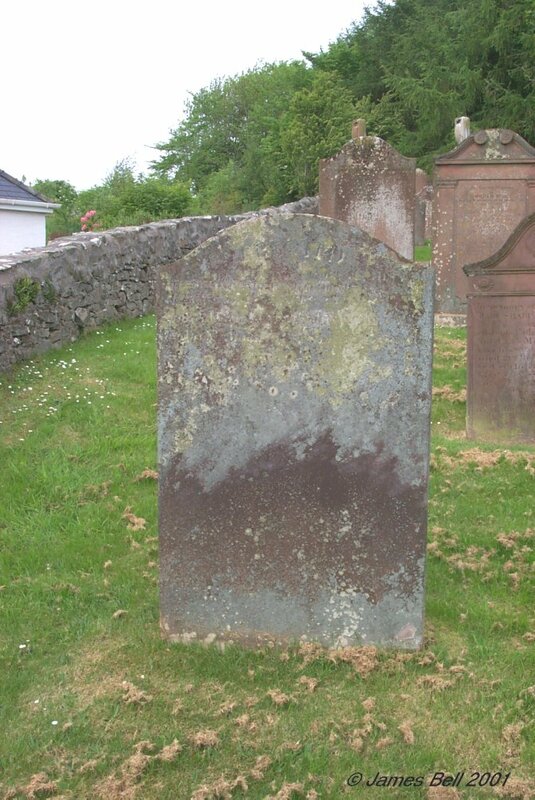 The following entry in the Wigtownshire Free Press issued on 22nd June 1849 help clarify an indistinct entry on the above stone: BROWN, Mary - Died 11/6/1849 - At Laurieknowe House, Maxwelltown, on the 11th inst., Miss Mary Brown, at the advanced age of fourscore and upwards. 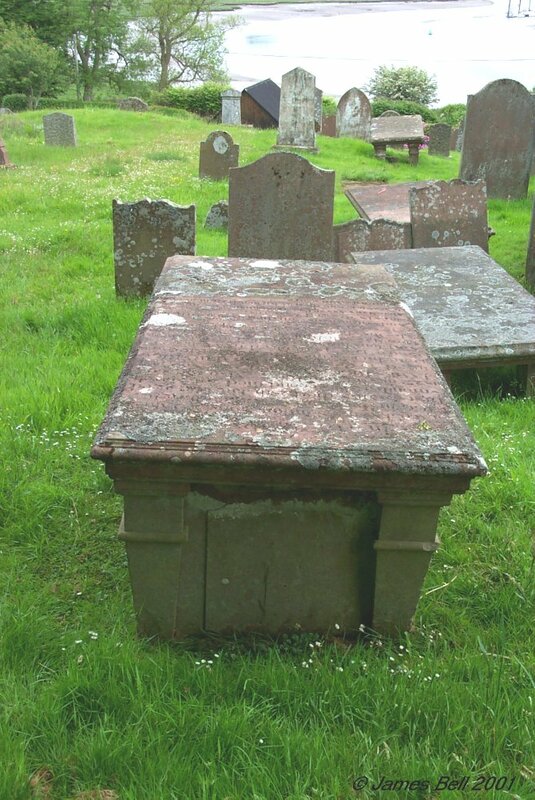 104 To the memory of William Cairns, who died at Shirmers, Balmaclellan on 20th Nov’r. 1837, aged 71 years. 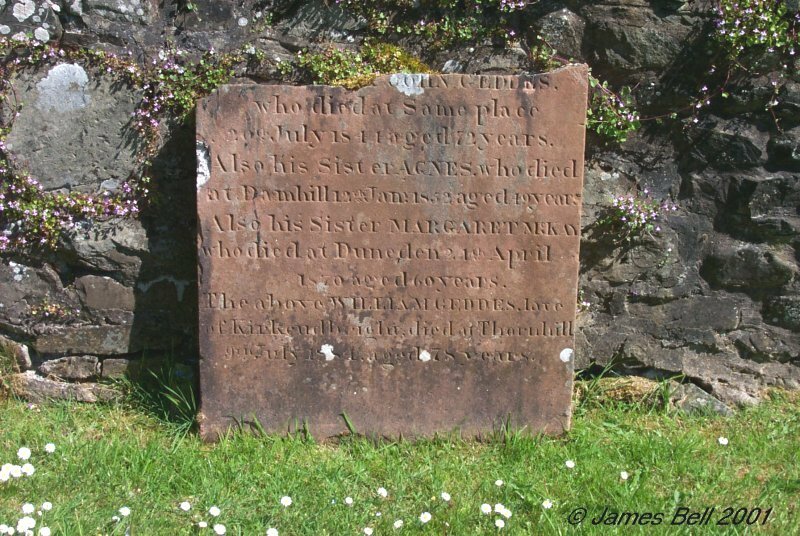 Also of his daughter Margaret, who died at Upper Hardland, 5th March 1816 aged 17 years. Also of his son Alexander, who died at Upper Hardland 1st Jan’y. 1827 aged 18 years. 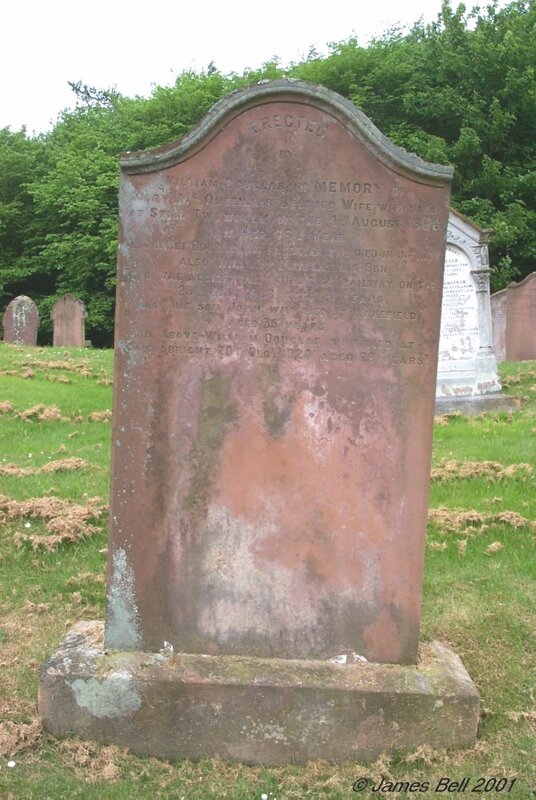 Also his spouse Marion McKie, who died at Hartburn, 1st Nov’r. 1856 aged 84 years. 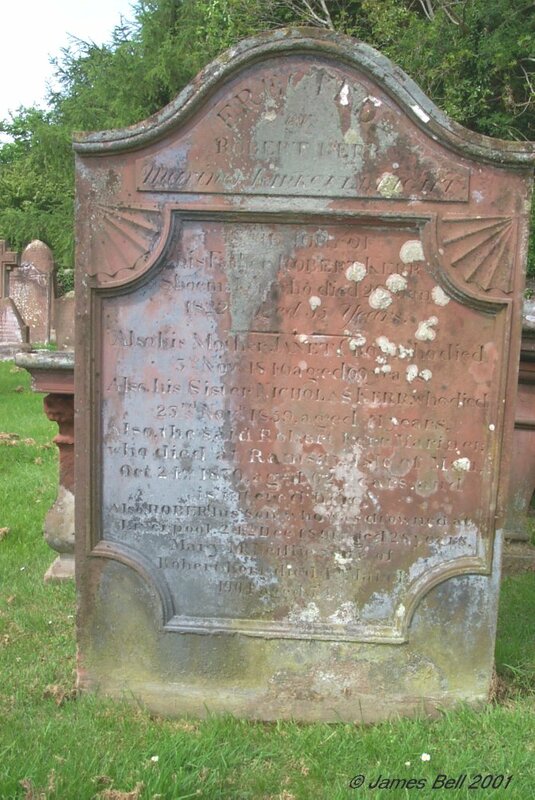 Also of his daughter, Marion, who died at Upper Hartburn, 11th Oct’r. 1867 aged 64 years. Also his son Robert, who died Guelph, Canada West, 29th Nov’r. 1867 aged 57 years. 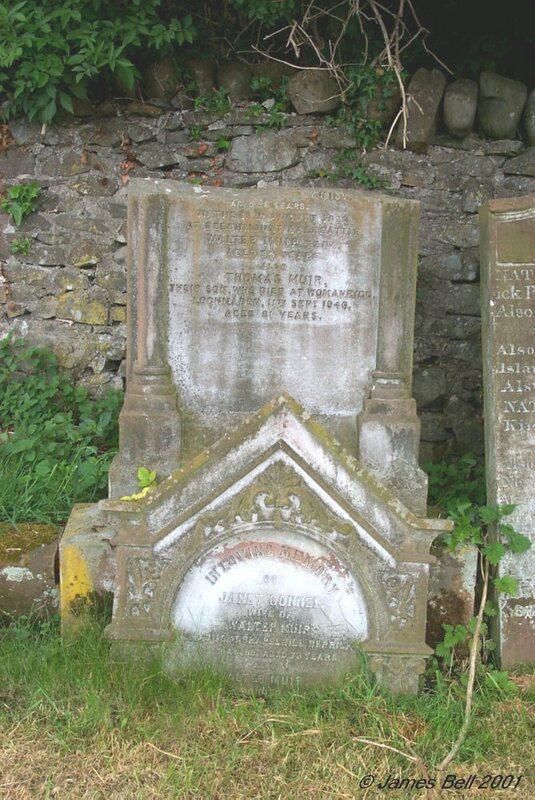 Also his son, Adam, who died at Hartburn, 30th Dec'r 1869, aged 74 years aged 74 years. 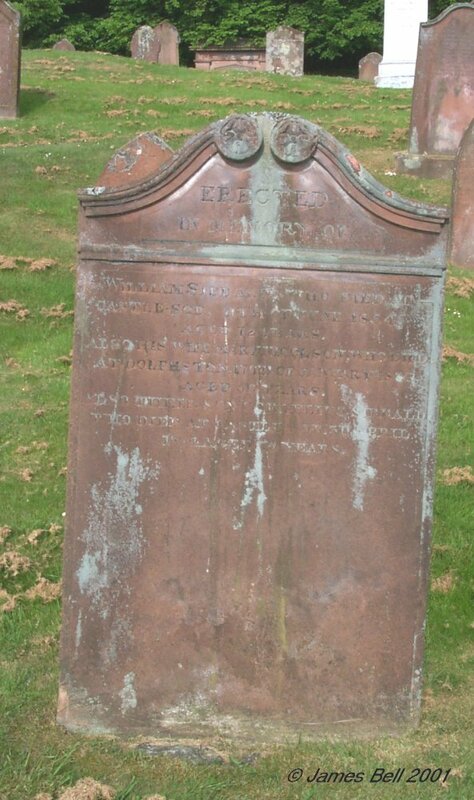 Also his wife Isabella Kid, who died Lasswade 27th Dec'r 1869, aged 74 years. Also Mungo Cairns, who died in Hibbert, Canada West, 25th June 1870, aged 77 years. 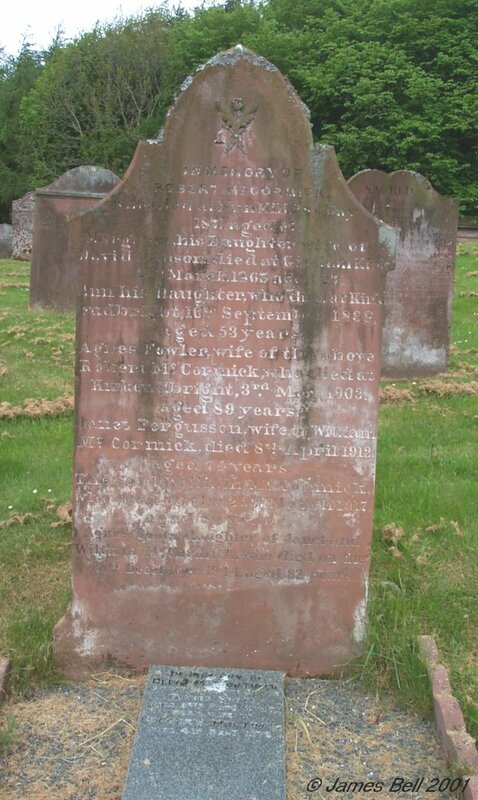 Also Helen Cairns, wife of R. Simpson, died at Hartburn, 9th Dec'r 1882, aged 70 years. 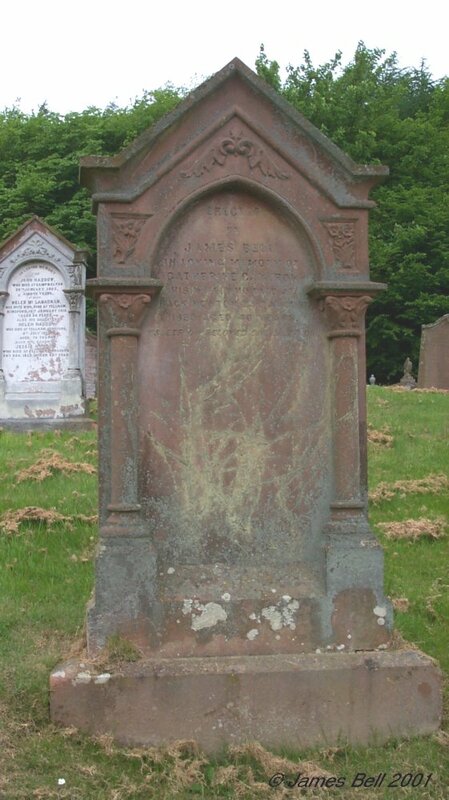 Also Charles Cairns, who died at Hartburn , 28th June 1883, aged 67 years. Reverse: Also of Janet Cairns, who died 18th July, 1884, aged 83 years. And William Cairns, who died 10th Sept'r 1887, aged 83 years. 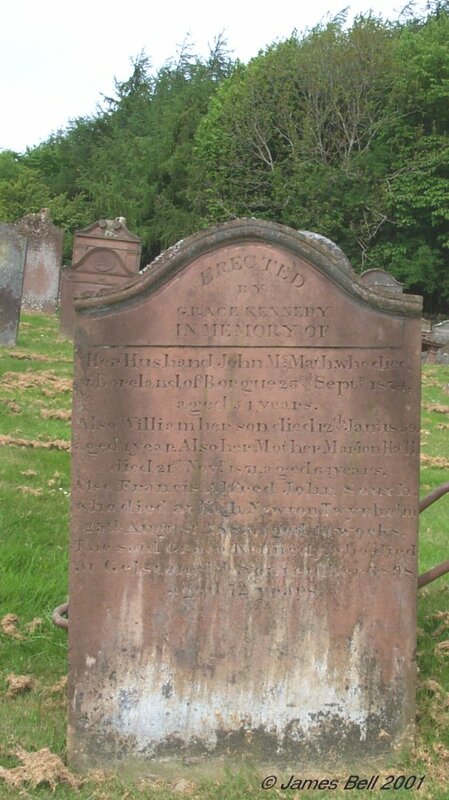 Reverse: Also John Mackie, their son, who died 5th June 1800, aged 32 years. 106 In memory of Peter Dickson, Master Mariner, drowned at sea 17th Dec’r. 1788, aged 59 years. Jean Candlish, his spouse, died 4th Sept'r. 1817, aged 78 years. Their children, Jean, died in infancy. Jean, died in infancy. Janet died 2nd Feb’y. 1794, aged 26 years. William, Master Mariner, died 15th Nov’r. 1802 on the voyage from Africa to the Island of Trinidad, West Indies, aged 32 years. Nicholas Black, died 5th June 1844, aged 81 years. Walter Dickson, died 9th Jan’y. 1855 aged 77 years. Margaret, died 17th June 1860, aged 84 years. Major John Birthwhistle, grandson of the above Peter Dickson, died at Cheltenham, 6th October 1867, aged 76 years. 107 In loving memory of Mary Isabella Miitchell, wife of James Finlay, who died at Ross, Borgue 25th Sep. 1911, aged 67 years. Also of the above James Findlay, who died at Ross, Borgue, 5th August 1915 aged 80 years. Also their daughter, Jean Margaret Findlay, who died at Craigville, Kirkcudbright, 27th Dec. 1944, aged 63 years. Also their son John Finlay, who died at Ross, Borgue, 16th March 1959, aged 80 years. And his wife Jean Broomfield Weir Ovens, who died at ‘Craigville’, Kirkcudbright l0th December 1979, aged 95 years. Also Isobel Patricia Broatch, wife of John Brian Finlay, who died 28th February 1985, aged 51 years. 108 In affectionate remembrance of John Finlay, who died at Ross, 21st July 1867, aged 71 years, and of James and John children of the above, who died in infancy. 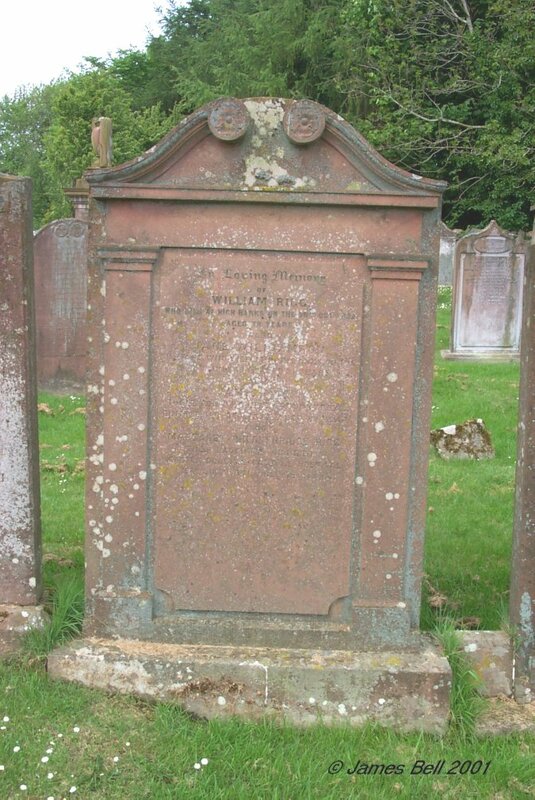 Also William Finlay, his son, who died 50th October 1868, in his 40th year. 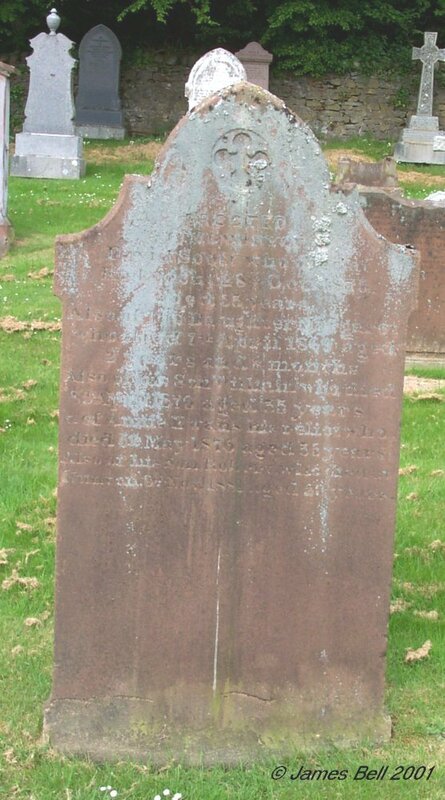 Also Susan Dickson, widow of the said John Finlay, who died at Dumfries, 2nd January 1890, aged 90 years. 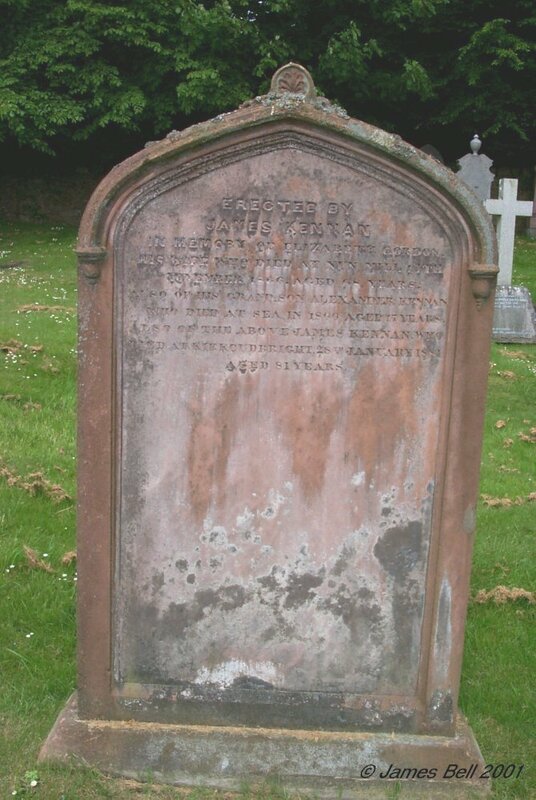 Also Janet Finlay, their daughter, who died at Bridge Bank House, Dumfries, 3d May 1896, aged 72 years. 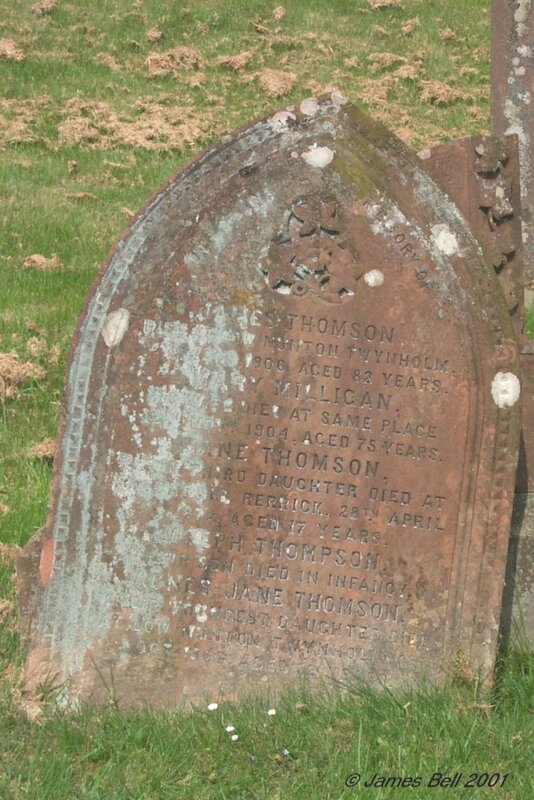 Also Thomas Dickson Finlay, their son who died at Burnscarth Green, Dumfries 13th October 1898, aged 67 years. Susan Finlay, their daughter, who died at Dumfries 10th Feb. 1918, aged 73 years. 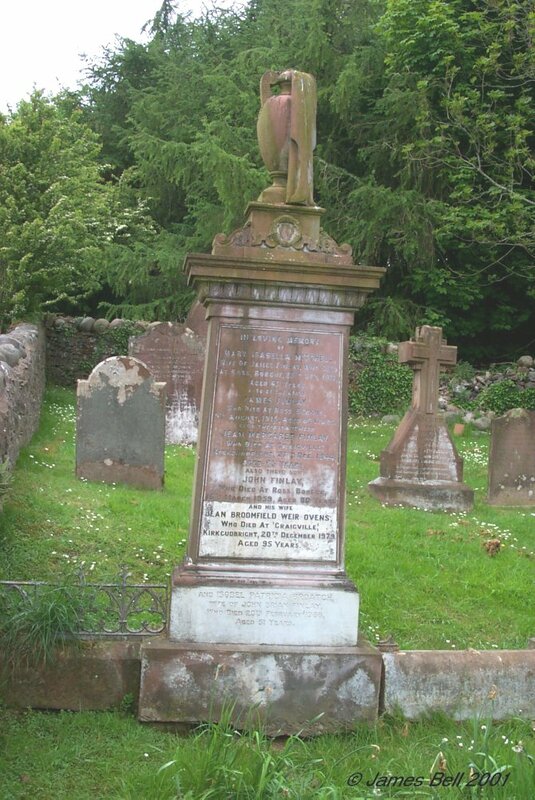 109 Erected in memory of Robert Millar, second son of the late William Millar, formerly farmer in Ardwall Mains, New Abbey, who died at Fishhouse, in the parish of Twynholm, on the 26th of February 1884, aged 72 years. 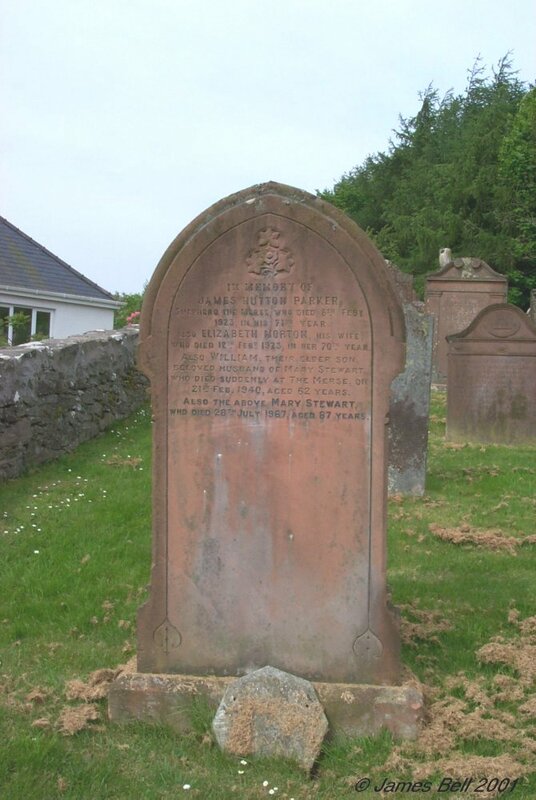 Also of his sister, Janet Millar, who died at Kirkcudbright on the 28th of August 1903, aged 87 years. 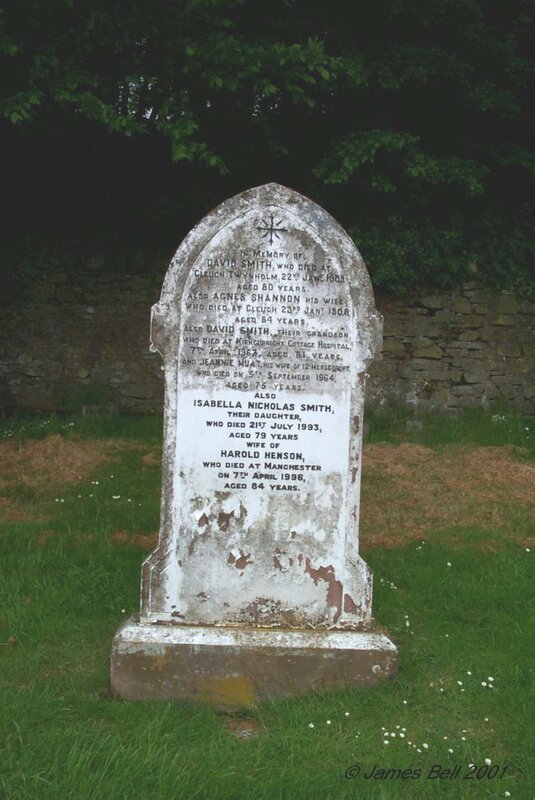 110 Erected to the memory of Thomas McClure, son of James McClure and Elizabeth Sproat in Castlesod, who died at Kirkcudbright the 2nd day of Nov'r 18--, aged - - years. Nicholas McClure, died 25th Dec'r 1847, aged 70 years. 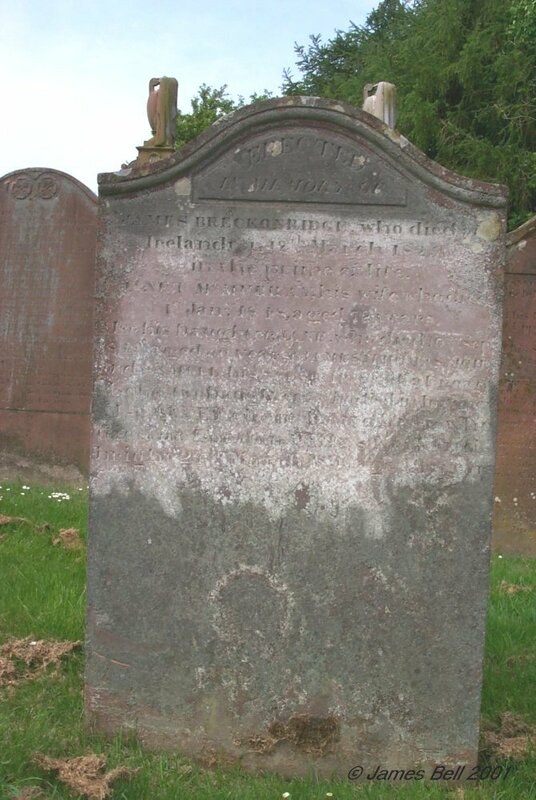 Reverse: And also the said James McClure, died 23rd Jan'y 1792, aged 52 years. 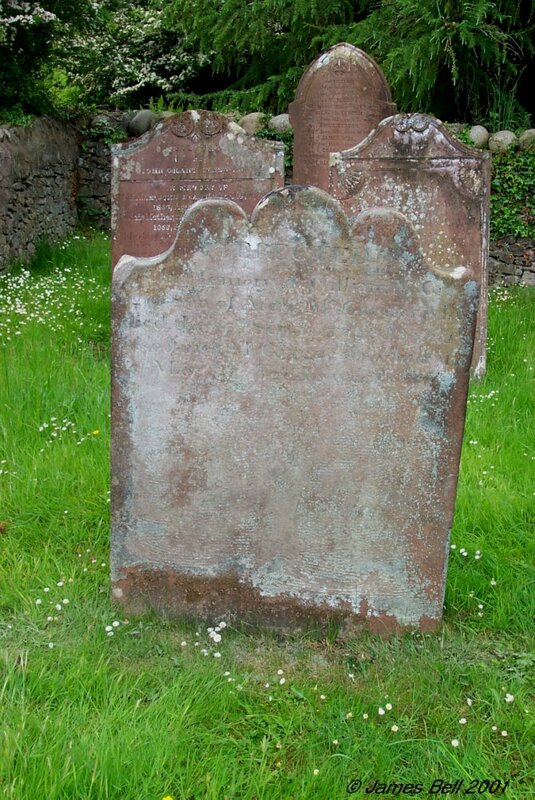 Likewise his son John, died 4th April 1794, aged 9 months. Also Elizabeth Sproat, his spouse, who died 28th February 1823, aged 72 years. 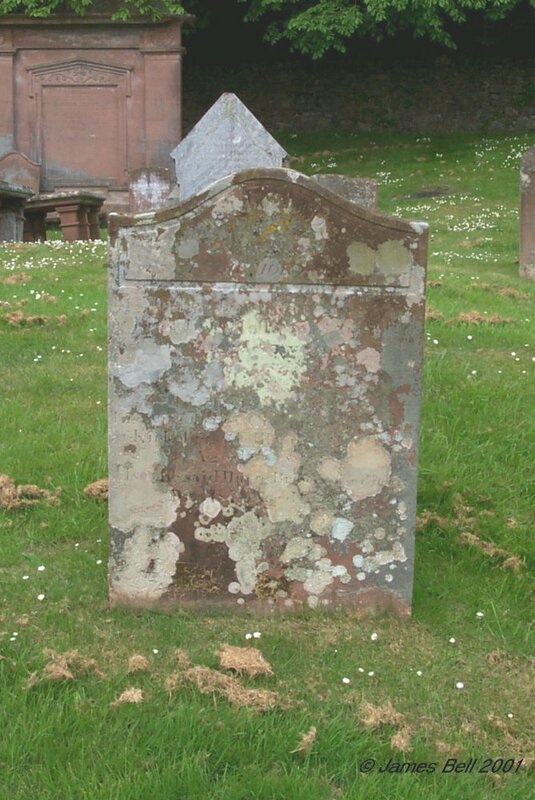 112 This stone is particularly badly encrusted with lichen, and a reading was not attempted. 113 Erected by Patrick Sproat in memory of his parents. 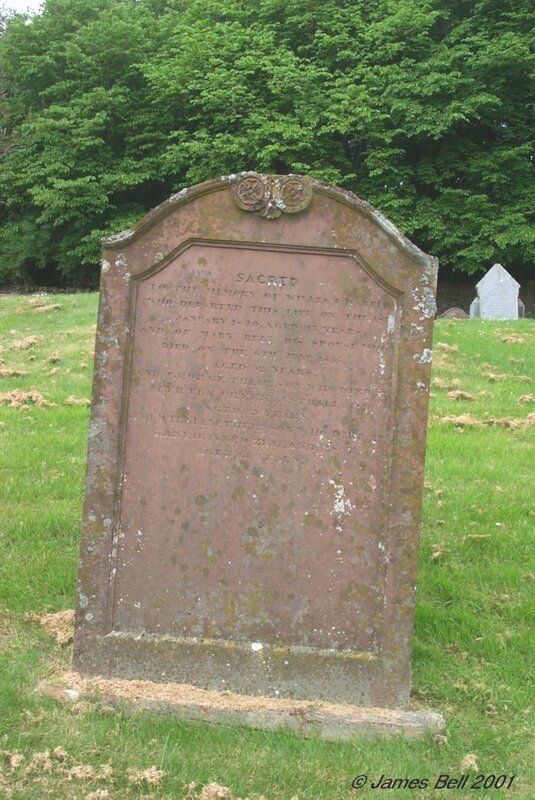 Here lyes the corpse of Patrick Rain, late in the Glibe& Nicklous McKie his spouse, as also the corpse of Thomas Sproat late in Compston, their son, and also Agnes Rain, his spouse. 115a This stone is broken, with only the lower section visible. Also W-- Sproat ------- at Appleton, Wisconsin, America, 20th August 1867, aged 37 years. Sons of the late David Sproat, Furbar, near Castle Douglas. 116 In memory of John Dickson who died at Park of Tongland in March MDCCXCII. aged LXXXVII years. Margaret Sproat, his wife who died there in March MDCCXCVII aged LIV years. Their daughter who died in childhood. James Dickson, Merchant in Liverpool, who died the XVIIIth July MDCCCXXVII aged LXIV years. Alex’r. 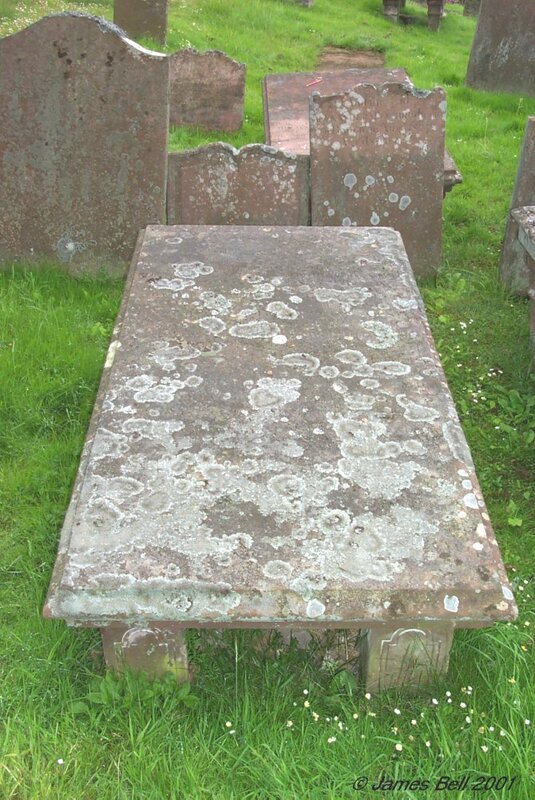 Dickson who died at Castle Douglas, XVIIth July MDCCCXXIX, aged LVII years. John Dickson, who also died at Castle Douglas, XIth March MDCCCXXXIII aged LXVII years. William Dickson Esquire, who died at Ringford XXIVth May MDCCCLXIV aged LXXXXIV years. Janet Barclay Dickson, died at Ringford, XIIIth April MDCCCLXV aged XLII years. 117 Erected by James Couper, in Bank, in memory of Jean Dickson, his spouse, who died June 24th 1786, aged 70 years. And the said James Couper who died Nov. 30th 1809, aged 82 years. And does decide their fate. And leaves us all distressed. Her soul she did resign. With which they could be stained. Also Margaret Gordon, spouse to John Dickson, who died the 29th day of March 1761. 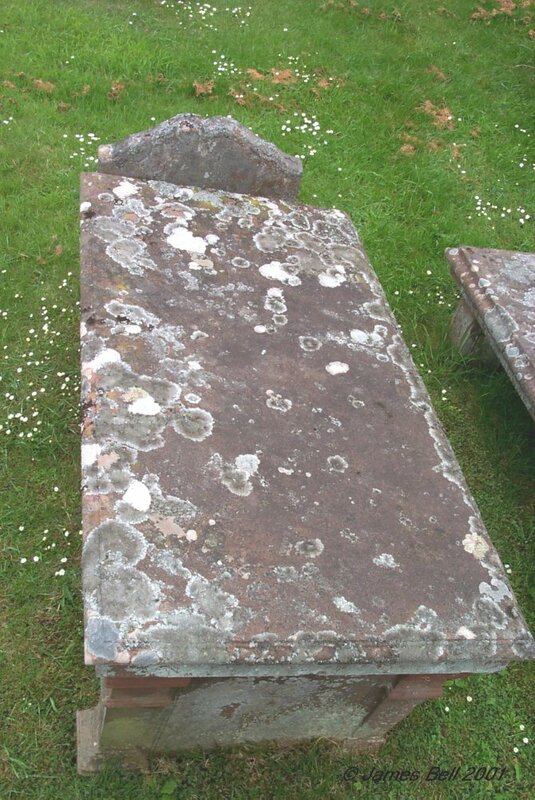 Also the corpse of said John Dickson, who died 3rd of March 1790, aged 86 years. Also Margaret Sproat, spouse to the said John Dickson, who died the 6 March 1797, aged 67 years. 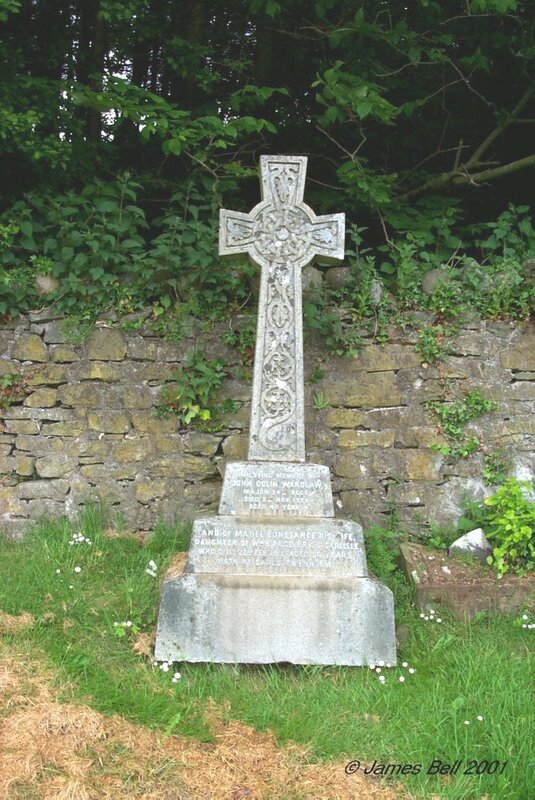 117b Erected by John Dickson of New York, North America, in memory of his beloved cousin Jane Dickson, born at Mark in this Parish, died at Kirkcudbright 18th Dec. 1851, aged 80 years. 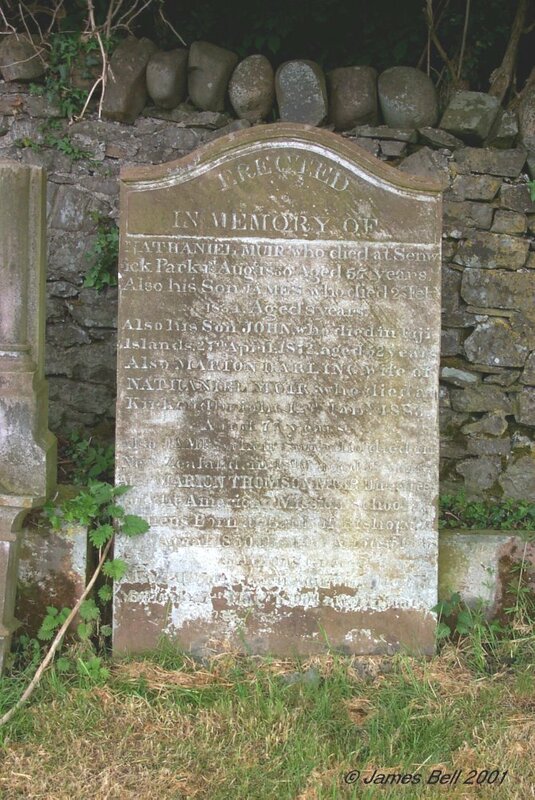 118 Centre: In memory of Thomas Gordon, of Trostrie, who died 14th July 1828, aged 88 years. 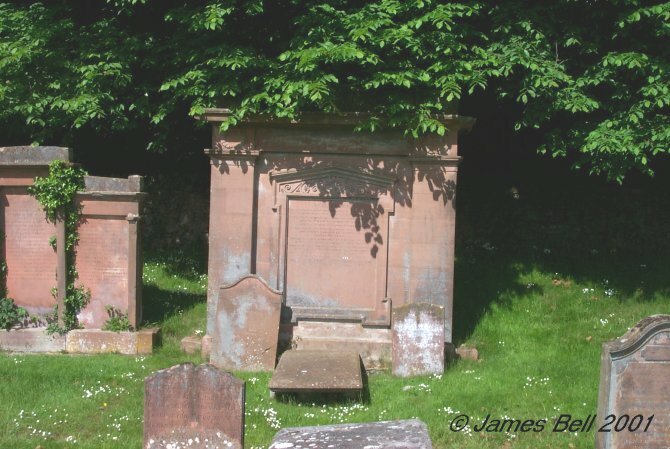 Also Janet McQuhir, his spouse, who died 11th June 1818, aged 75 years. And their son James Gordon, who died 17th Sept'r 1833, aged 62 years. 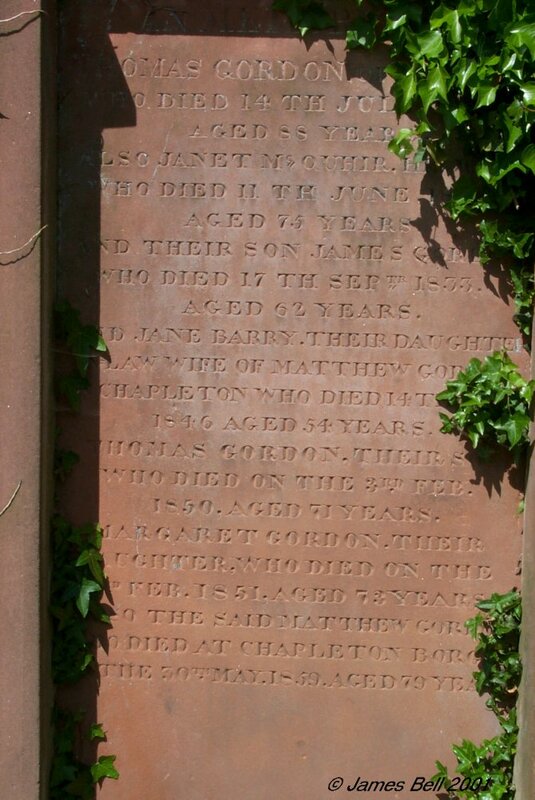 Also Jane Barry, their daughter-in-law, wife of Matthew Gordon, Chapleton, who died 14th Feb'y 1846, aged 54 years. 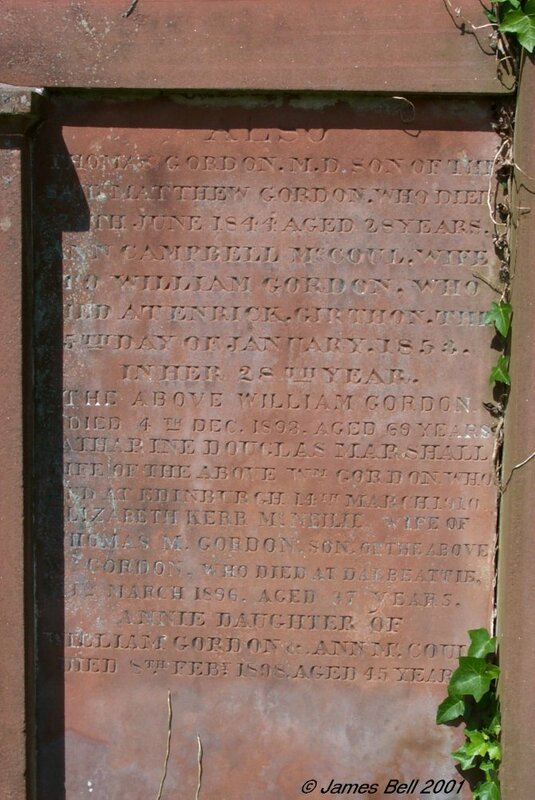 Thomas Gordon, their son, who died on the 3rd Feb. 1850, aged 71 years. Margaret Gordon, their daughter, who died on the 3rd Feb. 1851, aged 73 years. 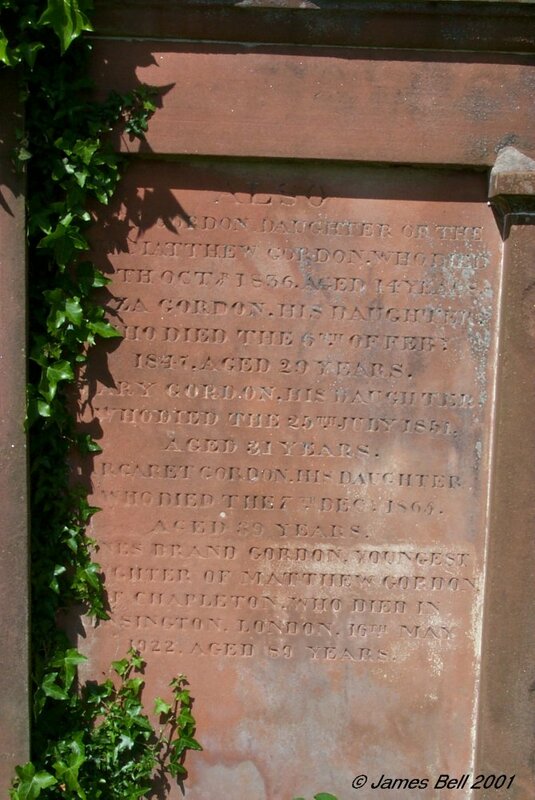 Also the said Matthew Gordon who died at Chapleton, Borgue, on the 30th May 1859, aged 79 years. Left: Also Thomas Gordon, M. A., son of the late Matthew Gordon, who died 28th June 1844, aged 28 years. 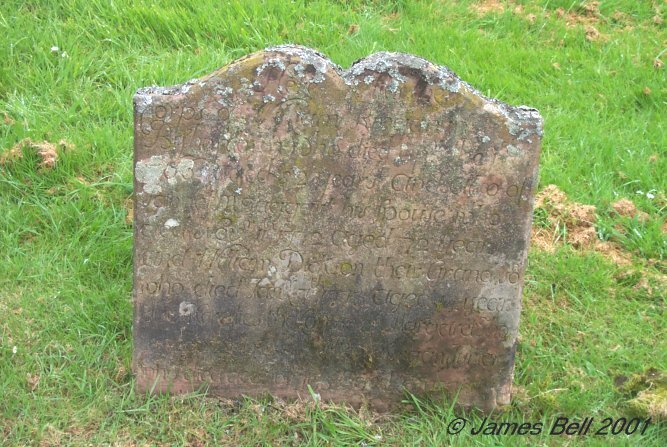 Ann Campbell McCoul, wife to William Gordon, who died at Enrick, Girthon, the 5th day of January 1853 in her 28th year. The above William Gordon, died 4th Dec. 1893, aged 69 years. Katherine Douglas Marshall, wife of the above William Gordon, who died at Edinburgh, 14th March 1910. Elizabeth Kerr McNeilie, wife of Thomas M. Gordon, son of the above Wm. 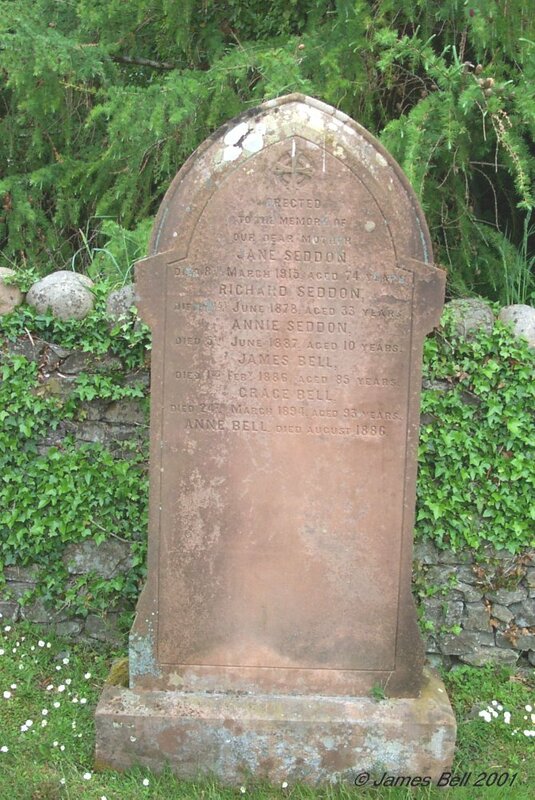 Gordon, who died at Dalbeattie, 13th March 1896, aged 37 years. 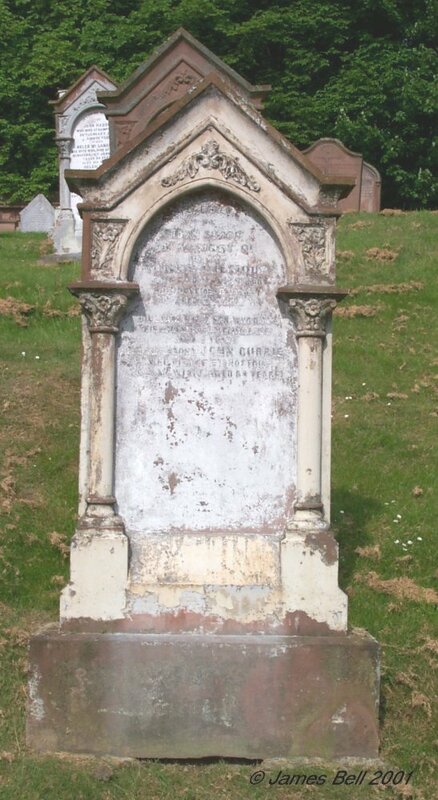 Annie, daughter of William Gordon and Ann McCoul, died 8th Feb'y 1898, aged 45 years. 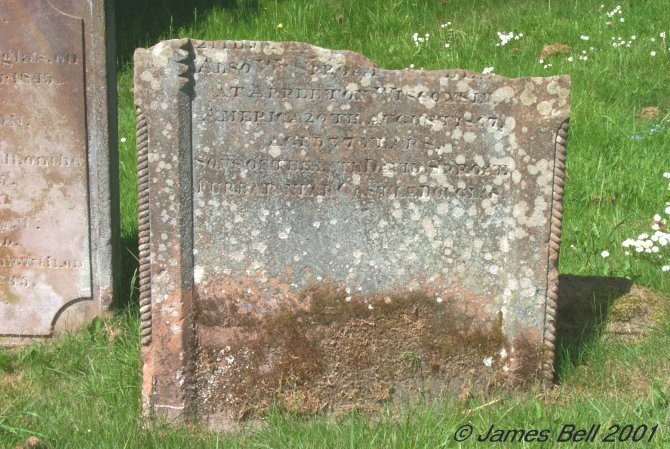 119 In memory of two James's, infant sons of James Rigg in Boreland of Kirkcudbright. 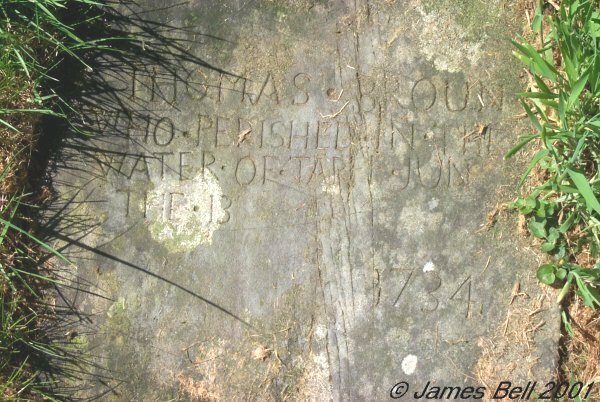 First James died 28th Jan. 1826, aged 8 months. The second died 21st March 1827, aged 1 month. Also the said James Rigg, who died 25th Nov. 1831, aged 39 years. Also Mary Rigg, daughter of the said James Rigg, who died 6th December 1836, aged 19 years. 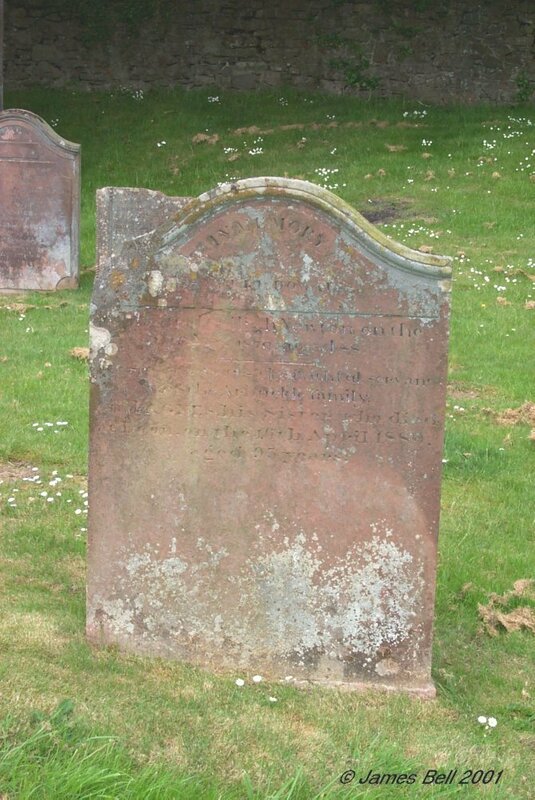 And John, his son, who died at Castle Douglas, 9th June 1844, aged 20 years. And William, his son, died 16th January 1850, aged 23 years. Also Mina, his daughter, who died 2nd July 1845, aged 22 years. 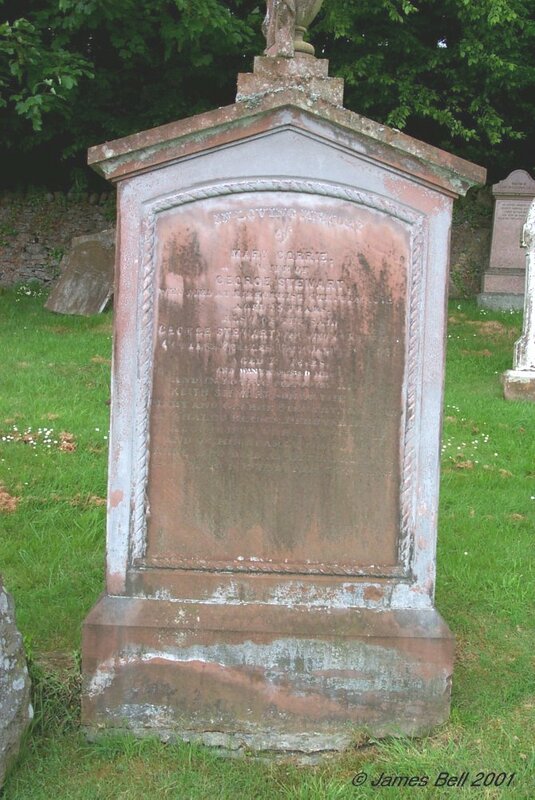 Also Mary Ann McClure, his spouse, who died at Kirkcudbright 24th August 1860, aged 70 years. 120 Sacred to the memory of Margaret Rigg, spouse to Thomas Stitt, Castle Douglas, who died 21st January MDCCCXLV, aged XXIV years. Blessed are the pure in heart. 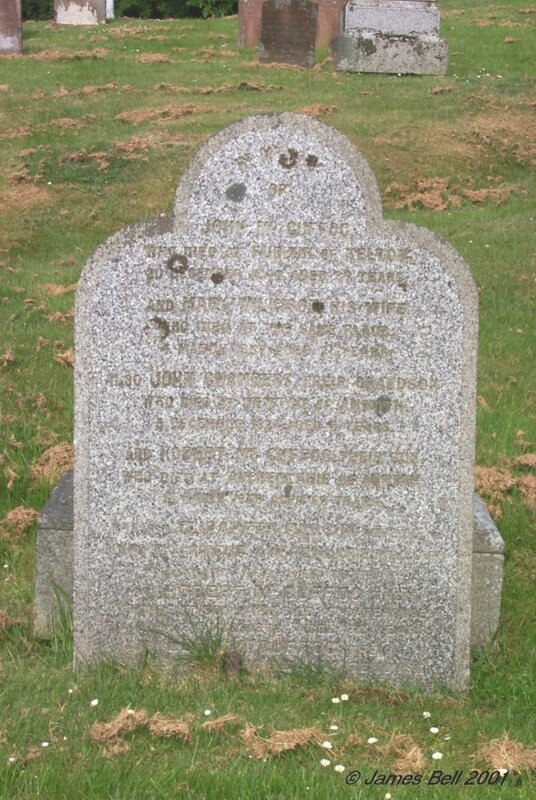 Also to the memory of the said Thomas Stitt, Castle Douglas, who died 2nd June MDCCCLXXIII, aged LXVIII years. Also Mary Stitt, their only child, who died 28th Feb'y 1849, aged 5 years. 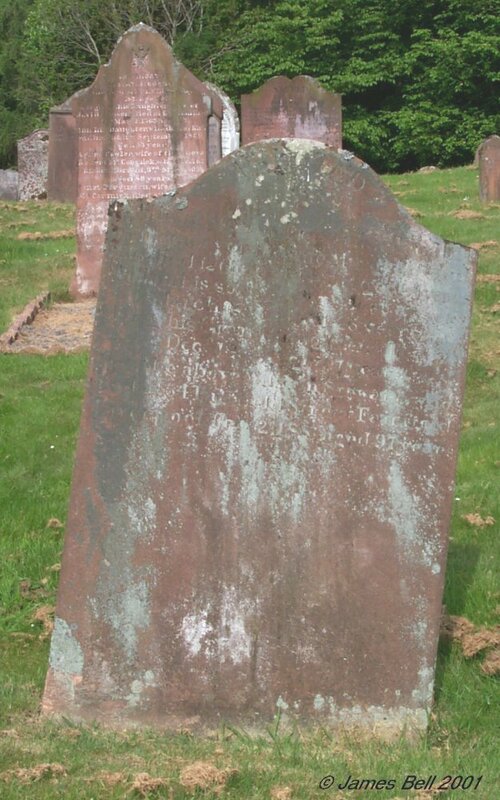 The final section reads: The above James Shennan, died at Kirkcudbright 25th June 1874, aged 54 years. 122 Sacred to the memory of the third son of George Stewart Esq., born on the 5th November and died on the 15th November, 1849, at Kirkchrist House. Of such is the kingdom of God. Luke XV111, 16. 123 Sacred to the memory of Mary Stewart Gordon, daughter of John Blair, 102nd Fusiliers, born at Lucknow 21st April 1869, died at Kirkchrist House 31st December 1870. Suffer little children to come unto me, and forbid them not for of such is the kingdom of God. 124 Erected in memory of William McGregor, son of Arch'd McGregor, who died the 27th Sep. 1823 aged 9 years. Also Janet McGregor who died the 5th May (blank) aged 9 years. 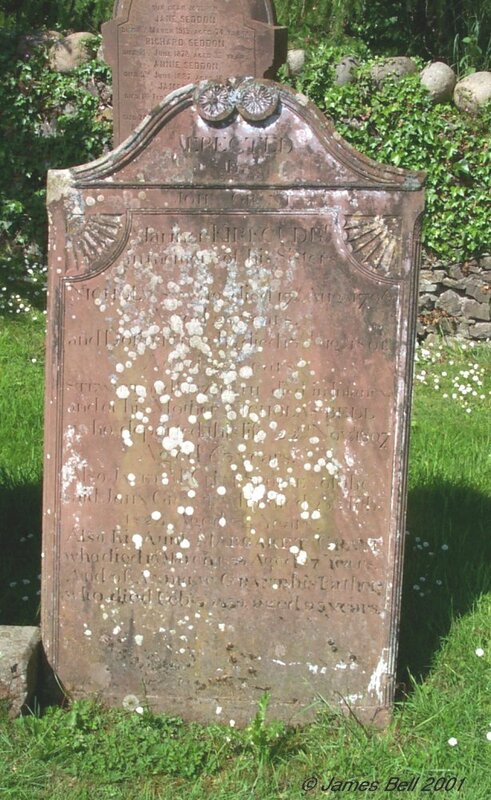 Reverse: In memory of Samuel McGrigeor, son to David McGrigeor, who died June 29th 1795, aged 8 months. 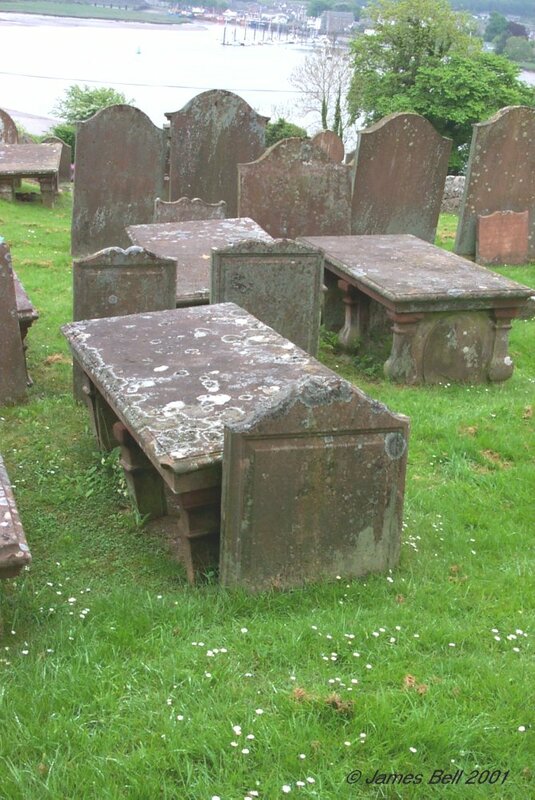 125 Here lyes the body of Margrat Stansford of Kil, who departed this life ye 16th day of April 1742, aged 62 years. 126 Erected by John Grant of New-York in memory of his father, John Grant, who died 15th June 1856, aged 69 years. Also his mother, Jane McMinn, who died 29th May 1859, aged 66 years. 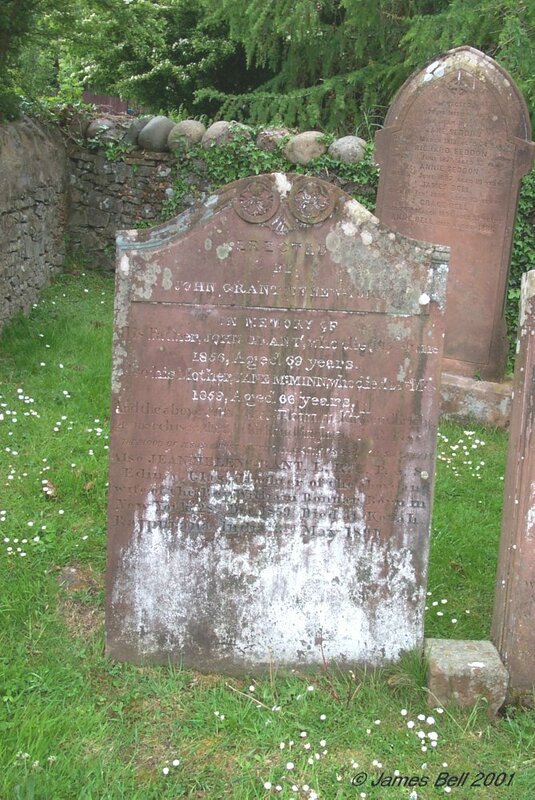 Also the above John Grant, born at Kirkcudbright, 21st March 1833, died at Kirkcudbright 26th Jan. 1888. The blood of Jesus Christ his son shall save us from all sin. John 1-7. Also Jean Helen Grant, L.R.C.P. and S. Edin. & Glas., daughter of the above and wife of the Rev. William Bonnar, born at New-York, 28th Dec. 1859, died at Kotah, Rajputana, India, 3rd May 1891. 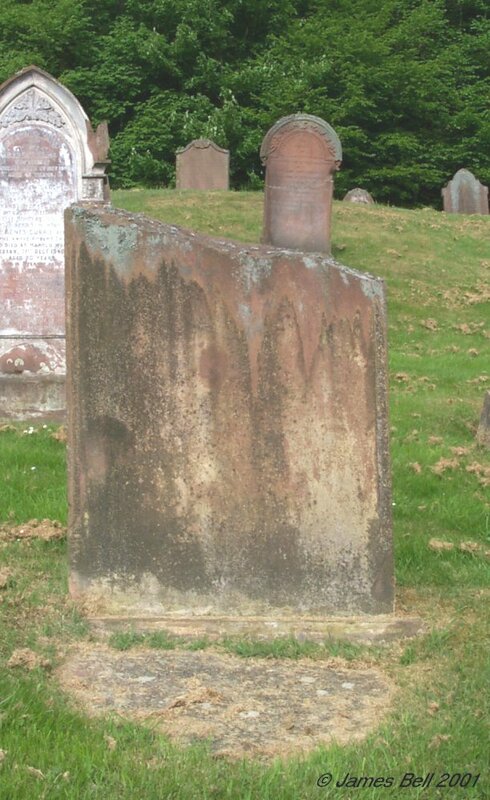 127 Erected by John Grant, Mariner, Kirkcudbr'. in memory of his sisters Nicholas who died 17th Aug. 1796, aged 25 years, and Dorothy who died 13th Aug. 1801, aged 22 years. Stewart and Elizabeth died in infancy. And of his mother Nicholas Bell who departed this life 22nd Nov. 1807, aged 63 years. 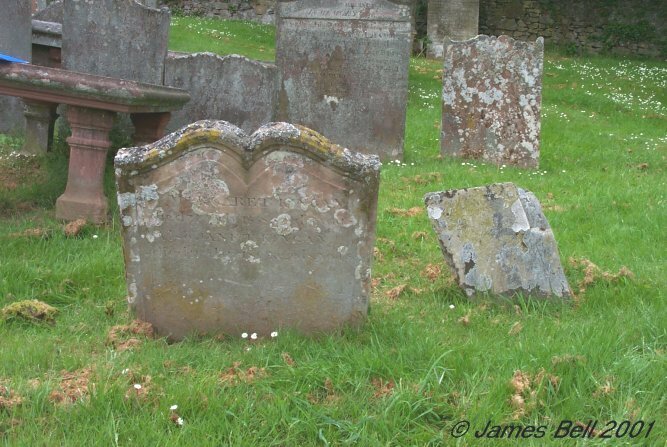 Also Janet McClune, spouse of the said John Grant, who died 25th Feb. 1824 aged 34 years. Also his aunt Margaret Grant, who died 16th March 1836, aged 87 years. And of Andrew Grant his father, who died Feb. 3rd 1839, aged 93 years. 129 Erected to the memory of our dear mother Jane Seddon, died 8th March 1915, aged 74 years. Richard Seddon, died 21st June 1878, aged 33 years. Richard Seddon, died 21st June 1878, aged 33 years. Annie Seddon, died 5th June 1887, aged 10 years. James Bell, died 1st Feb. 1886, aged 85 years. Grace Bell, died 24th March 1894, aged 93 years. Anne Bell, died August 1886. 130 Erected by Robert Breckanridge in memory of his mother Jane Gray, who died 24th March 1821, aged 52 years. Also his father David Breckanridge, who died 19th Feb. 1828, aged 66 years. Also his daughter Jane Breckanridge, who died 9th Sep. 1847, aged 28 years. Also Janet Henry, his wife, who died 18th July 1865, aged 67 years. Mary, their daughter, died October 25th 1866, aged 33 years. Also Charles, their son, who died 1st August 1877, aged 17 years. Also the above Robert Brackenridge (sic) who died 12th Dec'r 1878, aged 79 years. Also David Blackie, his son-in-law, husband of Margaret Brackenridge, who died at Sandside Cottage, 26th July 1885, aged 74. 131 In loving memory of Isabella Muir, wife of the late Robert Geddes, who died at 61 Millburn Street, Kirkcudbright, 3rd April 1925, aged 84 years. 132 In loving memory of Janet Connel, wife of Walter Muir, who died at Chapelhill, Rerrick, 18th May 1901, aged 73 years. Also Walter Muir, their son, who died at Mullock ---- 1913, aged 46 years. On the 19th August 1923 at Beechmount, Dalbeattie, Walter Muir Senr, aged 95 years. 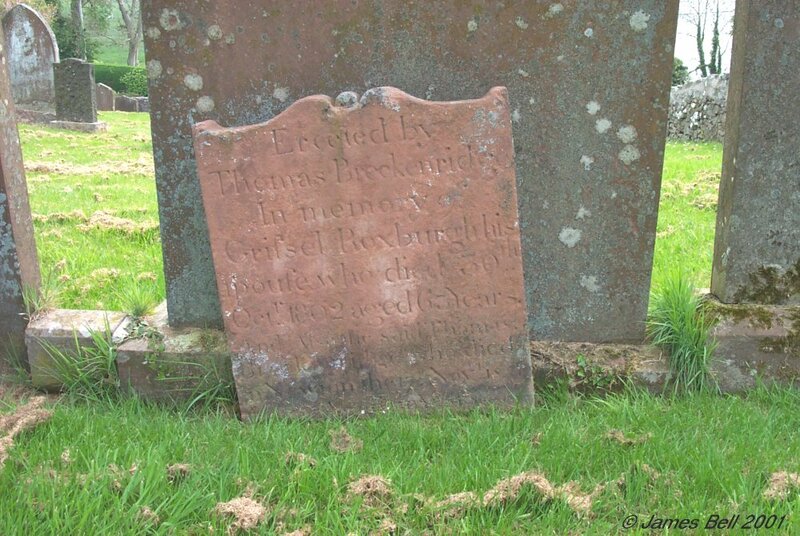 Also Thomas Muir, their son who died at Womanrigg, Lochmaben, 11th Sept. 1946 aged 81 years. 133 o died at Senwick Park, 1st Aug’t. 1850 aged 57 years. 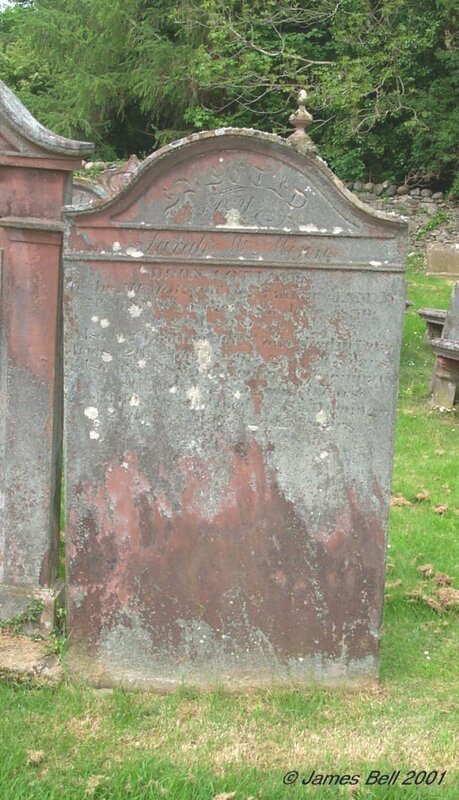 Also his son, James who died 2nd Feb. 1834, aged 8 years. Also his son, John who died in Fiji Islands 27th April 1872, aged 32 years. 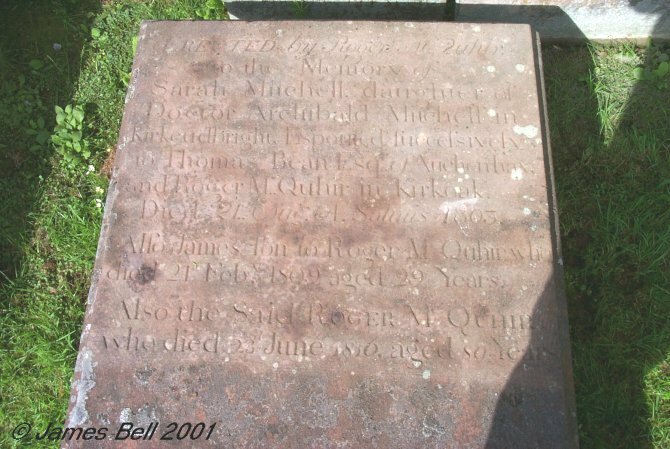 Also Marion Darling, wife of Nathaniel Muir, who died at Kirkcudbright, 12th Jan’y. 1883, aged 77 years. Also James their son who died in New Zealand, in 1890 aged 52 years. Also Marion Thomson Muir, Directress of the American Mission School at Athens, born at Bank of Bishopton 27th April 1830, died 15th August 1898, at Athens, Greece. Also Thomas their son who died at Mullock, 27th March 1904, aged 71 years. 134 Erected by James Wilkinson, in memory of his father Daniel Wilkinson who died at Nunmiln, 26th Oct. 1862 aged 62 years. Also his brother, Alexander, who died at Calcutta, 17th Nov’r. 1859 aged 21 years. The said Ja’s. Wilkinson died at Calcutta, 19th April 1879 aged 49 years. Also Henry, his brother, who died near Preston, 9th March 1892 aged 54 years. Also Agnes Crosby, wife of the above Daniel Wilkinson, who died at Borgue Village 8th January 1895 aged 88 years. 135 In memory of John Wilkinson, tenant in Nunmill, who died there 4th April 1930, aged 73. 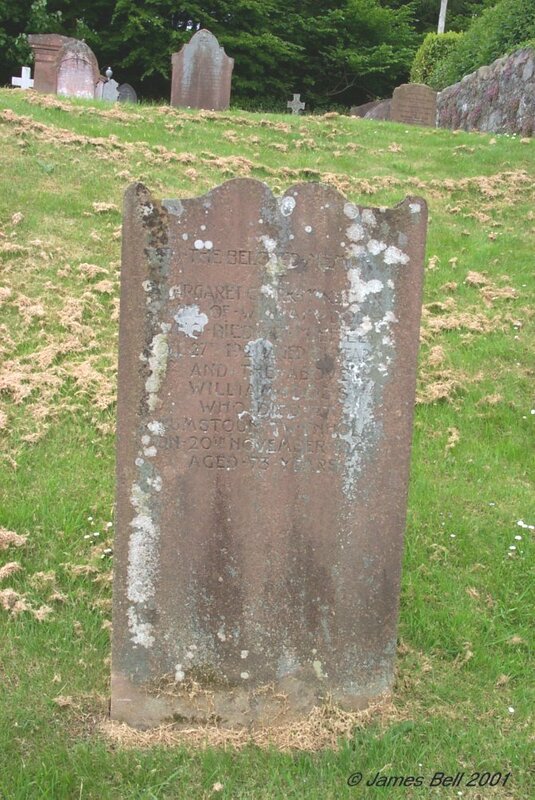 James Wilkinson, tenant in Nunmill who died at Dumfries, 5th October 1930, aged 75 years. 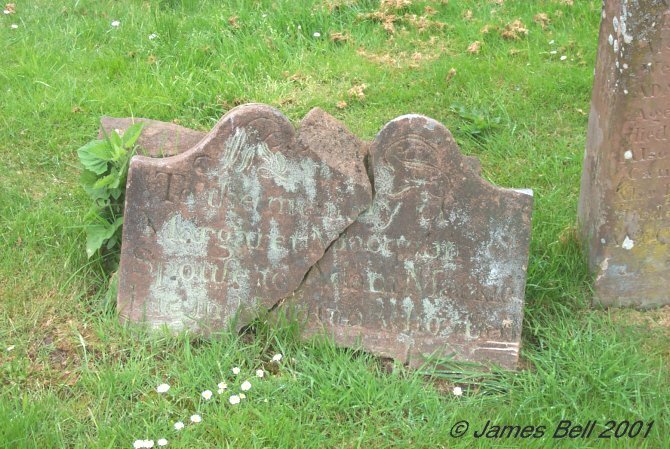 Their sister, Agnes who died at Dumfries 30th January 1911, aged 62 years, and Janet who died at Nunmill, 27th November ---------. John Wilkinson their grand-father and Solomon Wilkinson their great-grandfather, all tenants in Nunmill. 136 In loving memory of James Dalrymple, Hay, Stewart. Died May 23rd 1914, at Whyte-Knowe, Peebles. Until, the day break and the shadows flee away. 137 In loving memory of Mary Corrie, wife of George Stewart who died at Kirkchrist, 4th July 1872, aged 55 years. 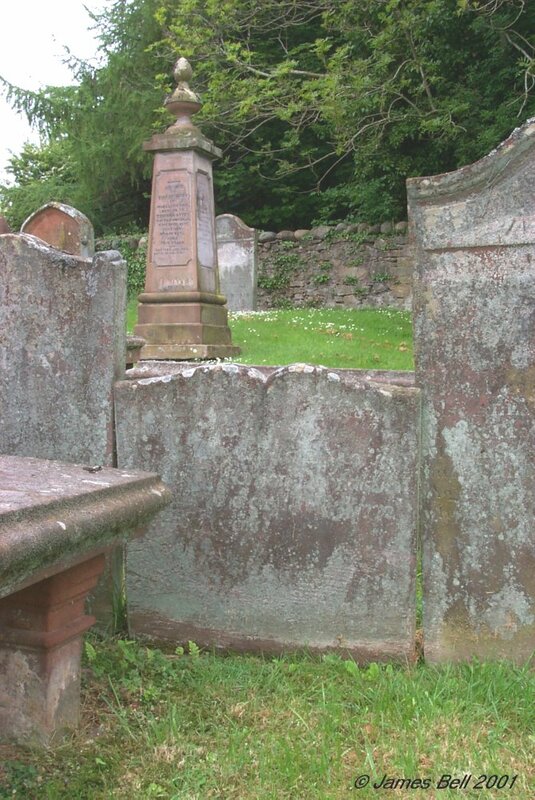 Also of the said George Stewart, who died at Kerfield Cottages, Peebles, 13th January 1893 aged 78 years. And is interred here. And in loving memory of Keith Stewart, son of the said Mary and George Stewart who died at Whaley Bridge, Derbyshire, 11th August 1938 in his 86th year. And of his dearly loved wife Anne, who died at Lytham, Lancs., 24th March 1937, in her 76th year. 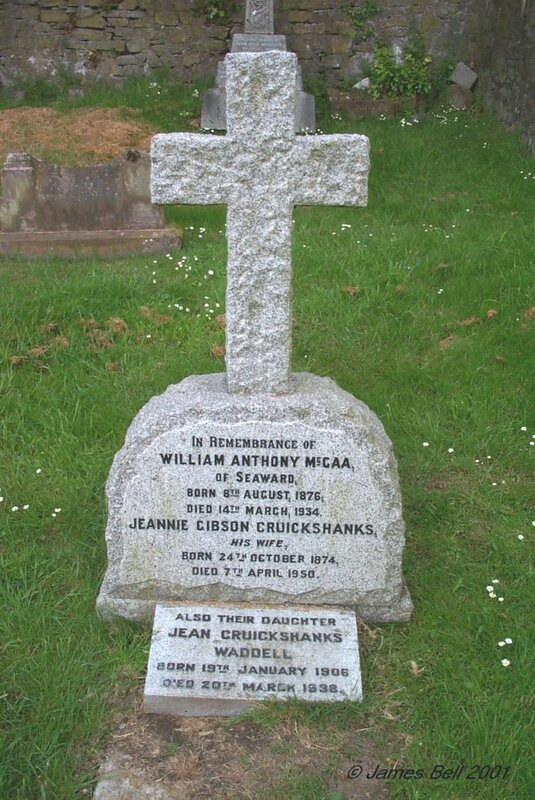 138 In remembrance of William Anthony McCaa, of Seaward, born 8th August 1876, died 14th March 1934. Jeannie Gibson Cruickshanks, his wife, born 24th October 1874, died 7th April 1950. Also their daughter Jean Cruickshanks Waddell, born 19th January 1906, died 20th March 1998. 139 Only the base of this stone remains visible, with no inscription. 140 In memory of David Smith, who died at Cleuch, Twynholm, 22nd January 1905, aged 80 years. Also Agnes Shannon, his wife who died at Cleuch 23rd Jan’y. 1908 aged 84 years. Also David Smith, their grandson who died at Kirkcudbright Cottage Hospital 7th April 1963, aged 81 years. And Jeannie Muat, his wife, of 12 Mersecroft, who died on 5th September 1964 aged 75 years. Also Isabella Nicholas Smith, their daughter, who died 21st July 1993, aged 79 years, wife of Harold Henson, who died at Manchester on 7th April 1996, aged 84 years. 141 In loving memory of James Robertson, Redfield died 27th April 1916 aged 71 years. Also Janet King, his wife died at Nether Mains, Twynholm, 7th March 1927, in her 88th year. 142 In loving memory of Flora Irving, beloved wife of William Hiddleston, who died at Kirkchrist Cottage, 10th Jan. 1918, aged 65 years. Also the above William Hiddleston, who died at Kirkchrist Cottage, 10th April 1928, aged 80 years. 143 In loving memory of Elizabeth Gibson, beloved wife of John Cruickshank, Kempleton, died 4th August 1912, aged 62 years. Also Sarah, daughter of the above died 17th December 1922, aged 43 years. The above John Cruickshank, who died at Glenald, on the 11th April 1930, aged 84 years. Also Elizabeth Cruickshank, daughter of the above John Cruickshank, who died at Glenald, on 28th Dec. 1945, aged 71 years. 144 Erected by James McCartney and family in loving memory of Jeanie Gibson, wife of James McCartney, who died at Kirkeoch, 16th April 1906, aged 60 years. 145 In loving memory of John Colin Wardlaw, Major, 34 Regt. died 9th Nov. 1905, aged 49 years. And Mabel Constance, his wife, daughter of Wm. B. Pace. F.R.C.S. Carlisle, who died 20th Feb. 1918 aged 56 years. Both at Largs, Twynholm.